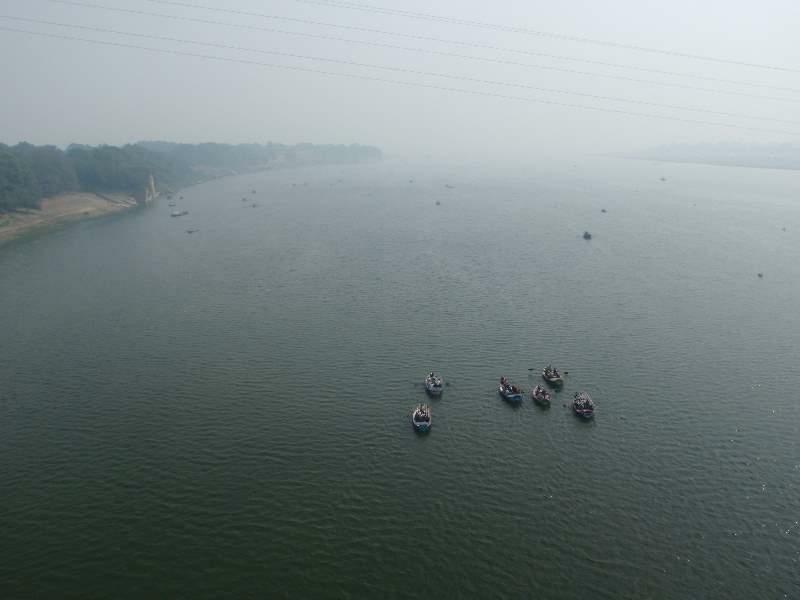 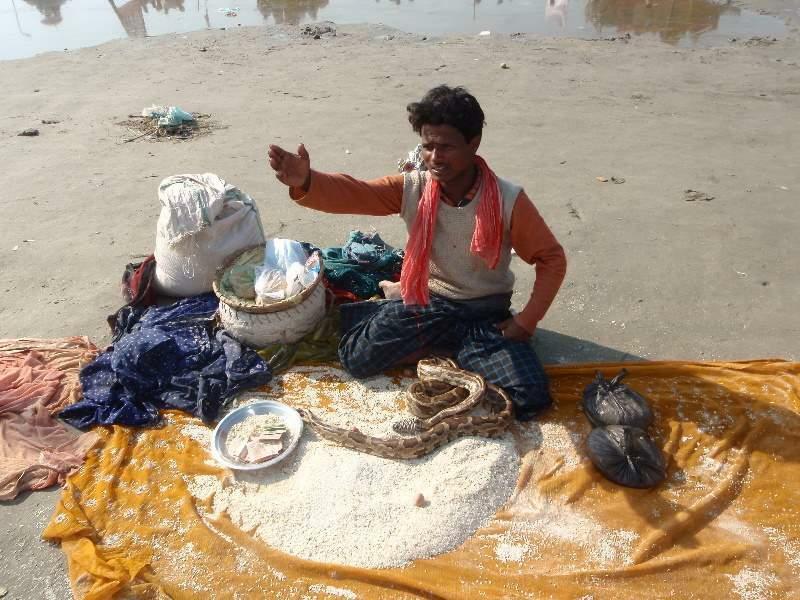 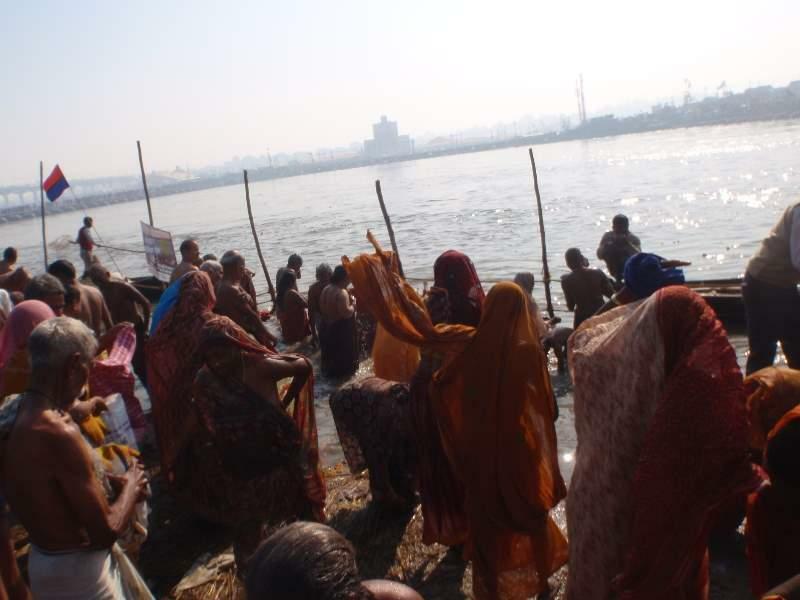 This is where the Ganges, Yamuna, and Saraswati meet. 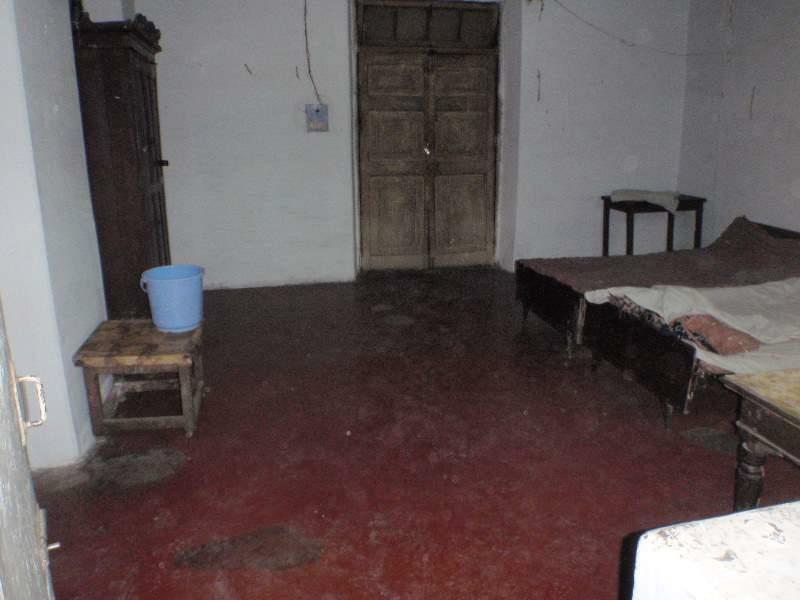 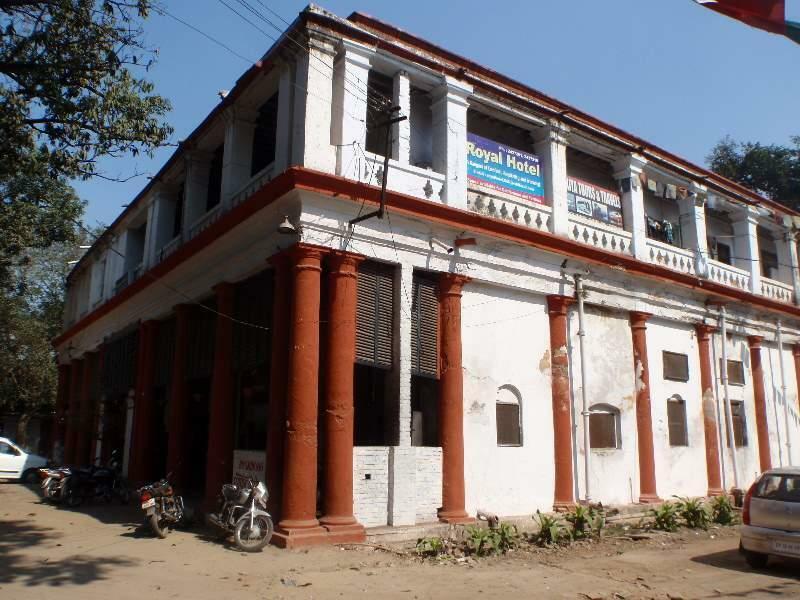 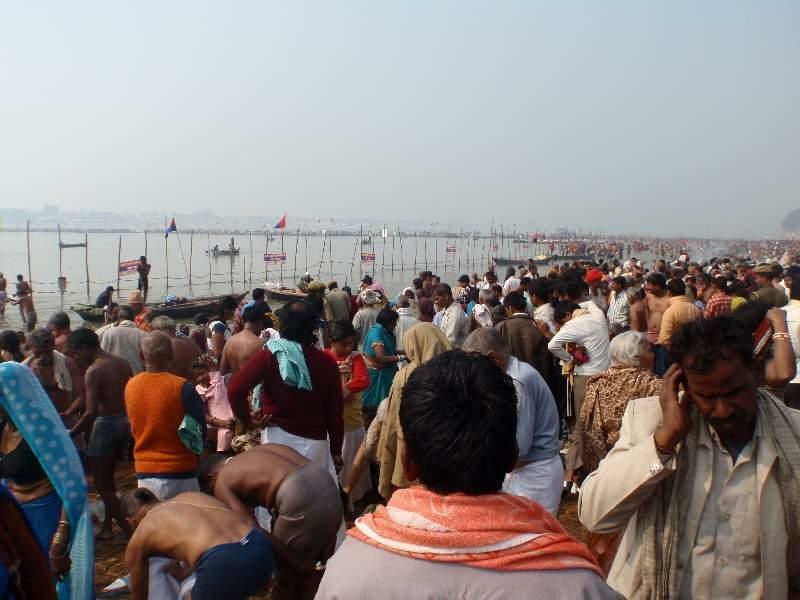 This place is "Sangam" the most important holy bathing place in India. 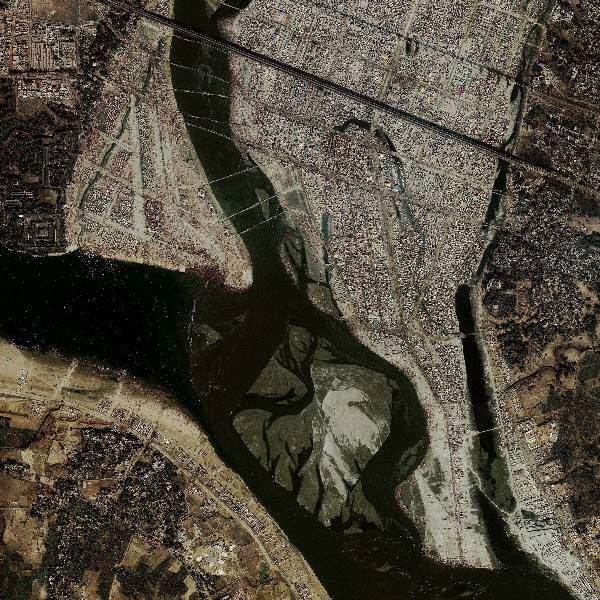 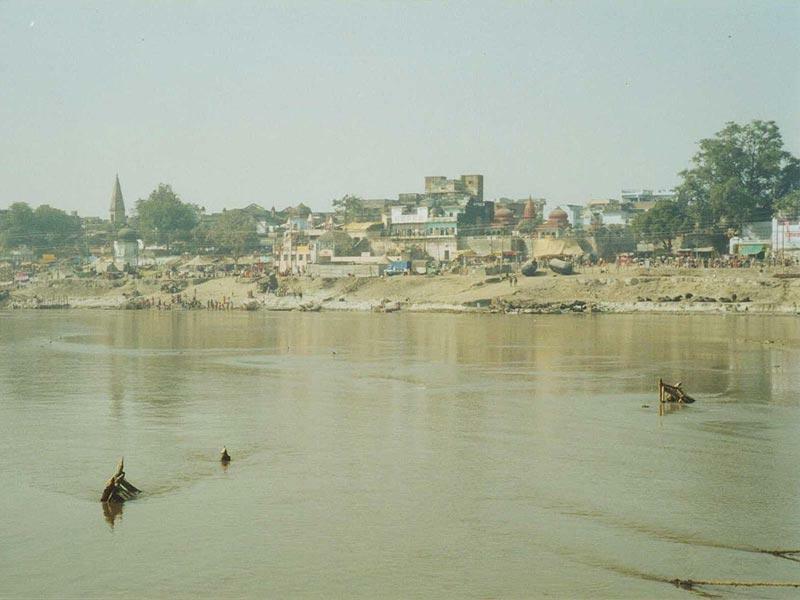 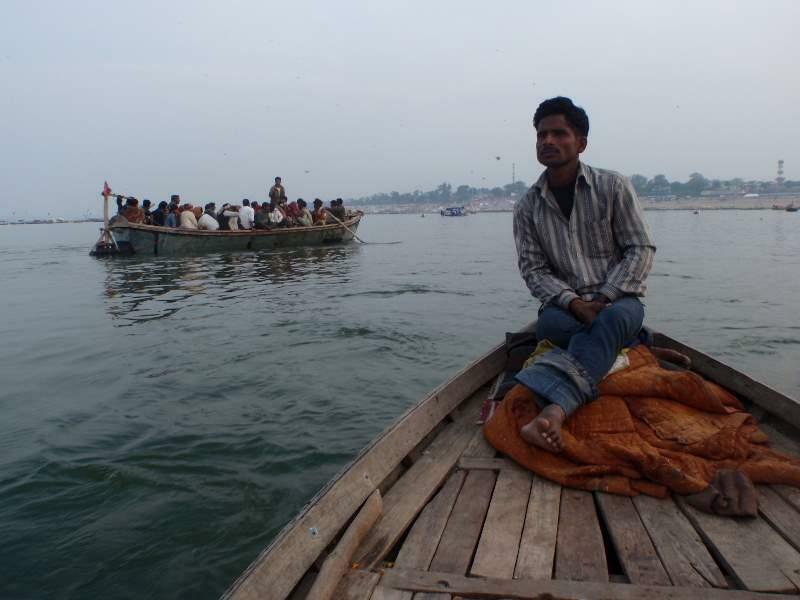 The muddy-colored Ganges is shallower and more rapid. 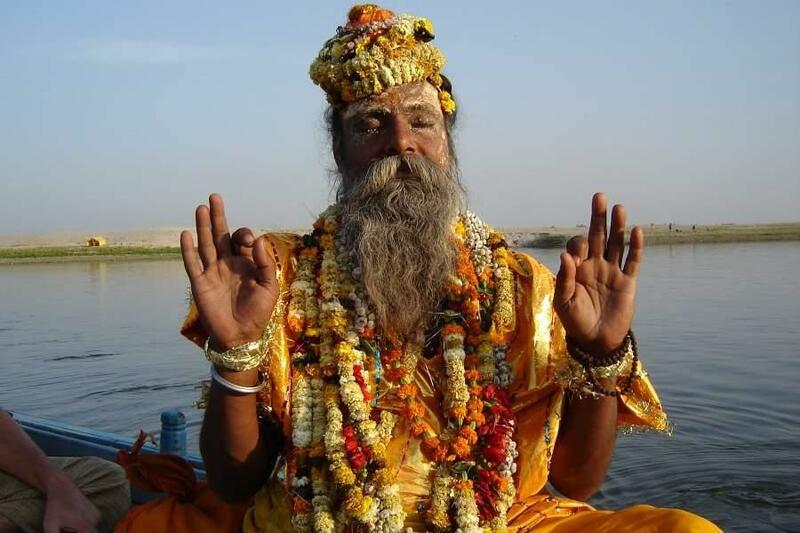 The Yamuna is bluer and deeper. 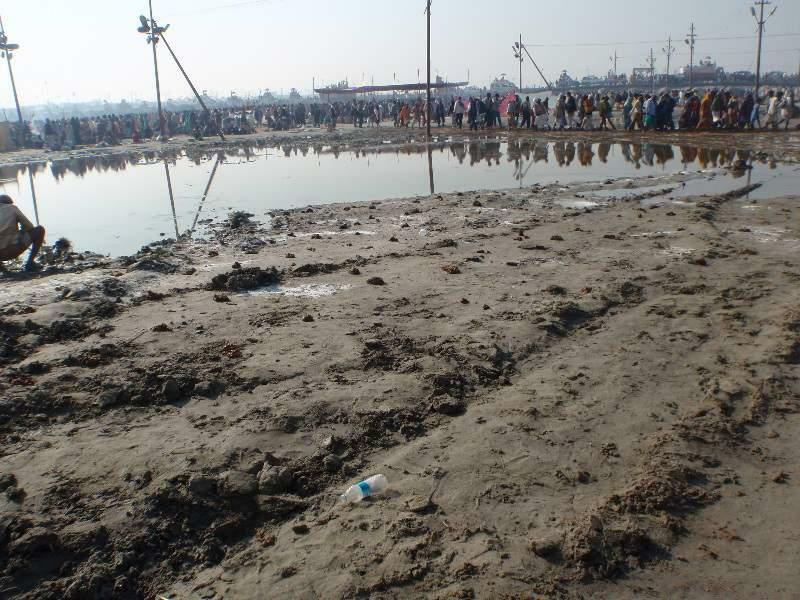 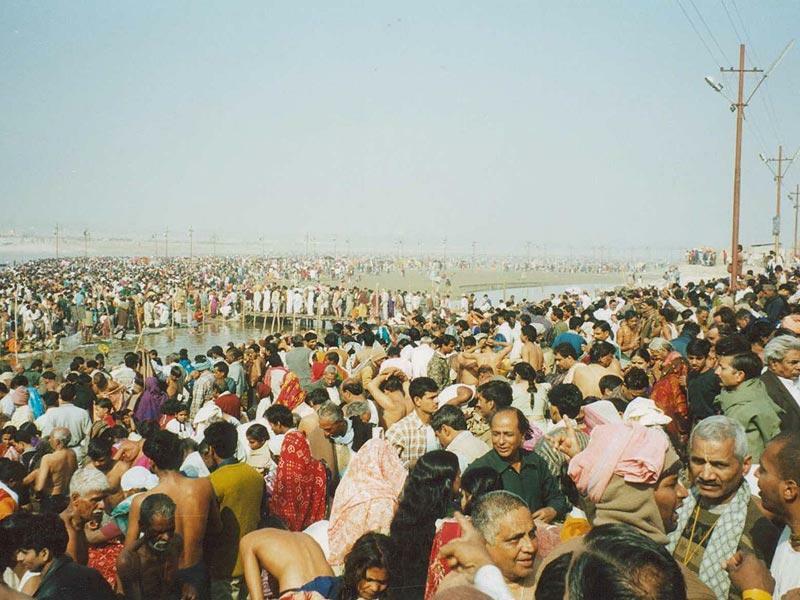 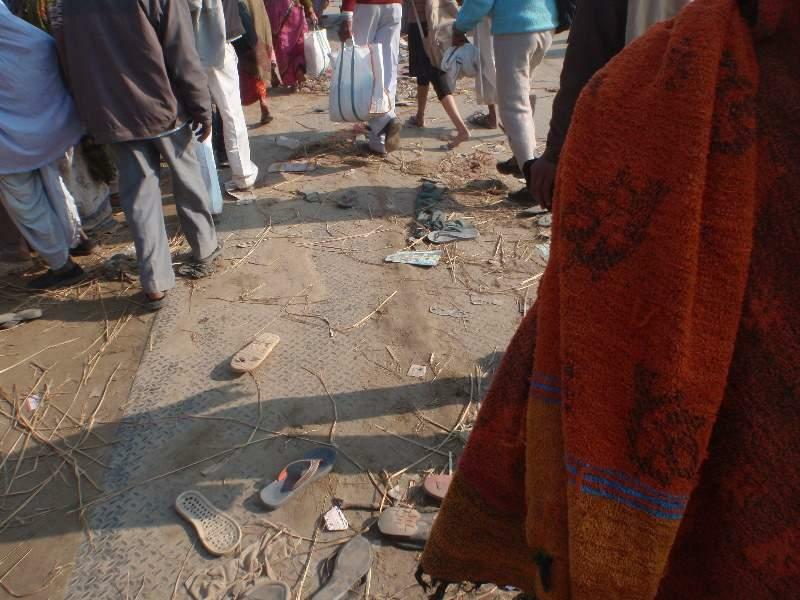 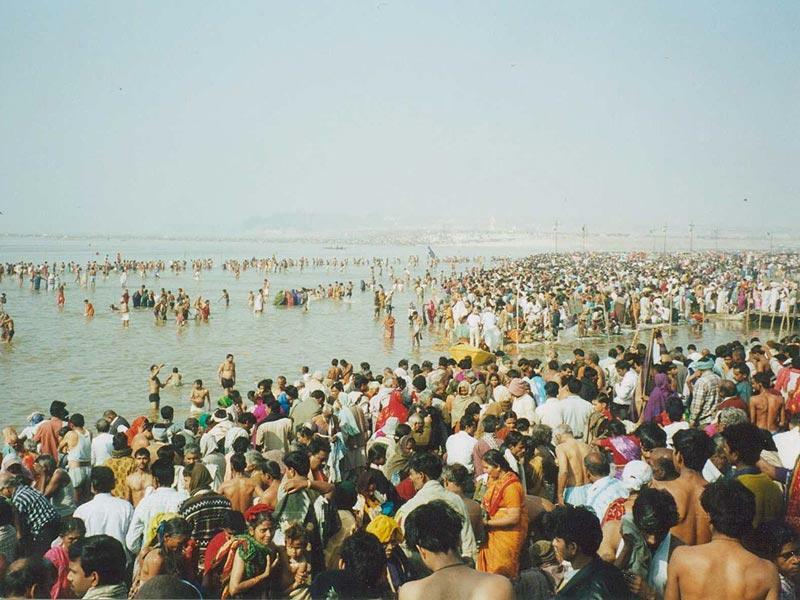 The most auspicious time to bathe in the Sangam is during Kumbha Mela Kumbha Mela is held here every 12 years. 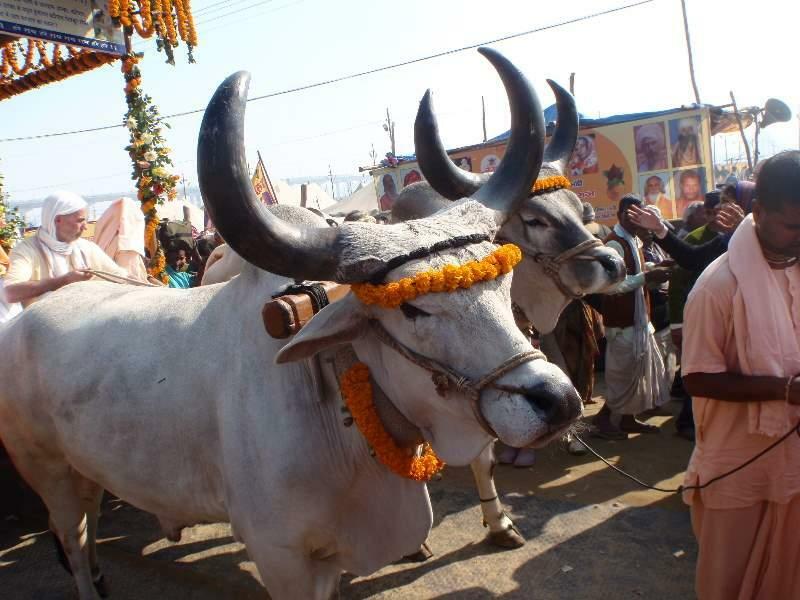 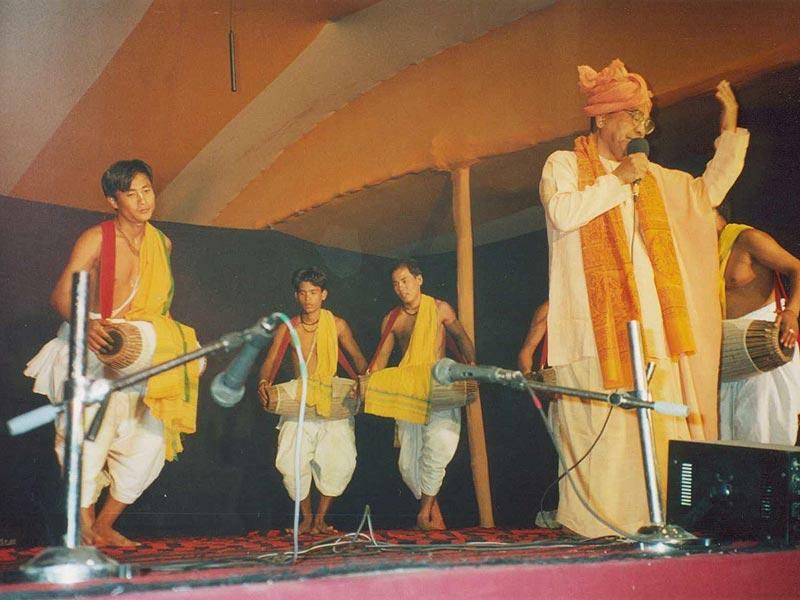 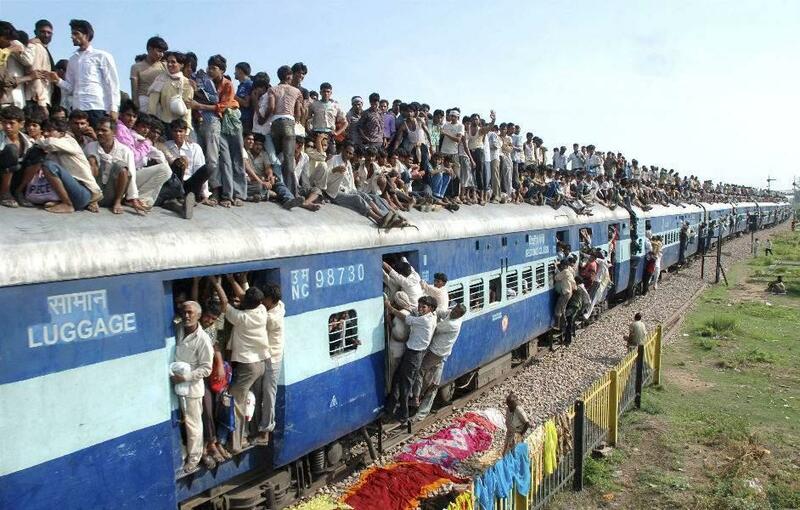 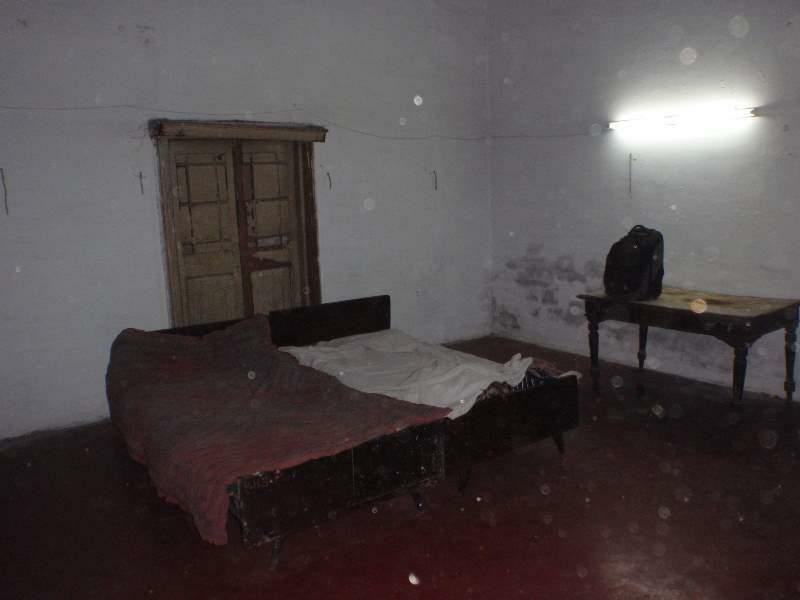 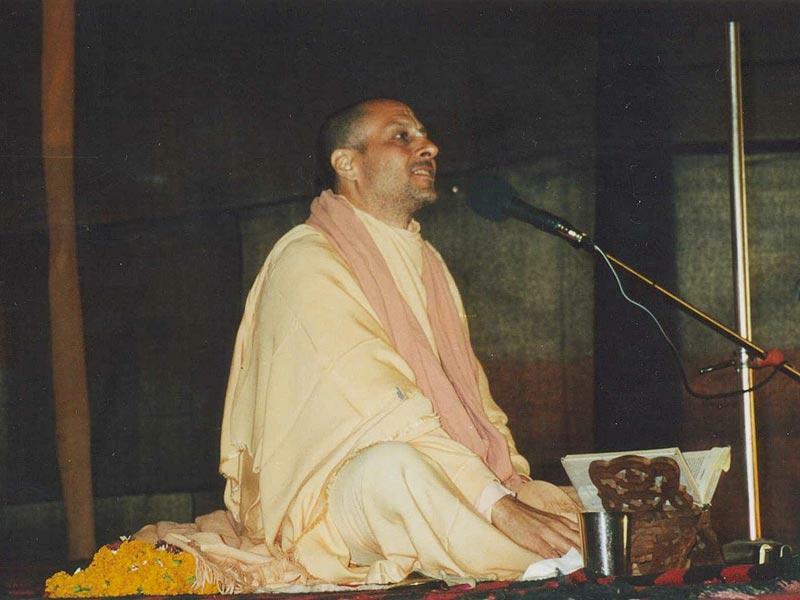 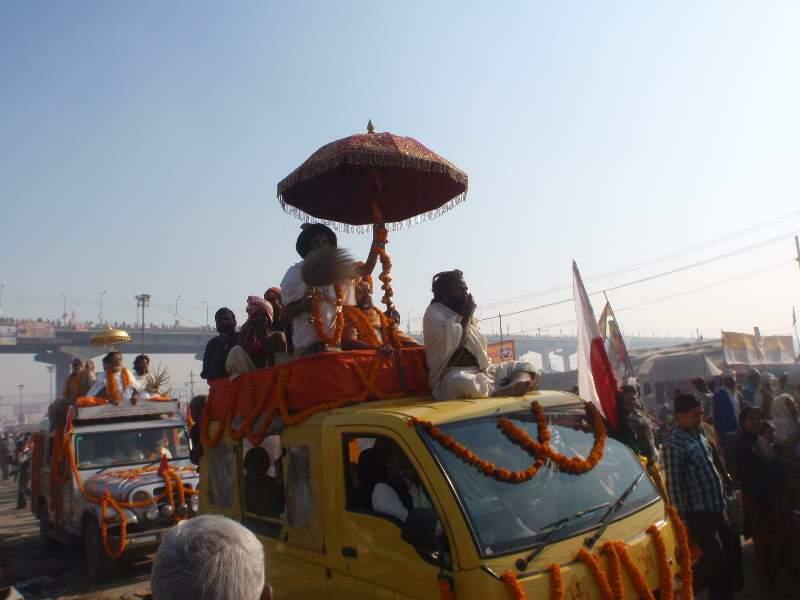 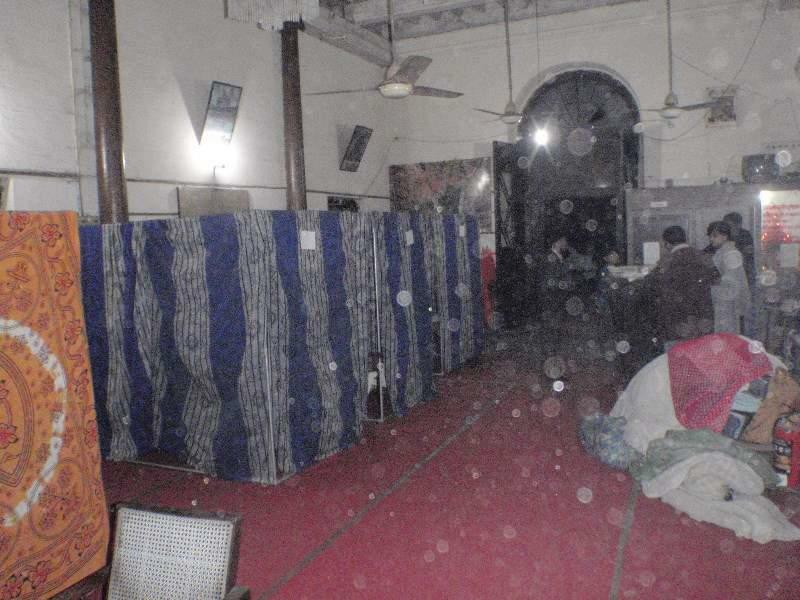 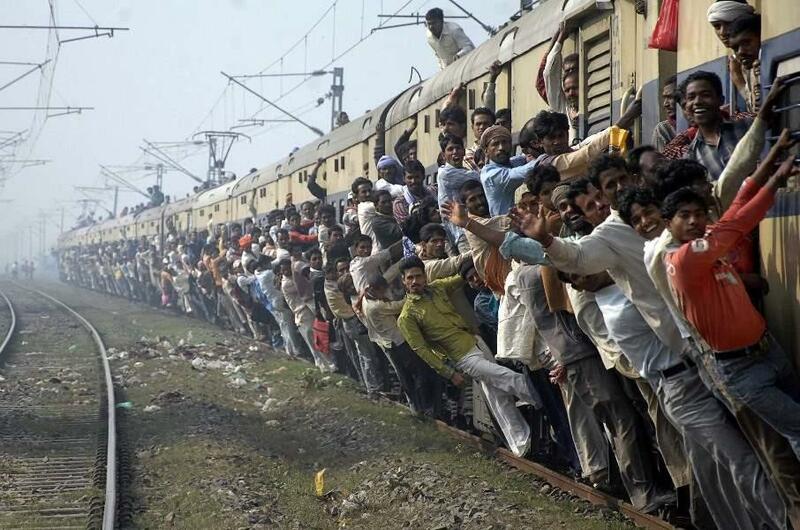 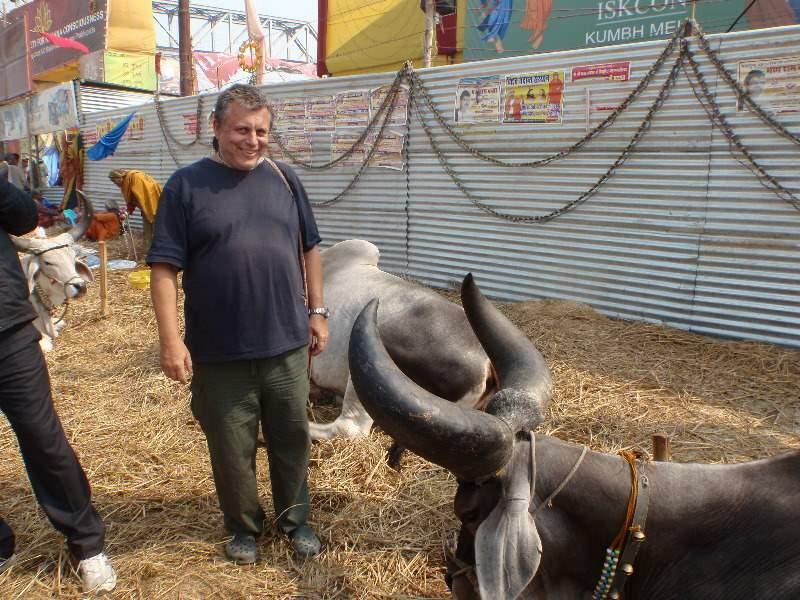 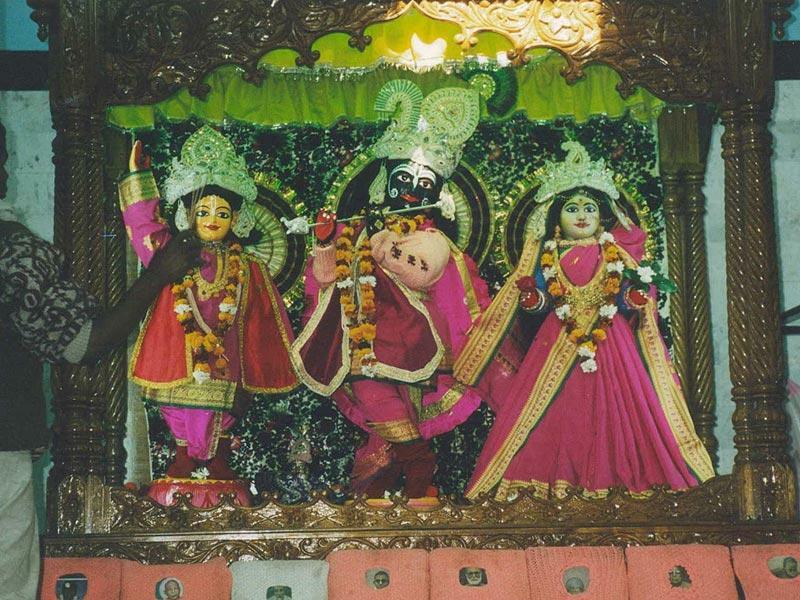 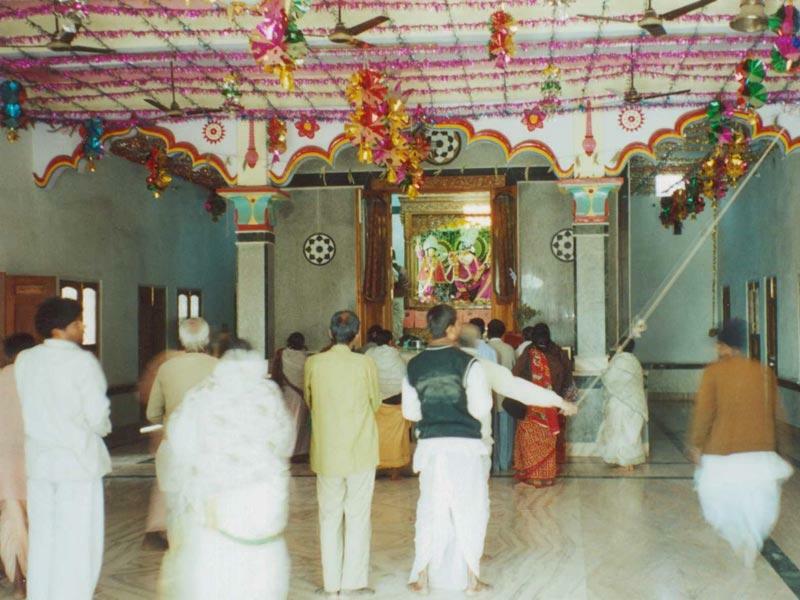 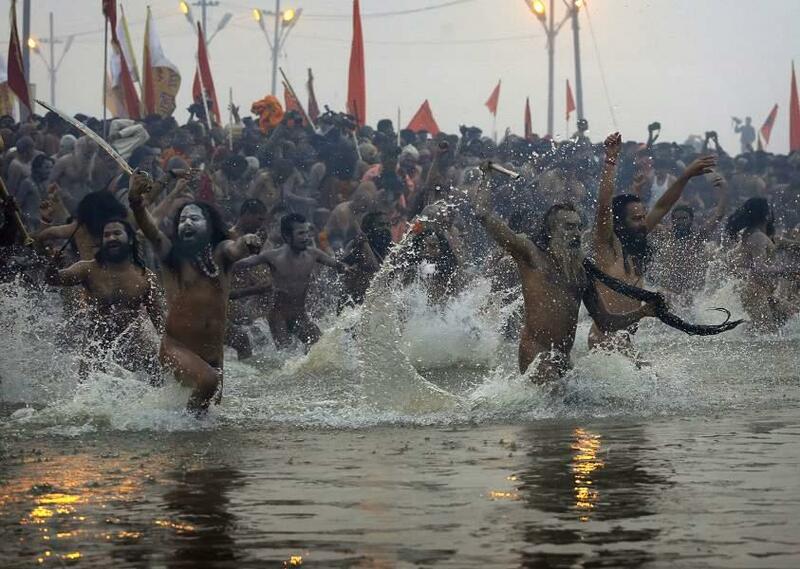 It also takes place in three other holy places in India every 12 years— Haridwar, Ujjain and Nasik. 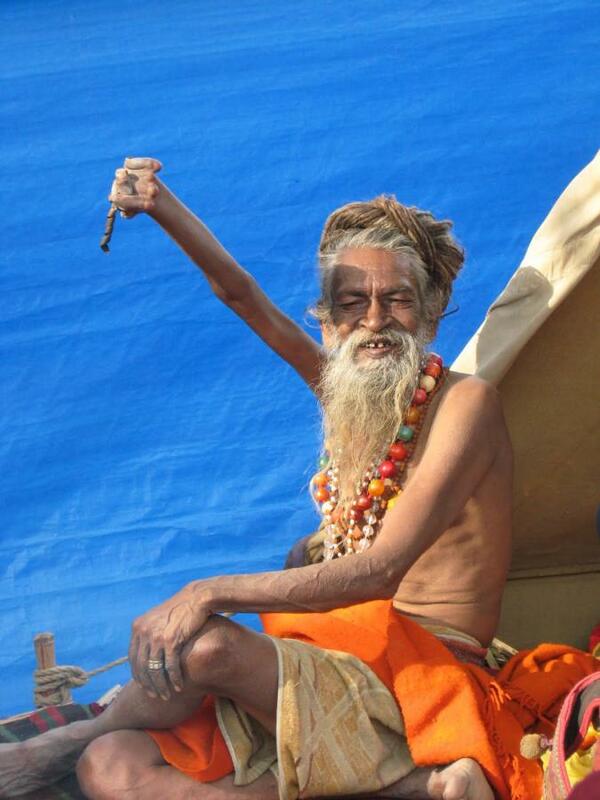 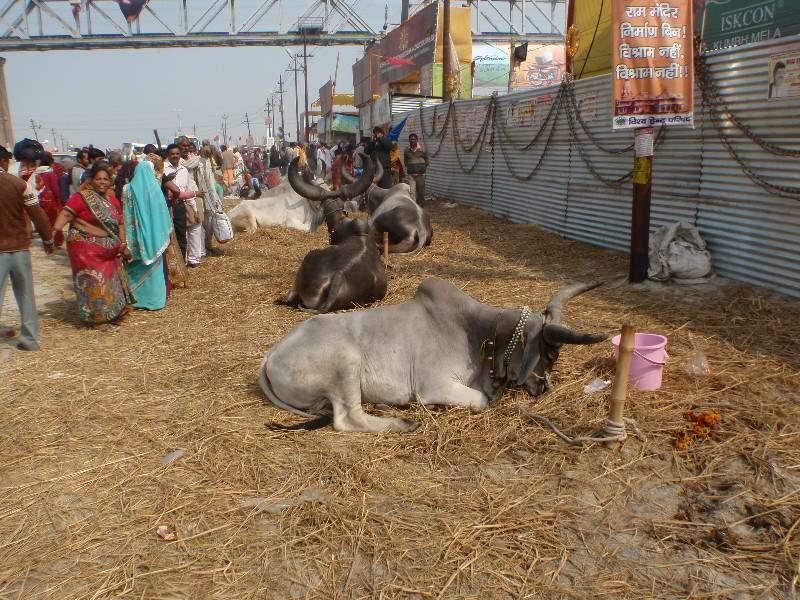 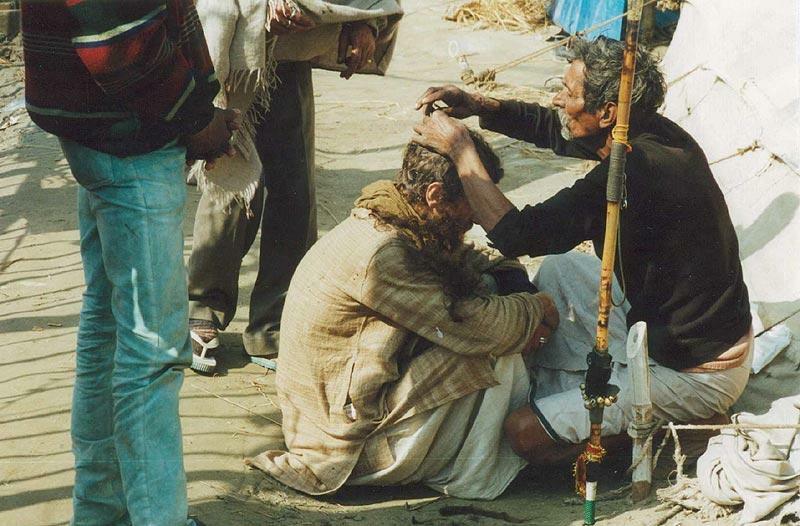 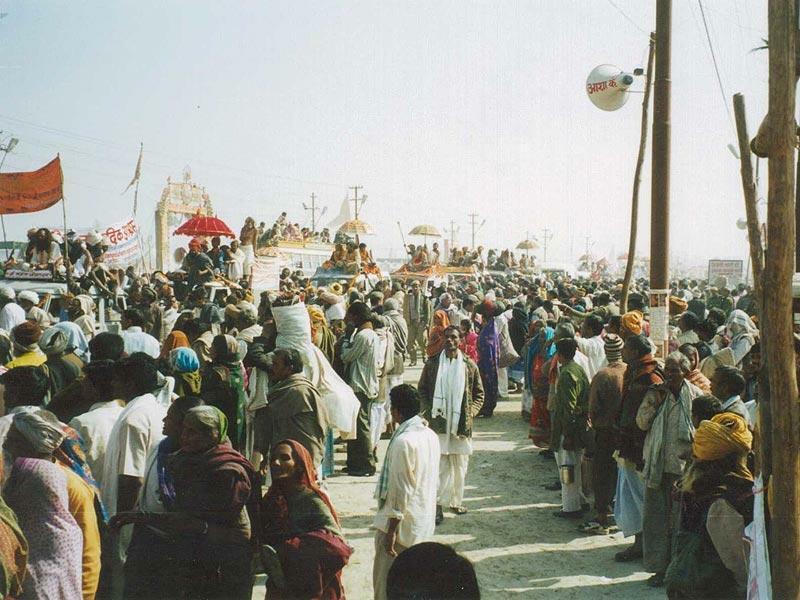 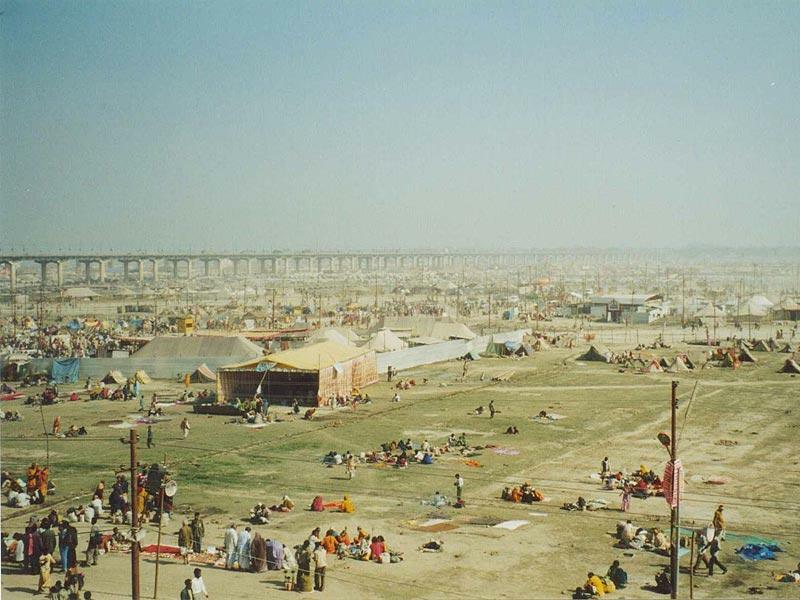 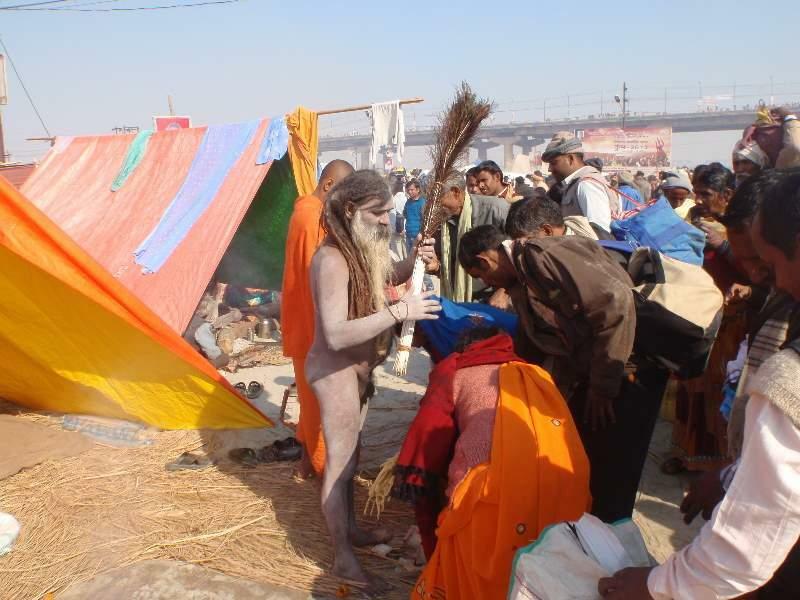 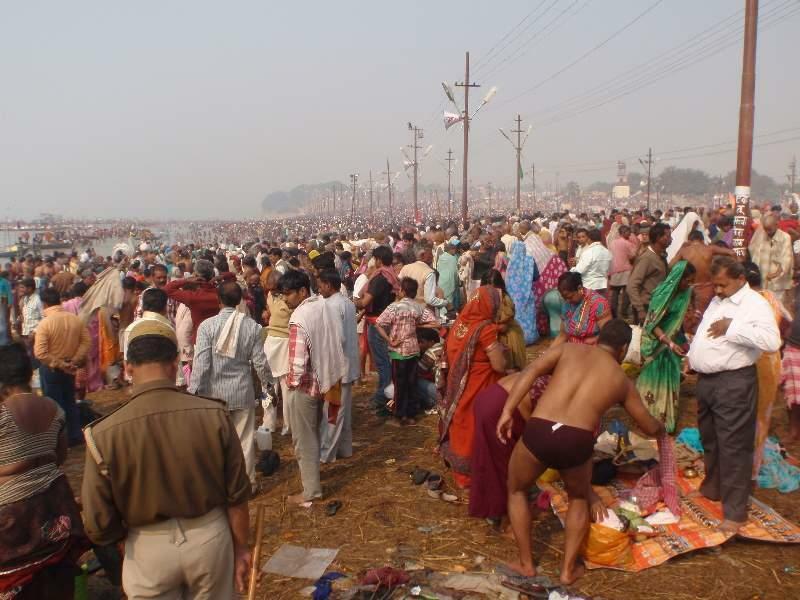 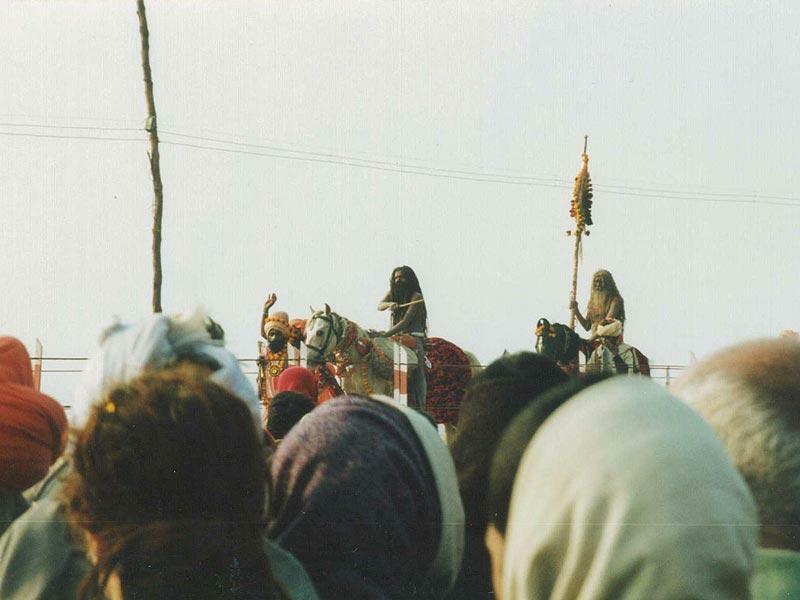 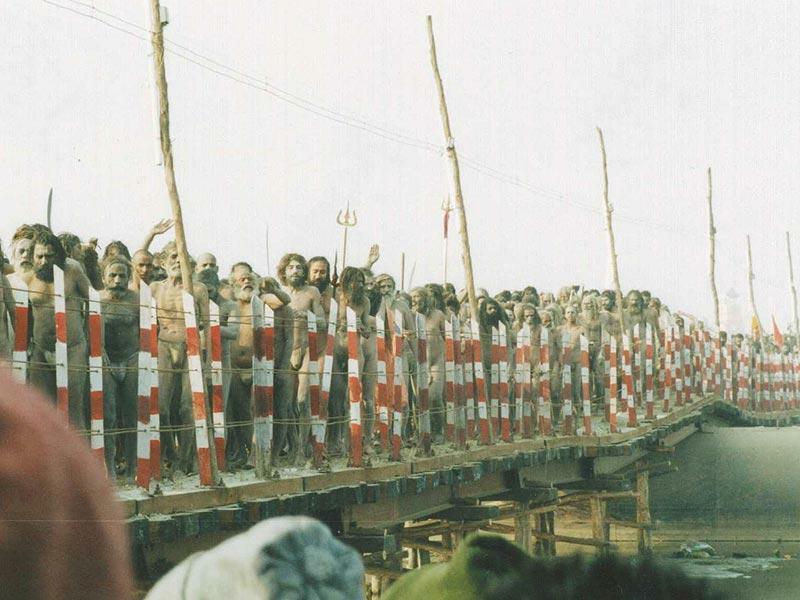 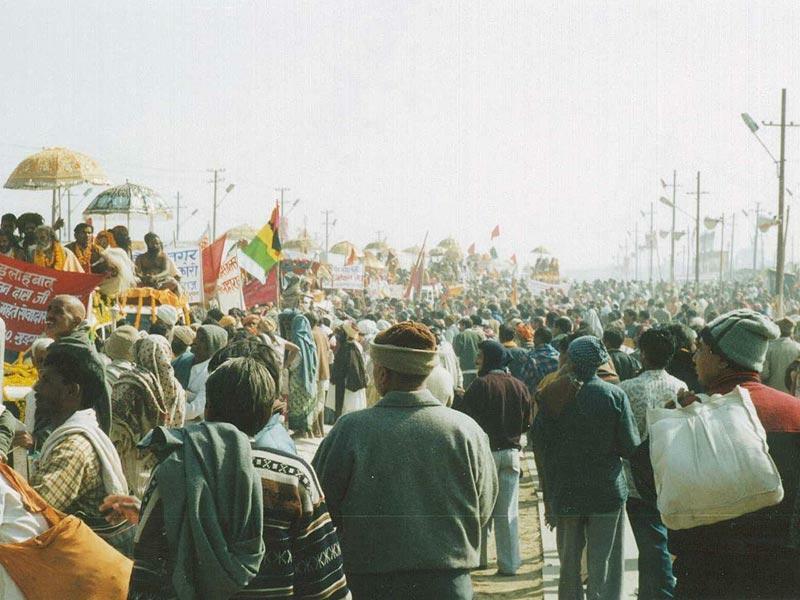 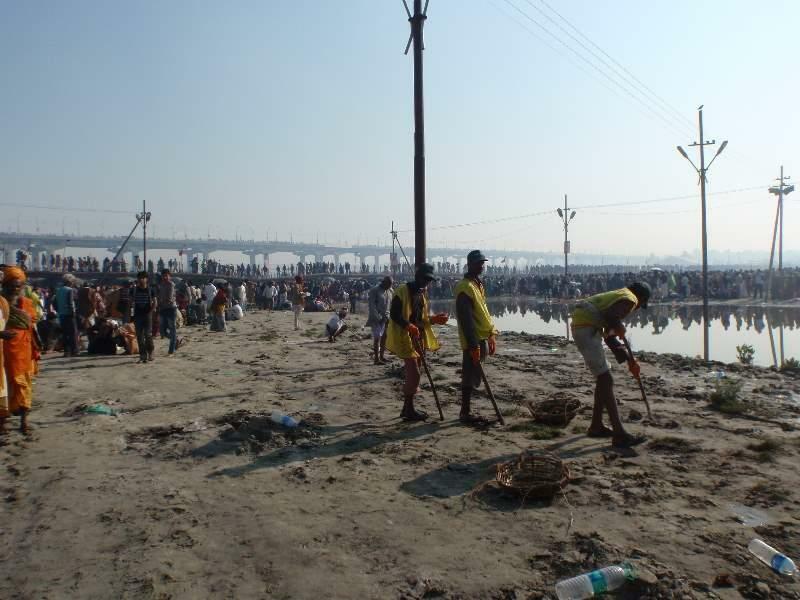 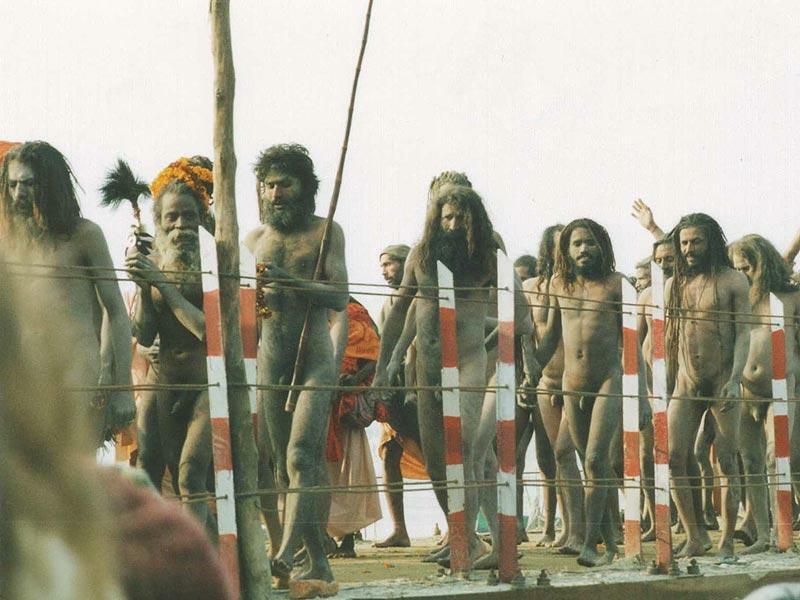 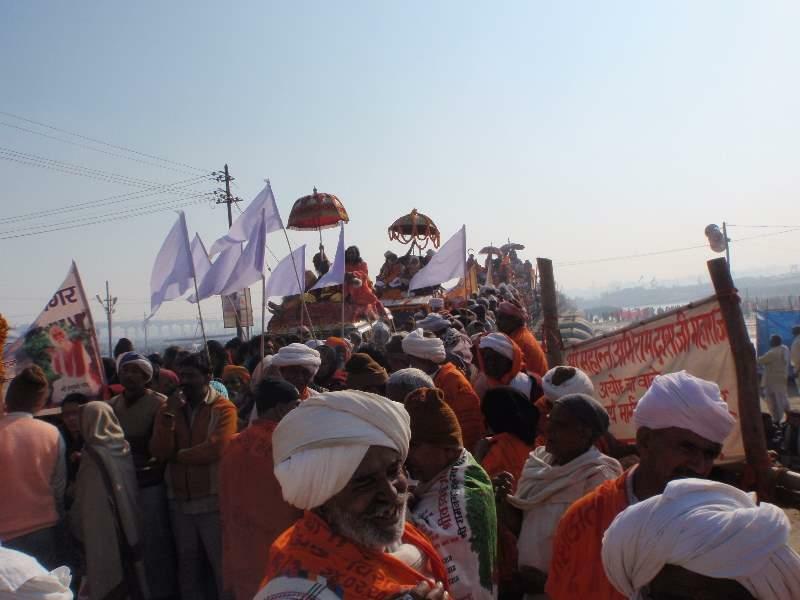 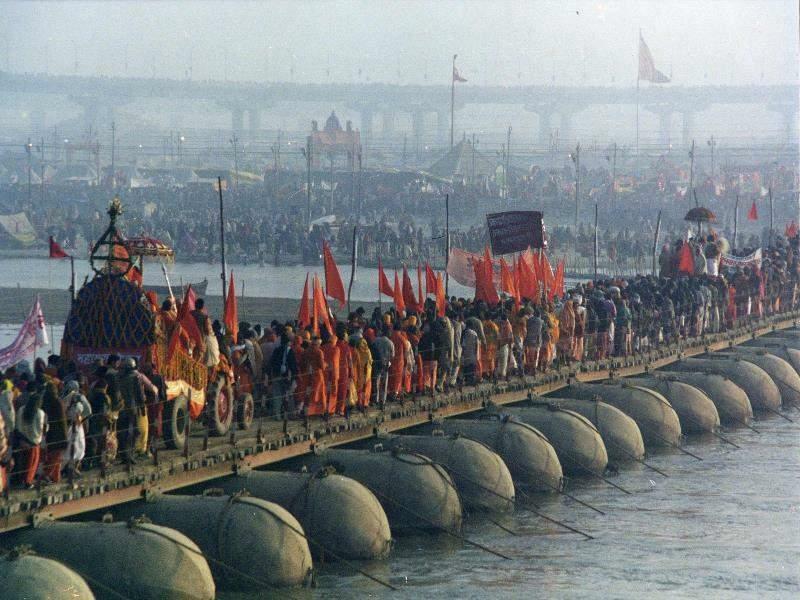 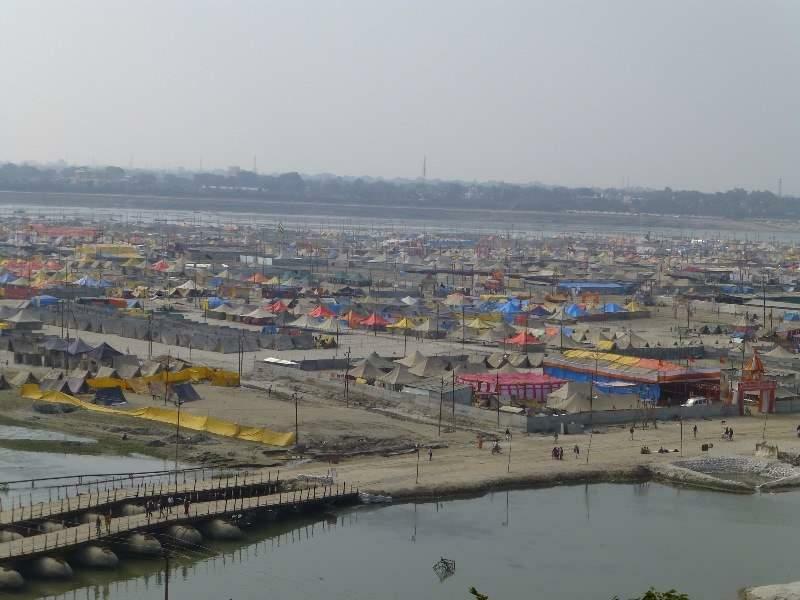 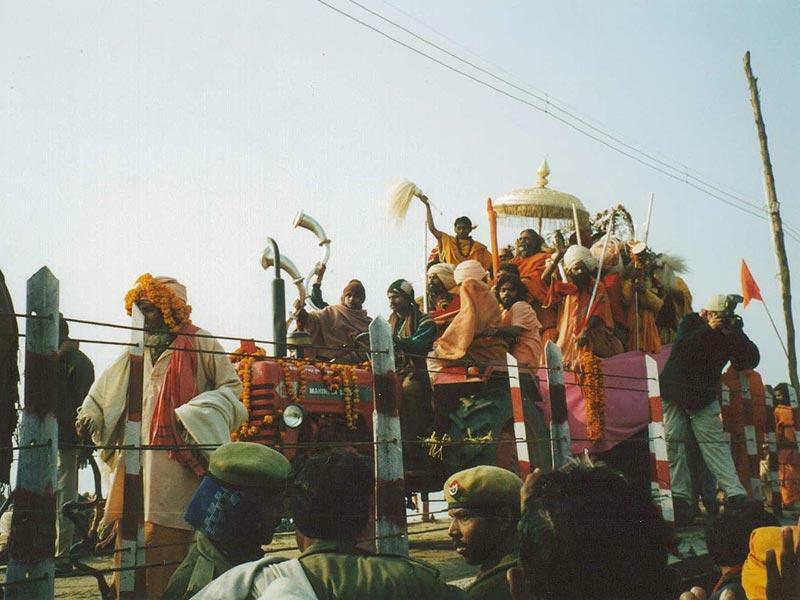 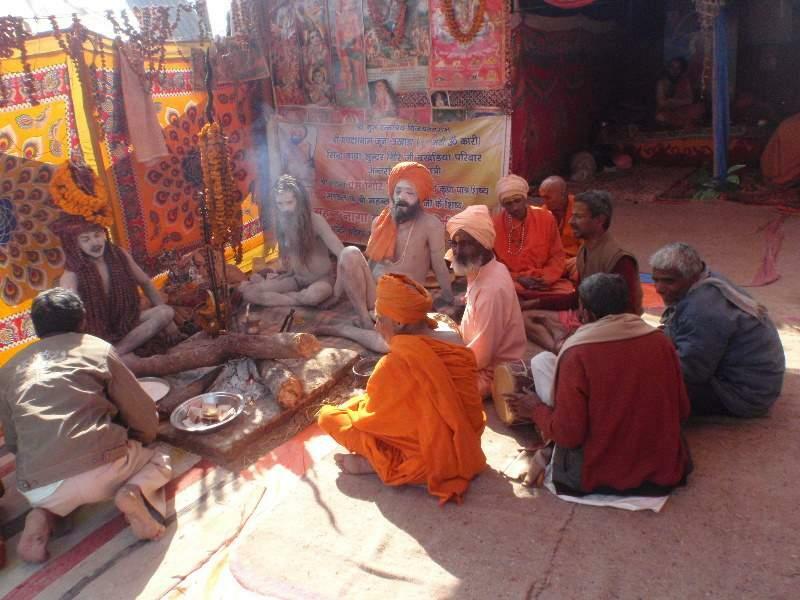 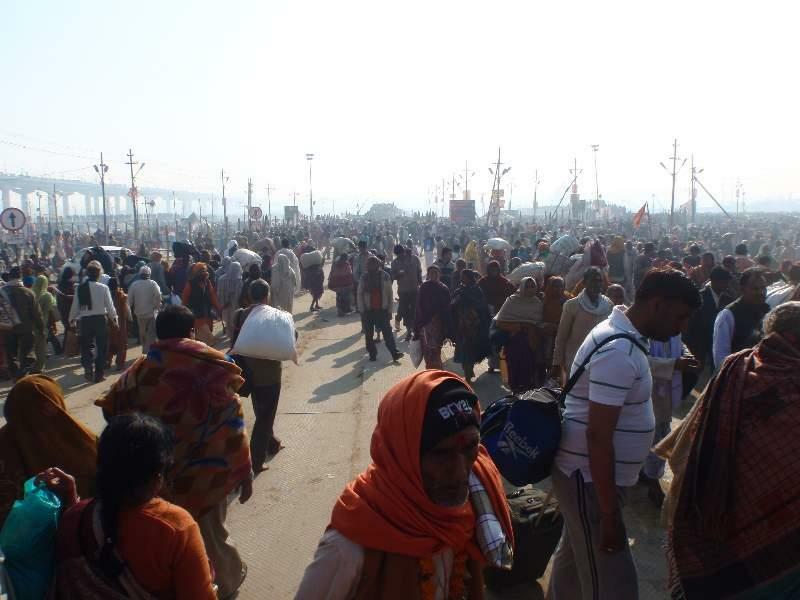 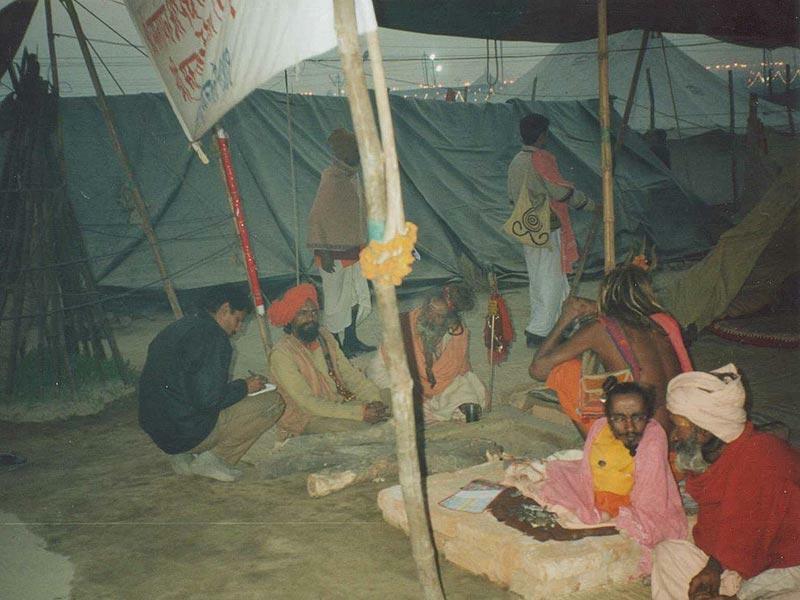 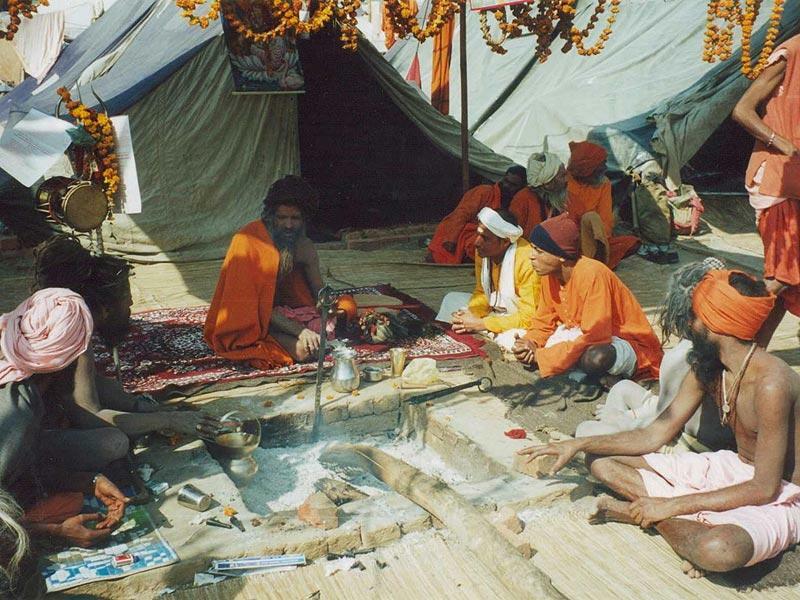 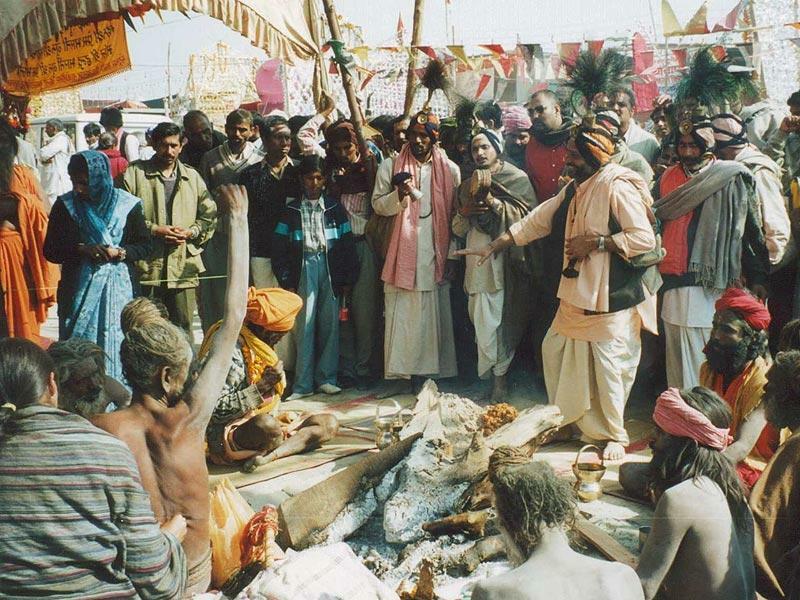 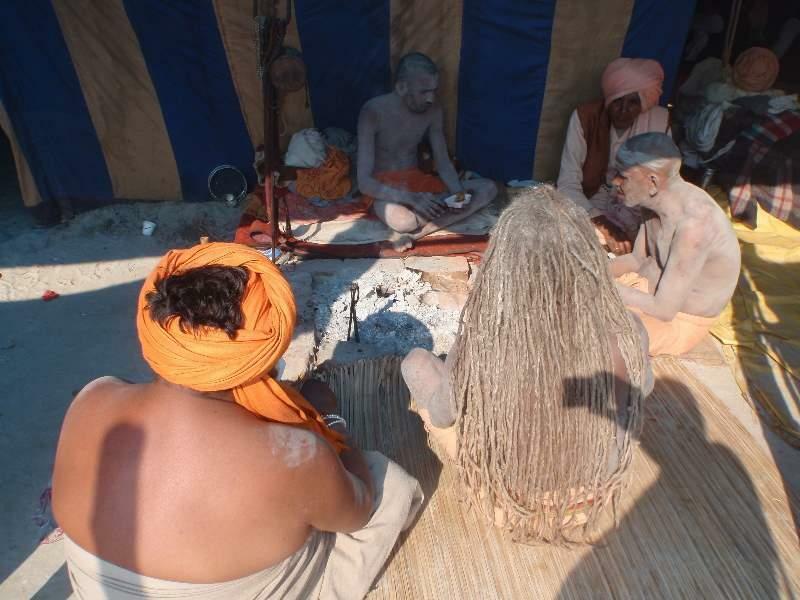 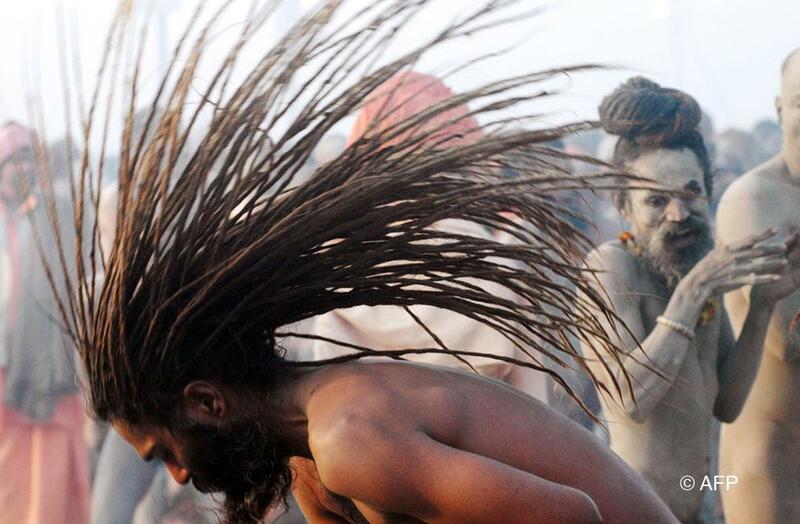 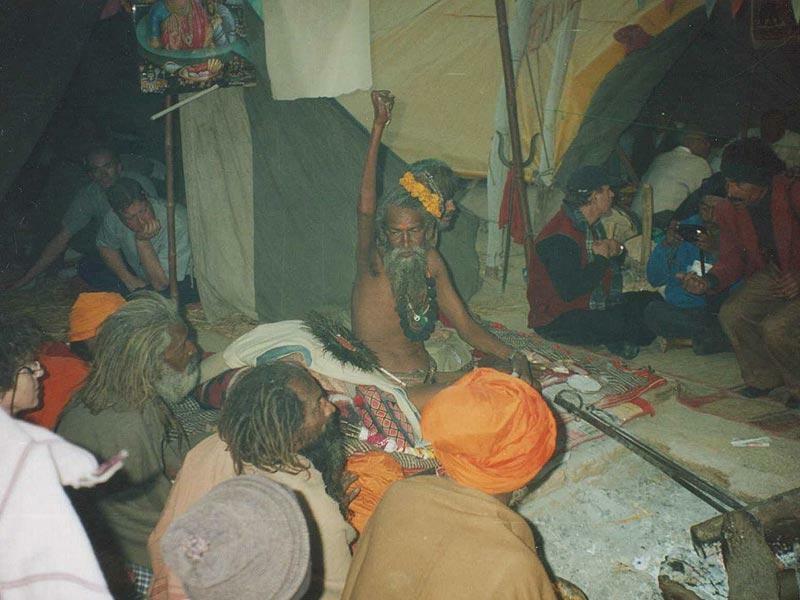 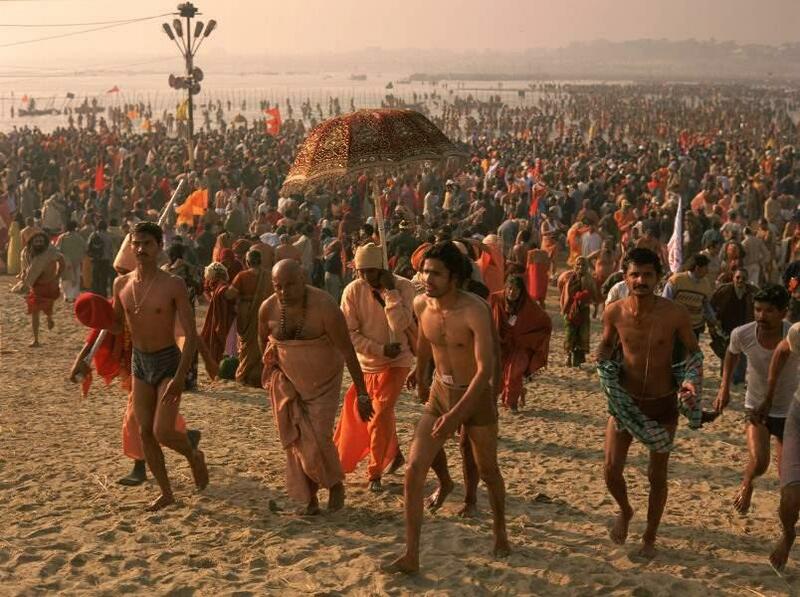 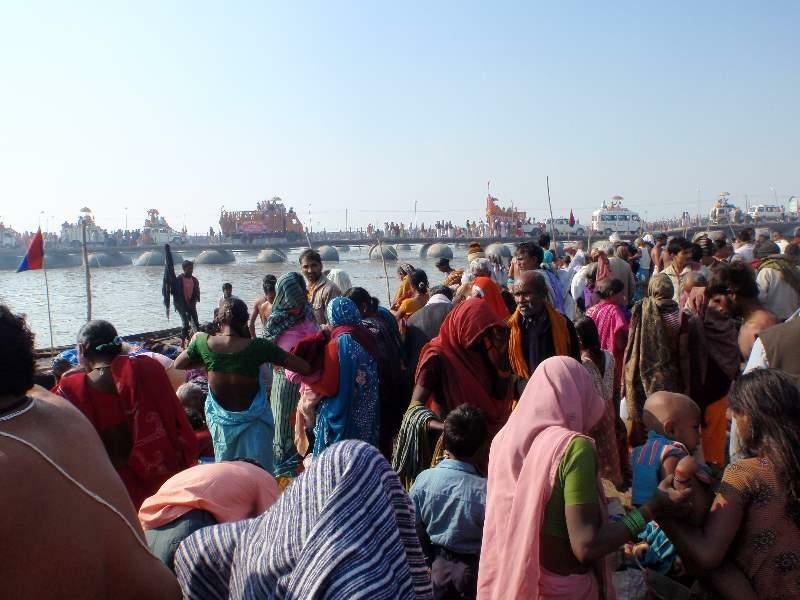 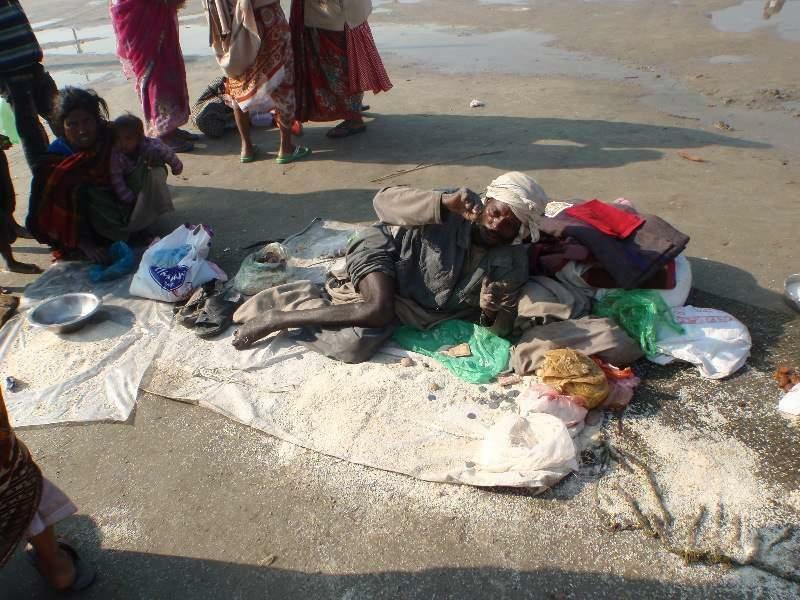 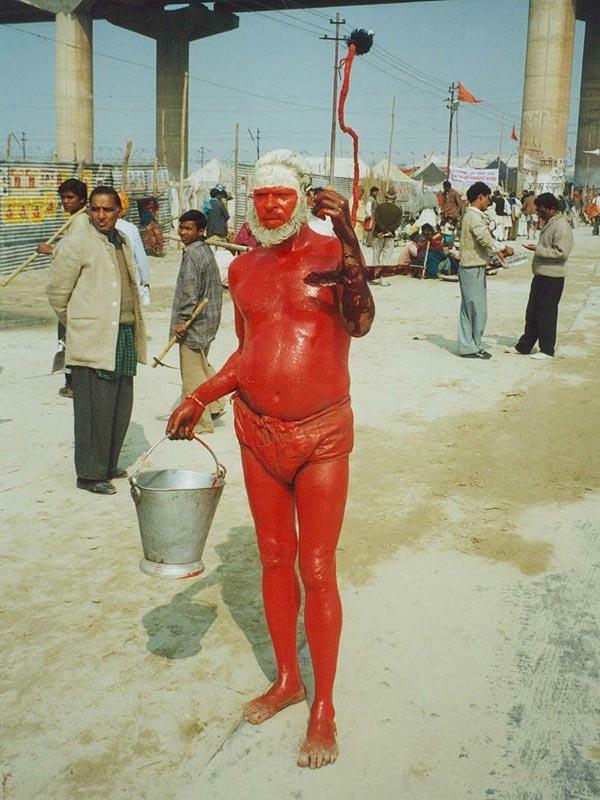 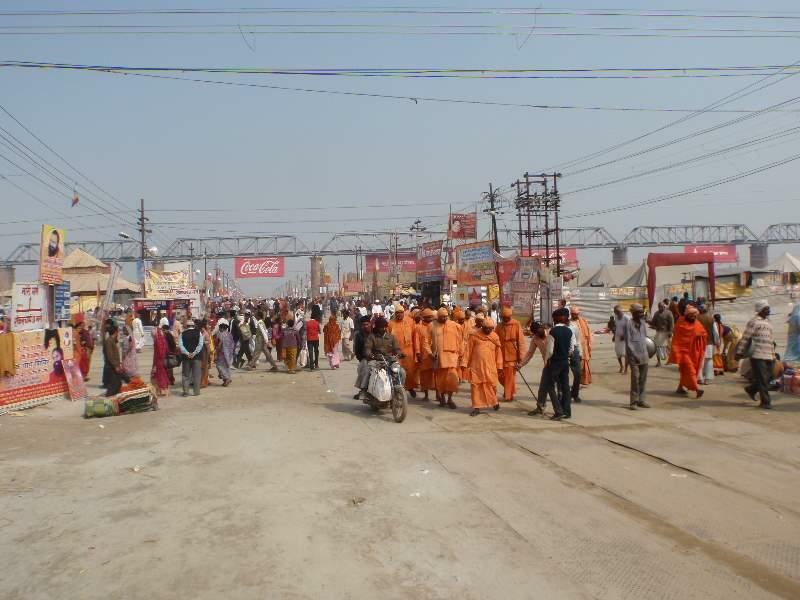 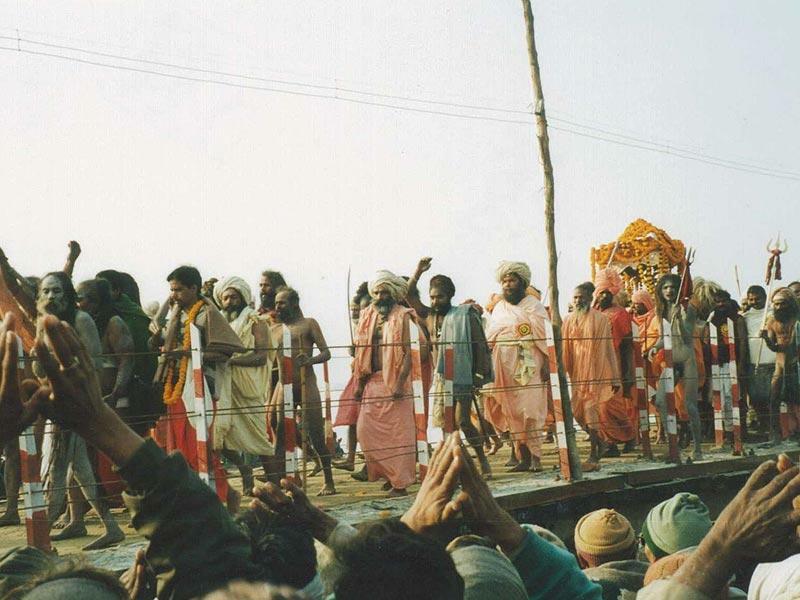 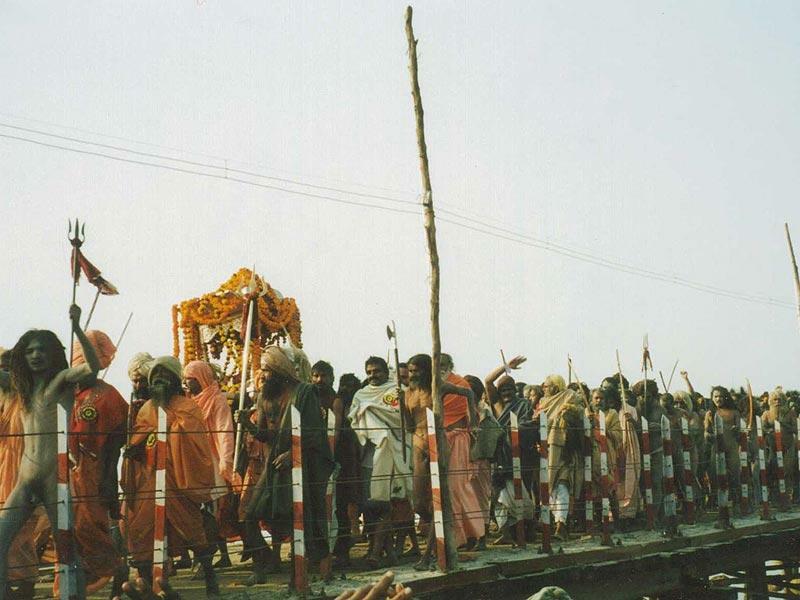 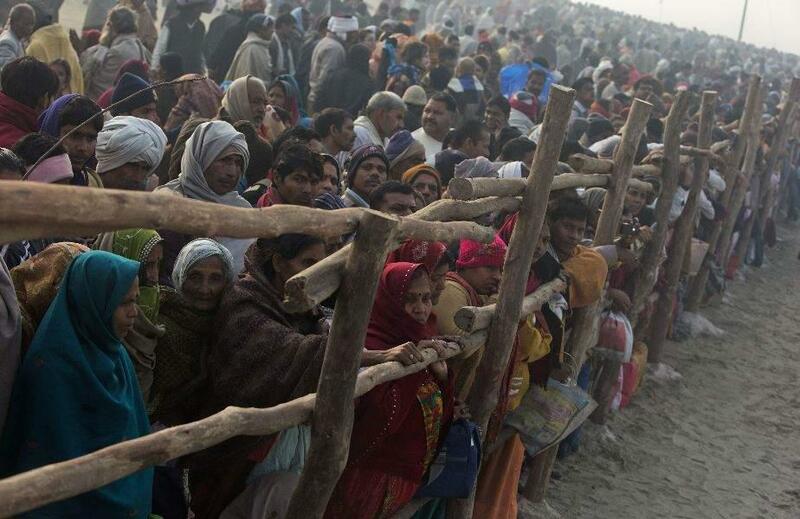 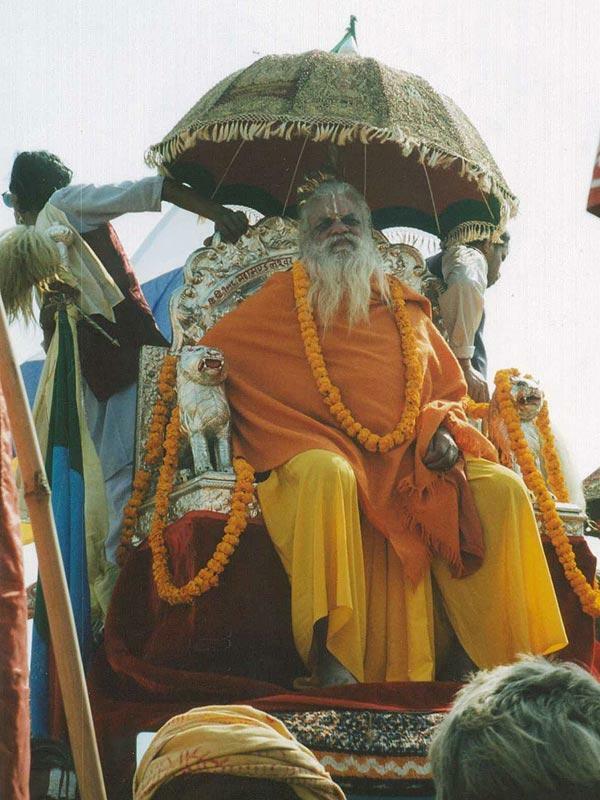 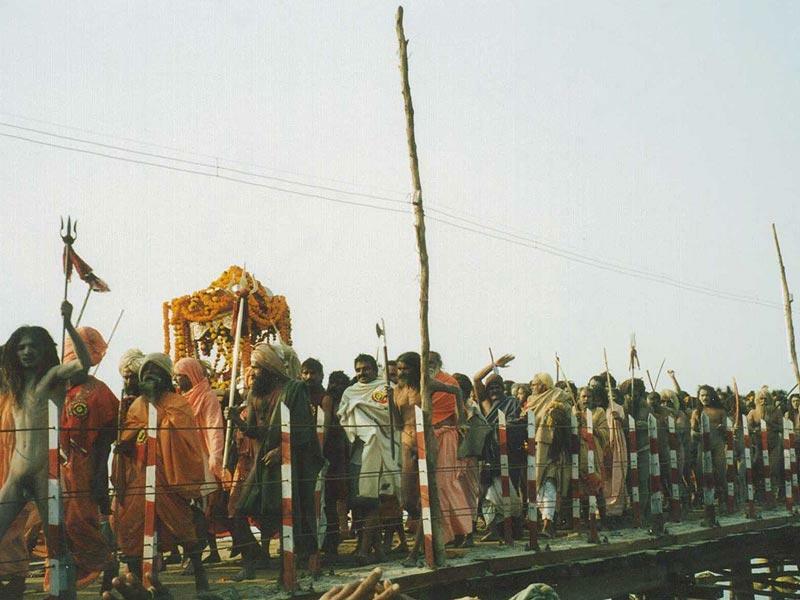 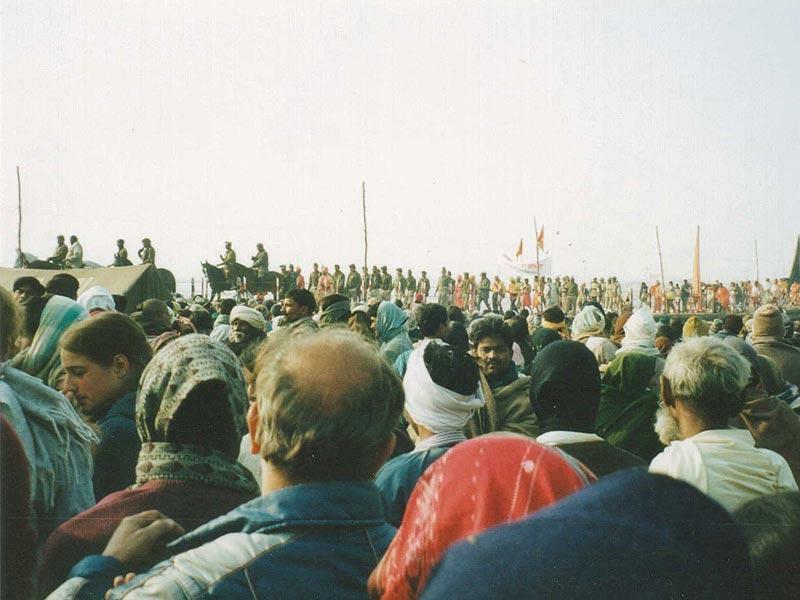 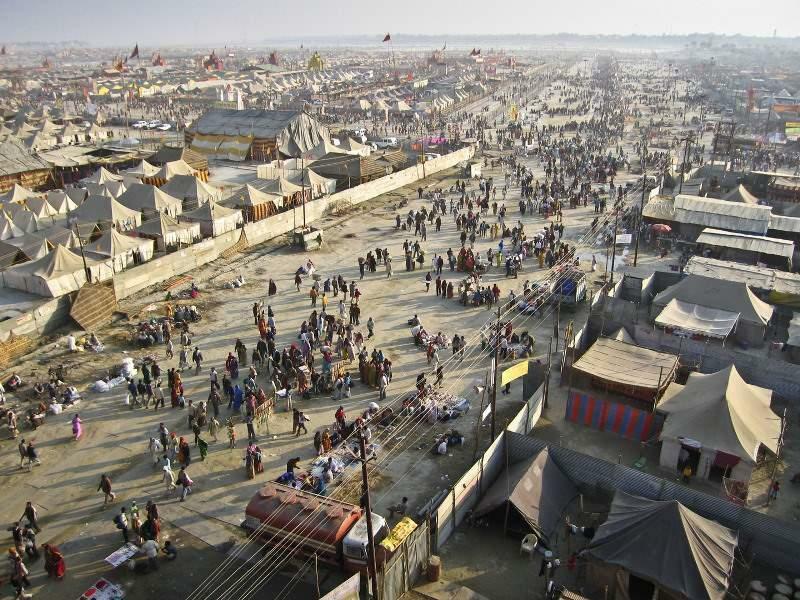 The Kumbha-mela in Prayag (Allahabad) is considered especially auspicious. 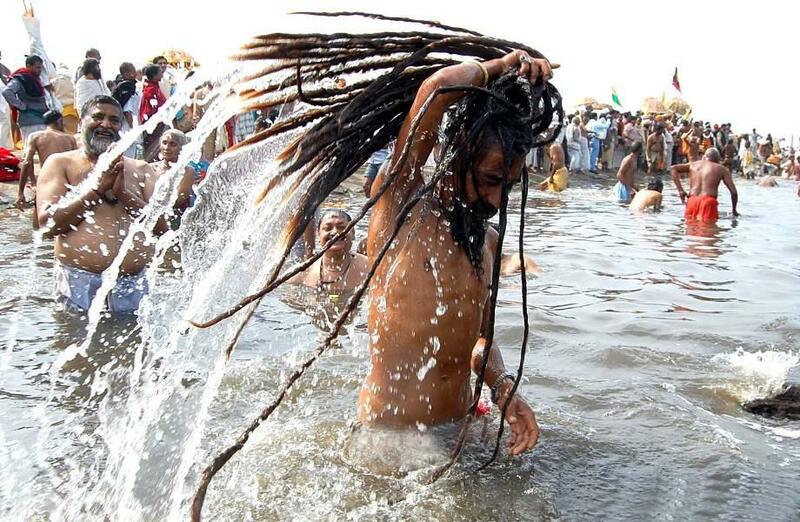 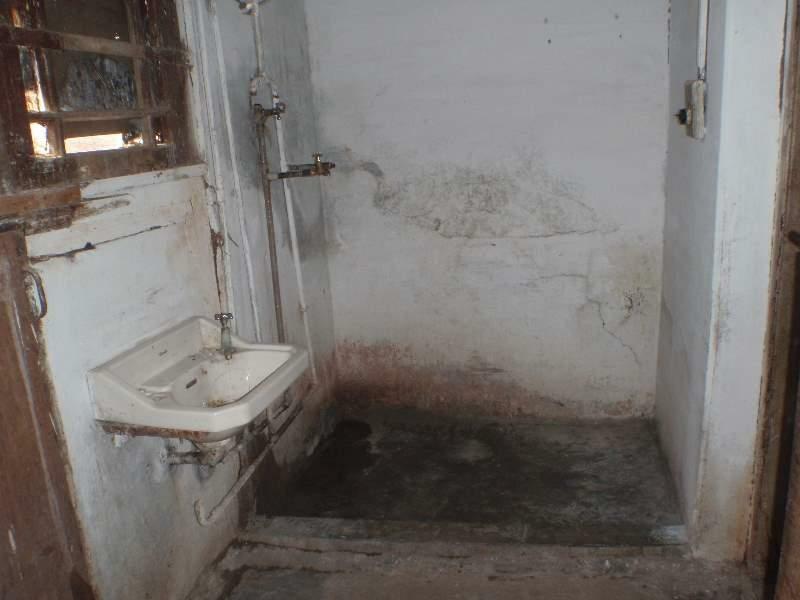 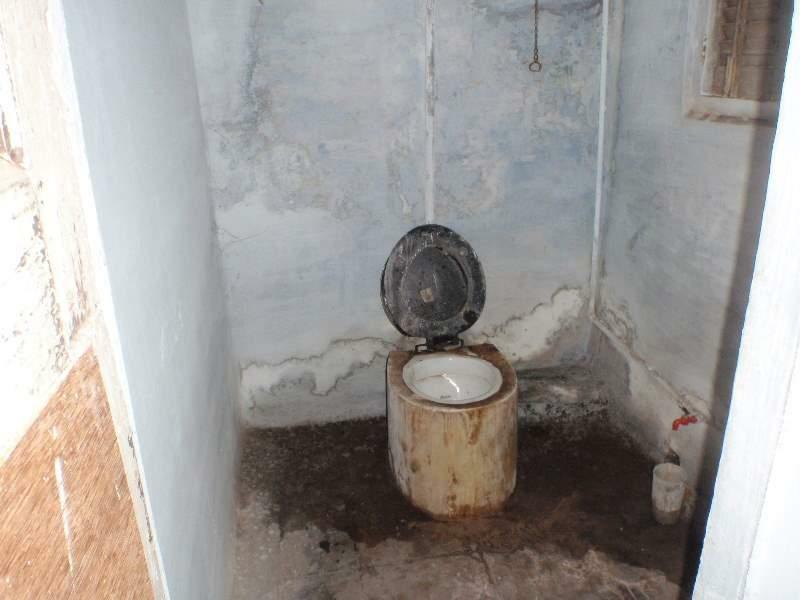 There are several especially auspicious bathing days. 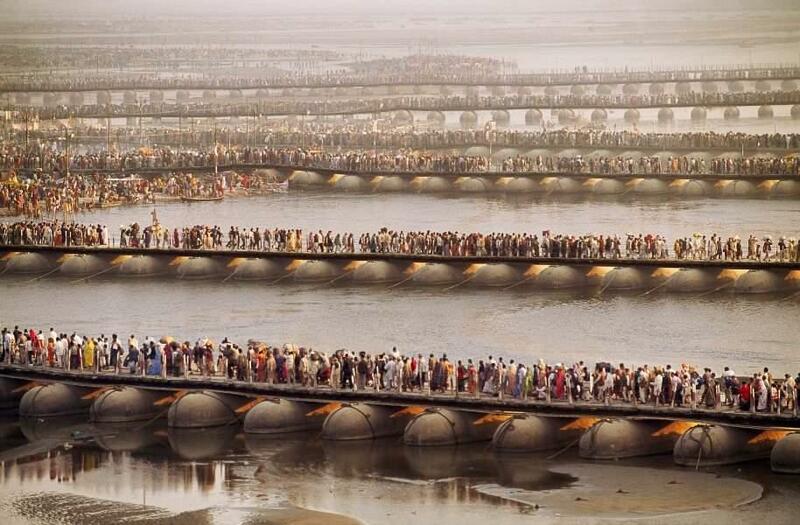 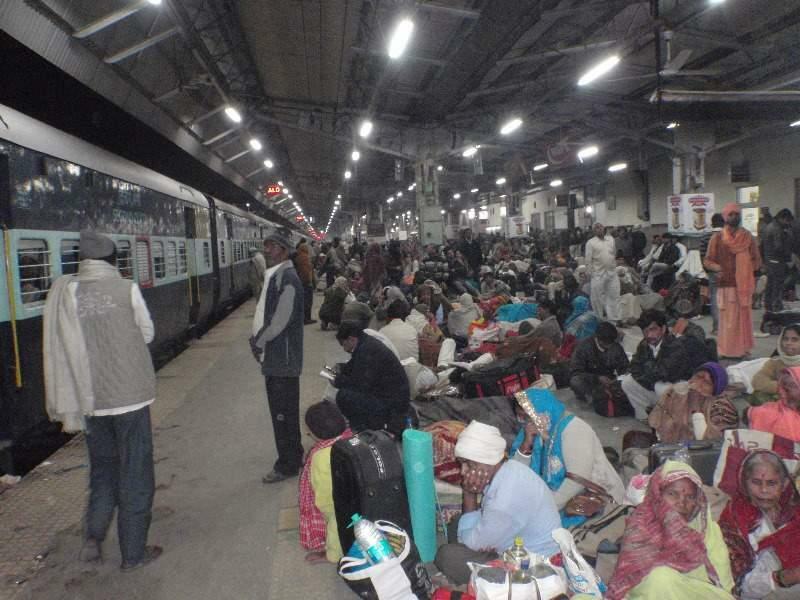 A huge temporary city is created for the millions of pilgrims that arrive for the most auspicious bathing days. 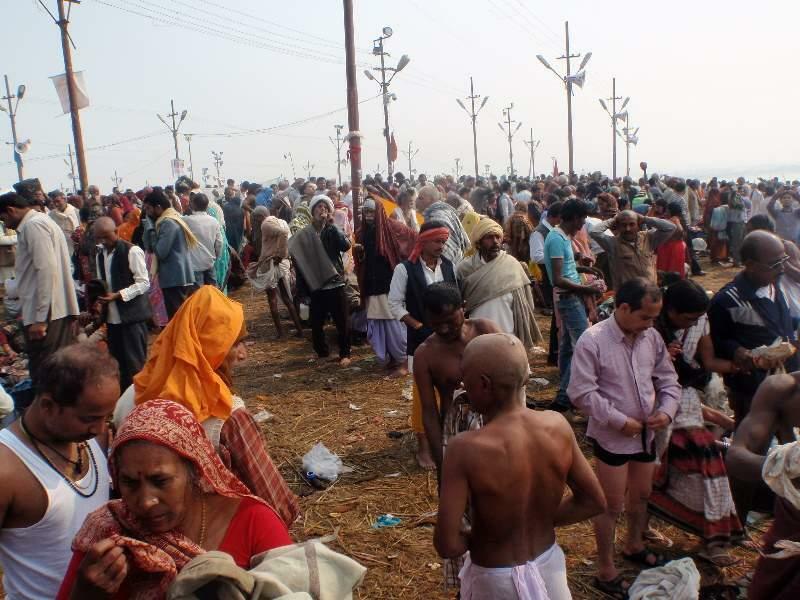 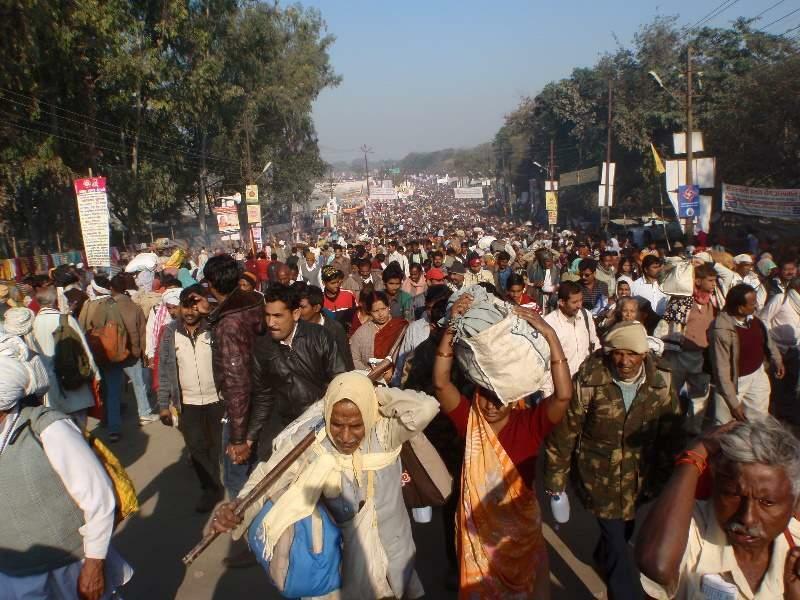 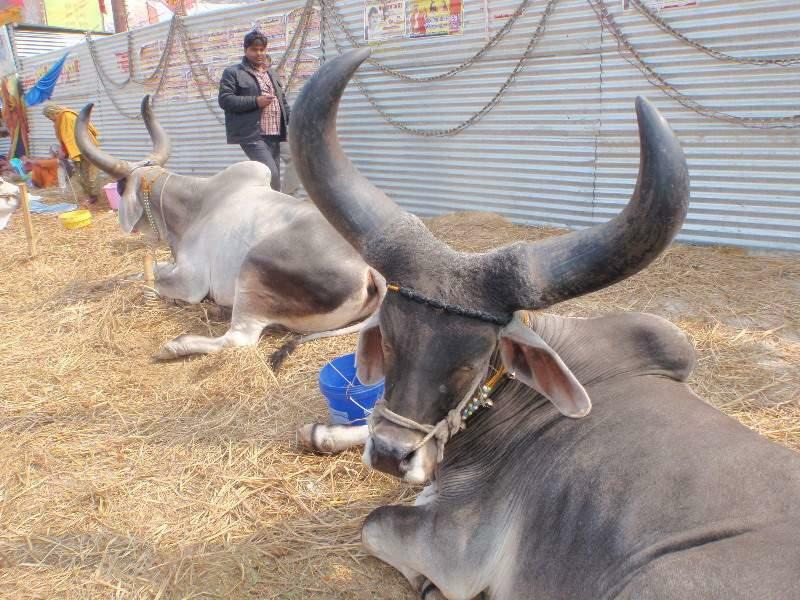 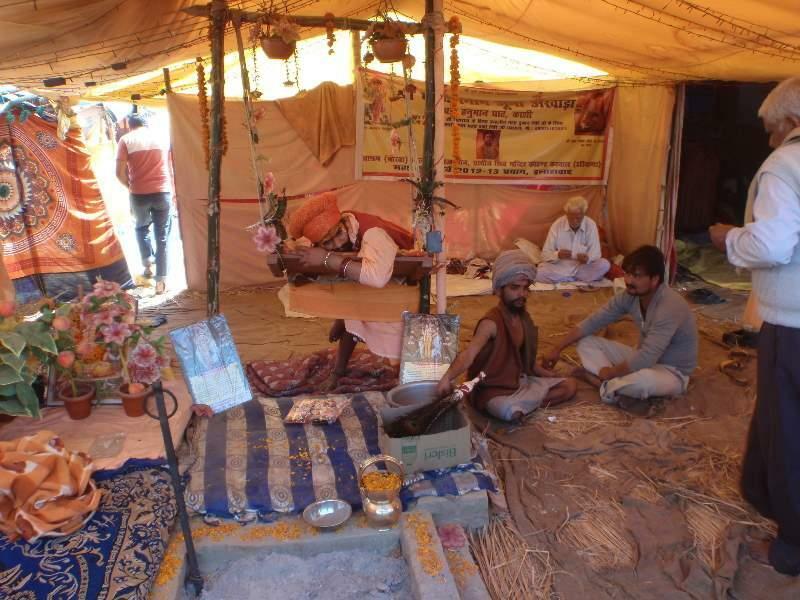 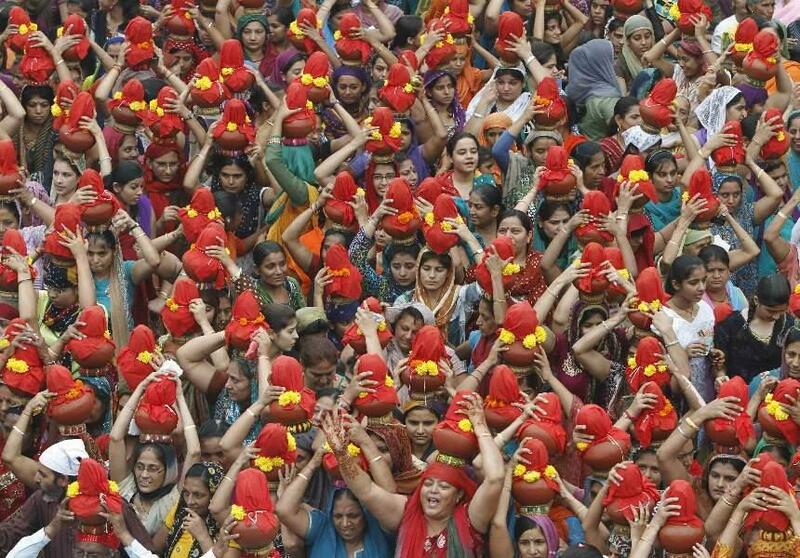 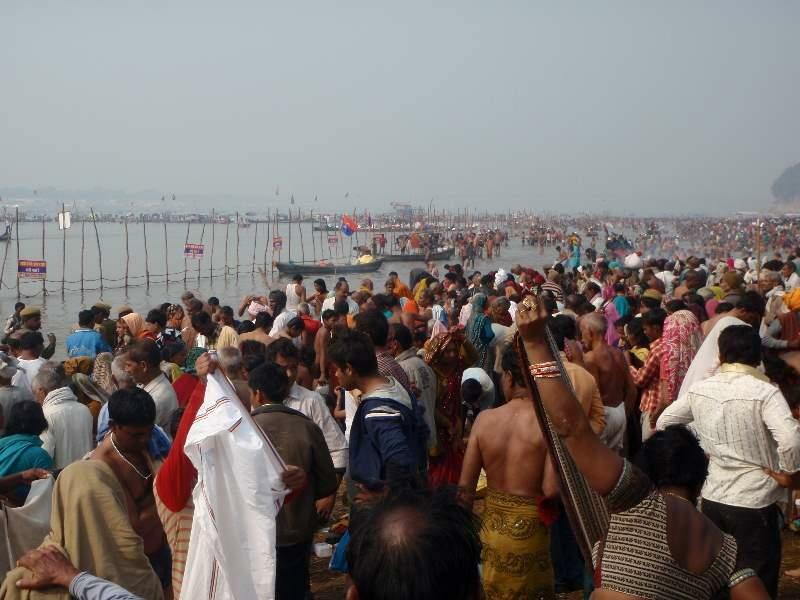 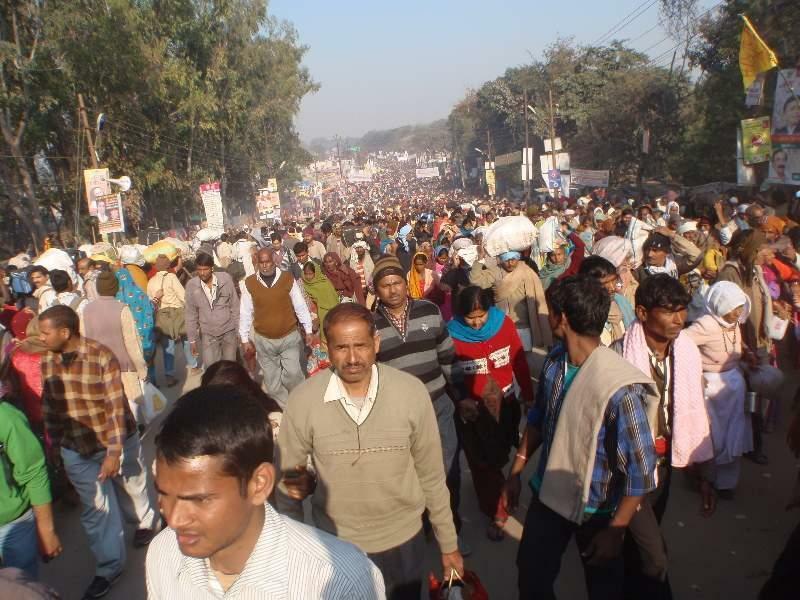 Every 6 years there is an Ardha Mela (half mela), which draws about 7 million people. 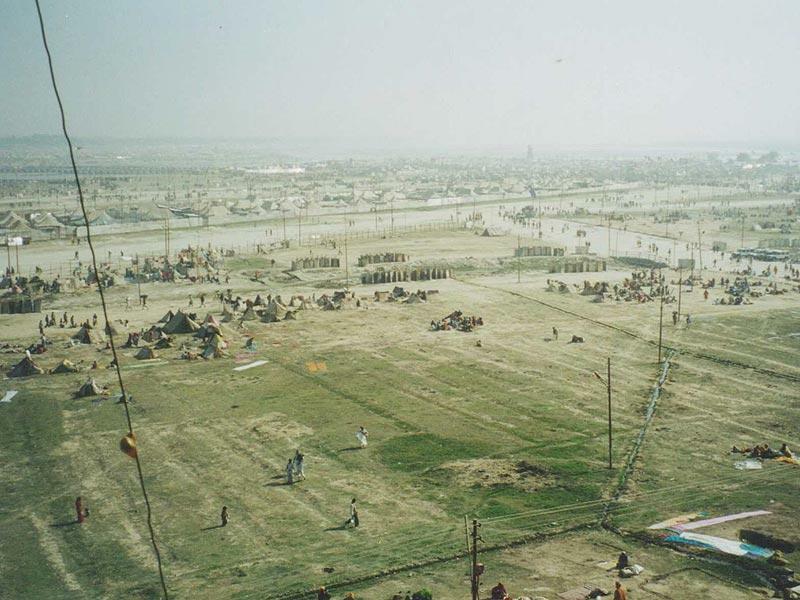 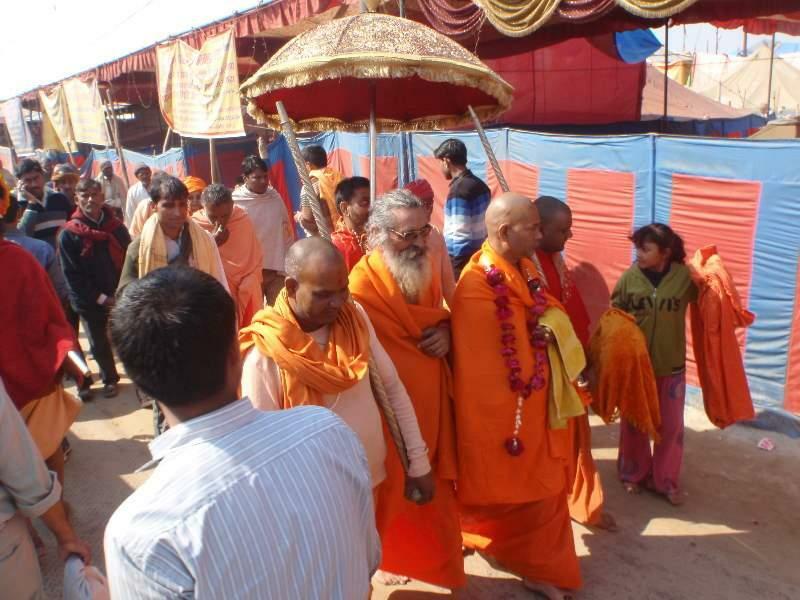 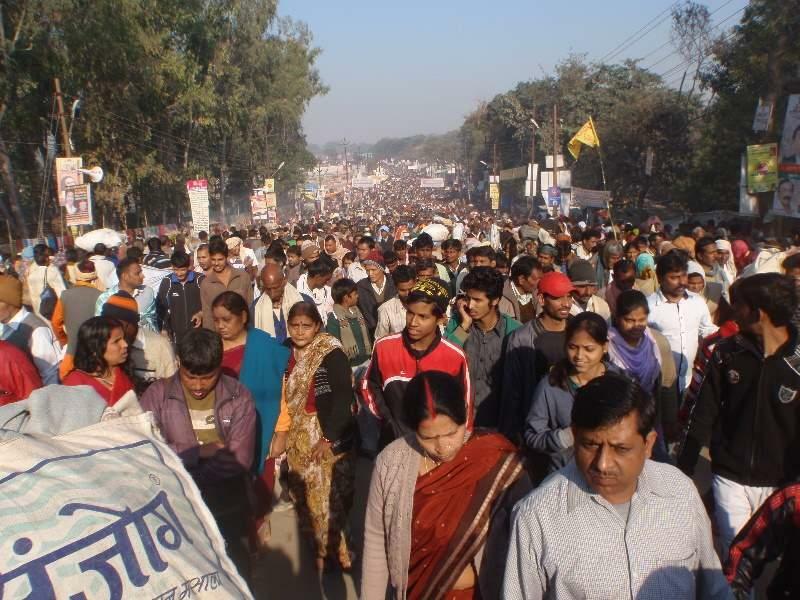 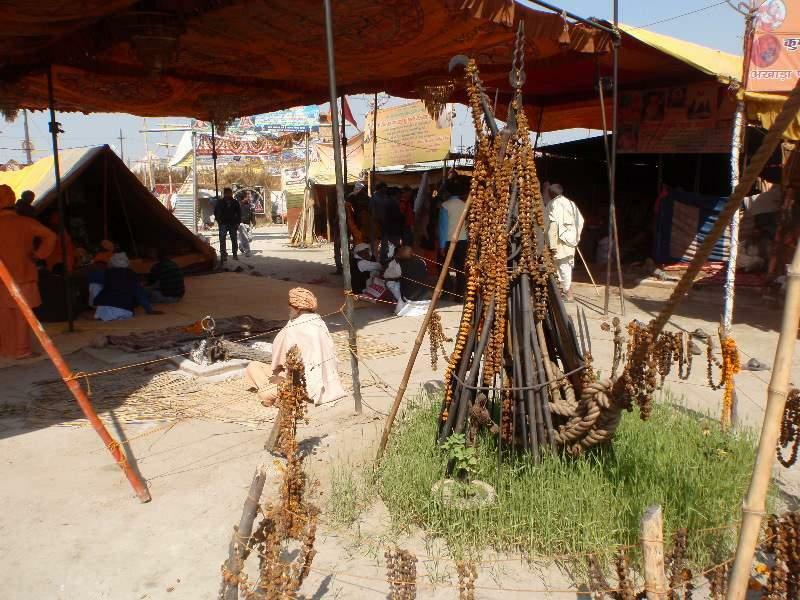 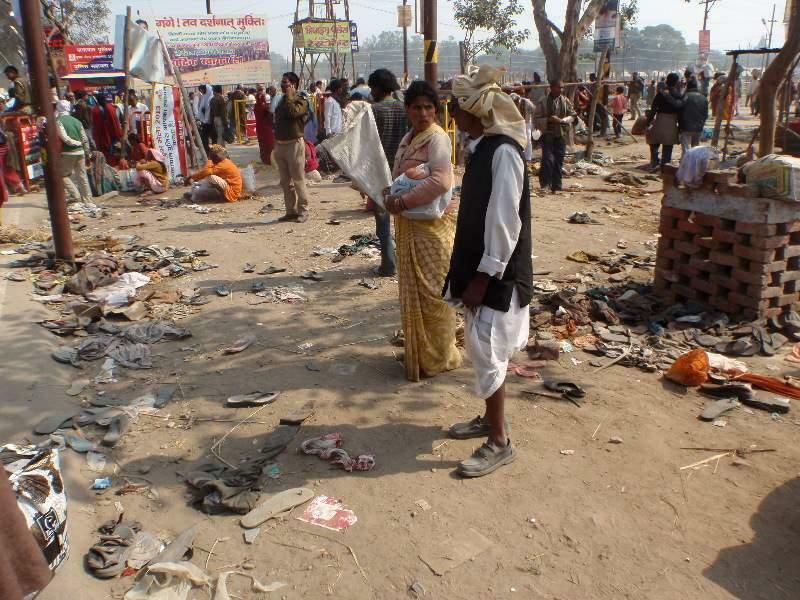 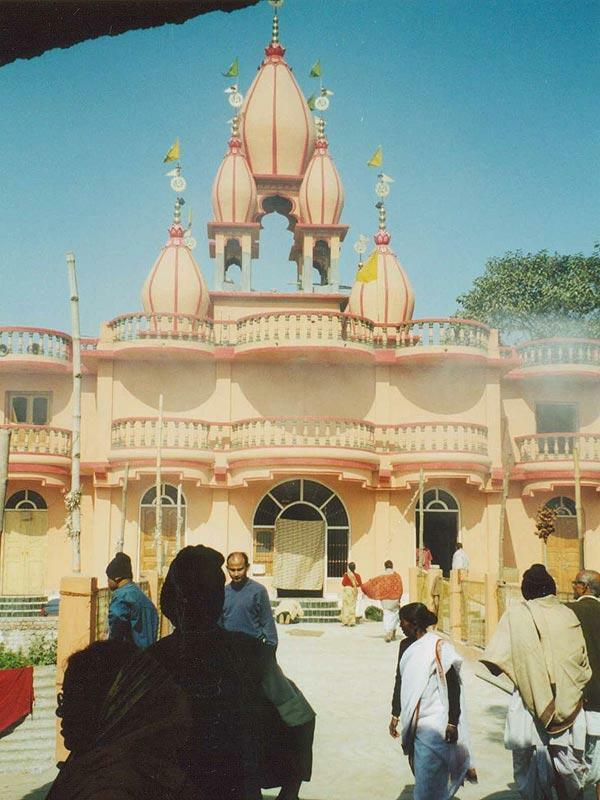 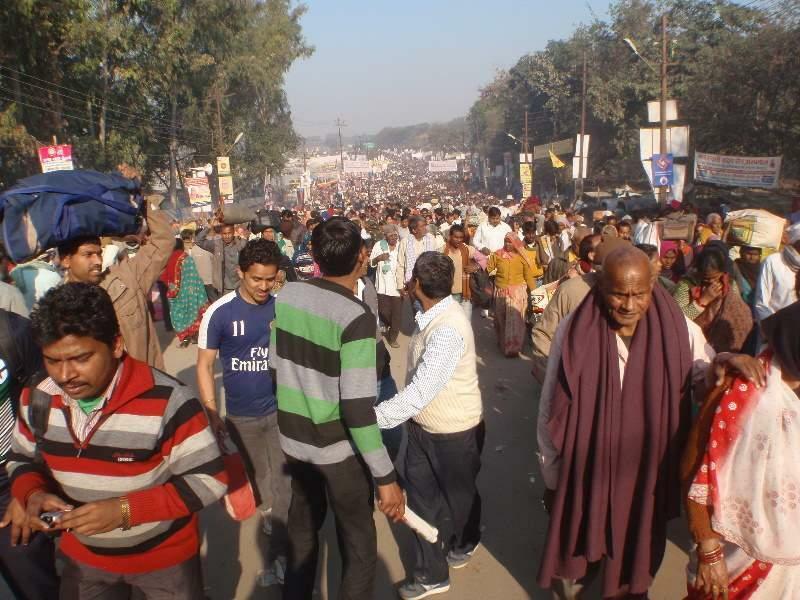 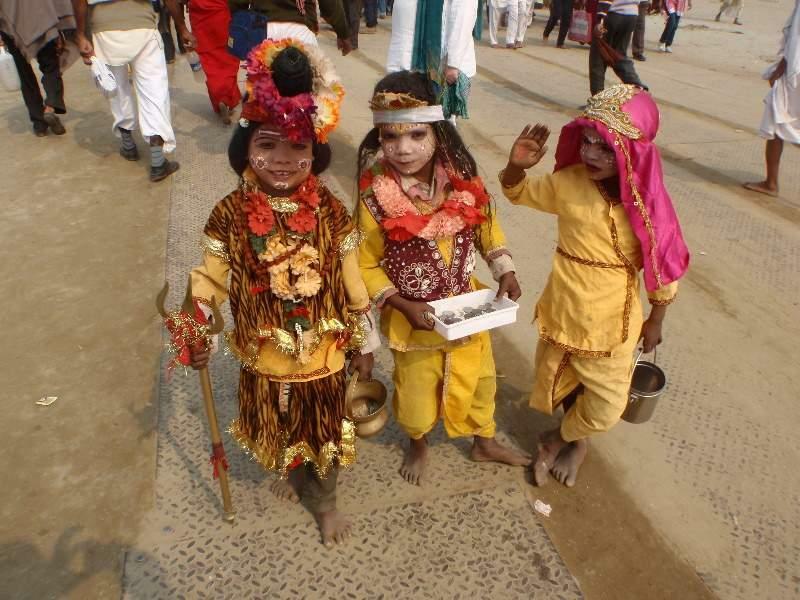 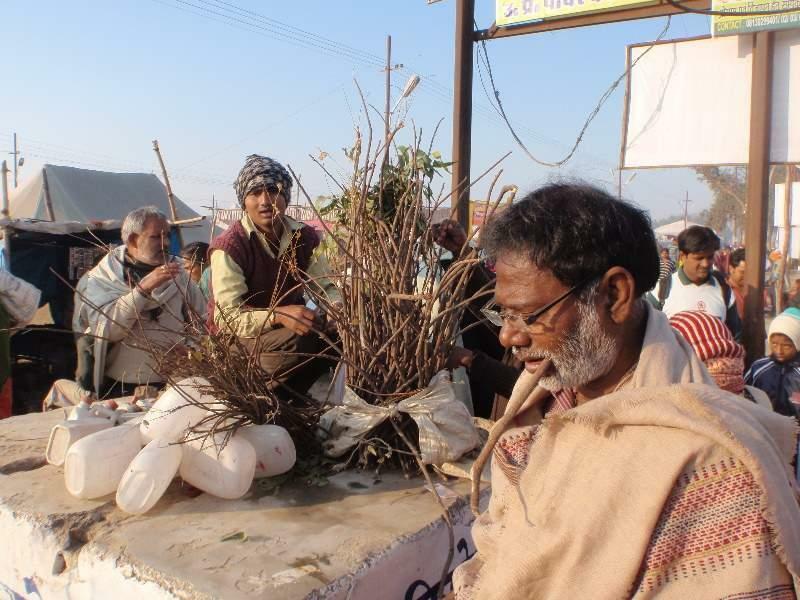 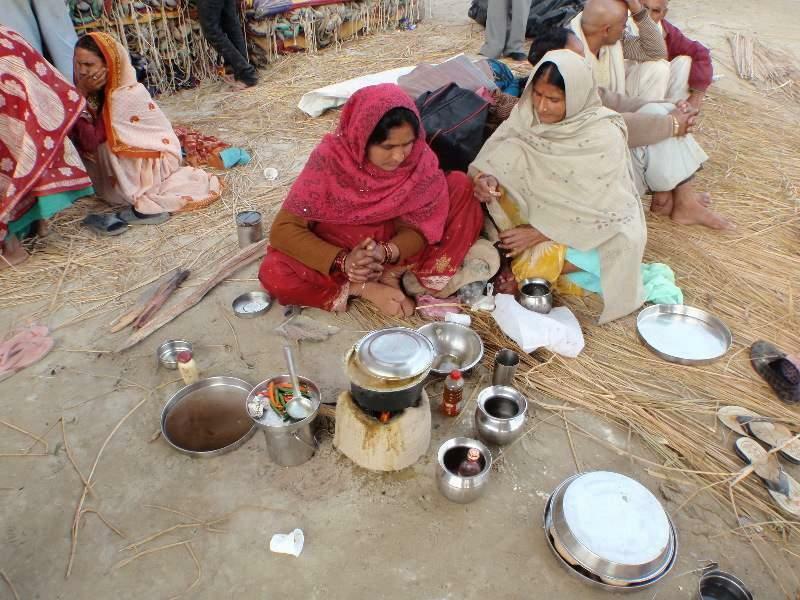 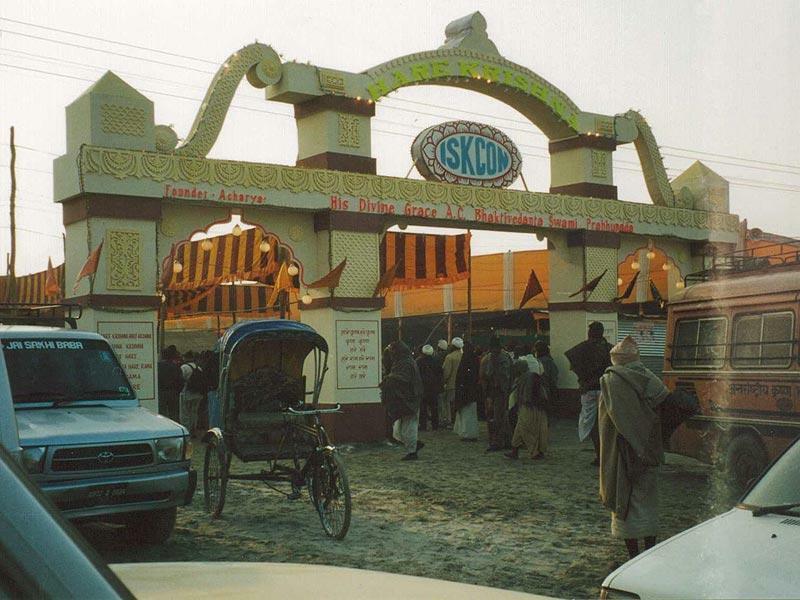 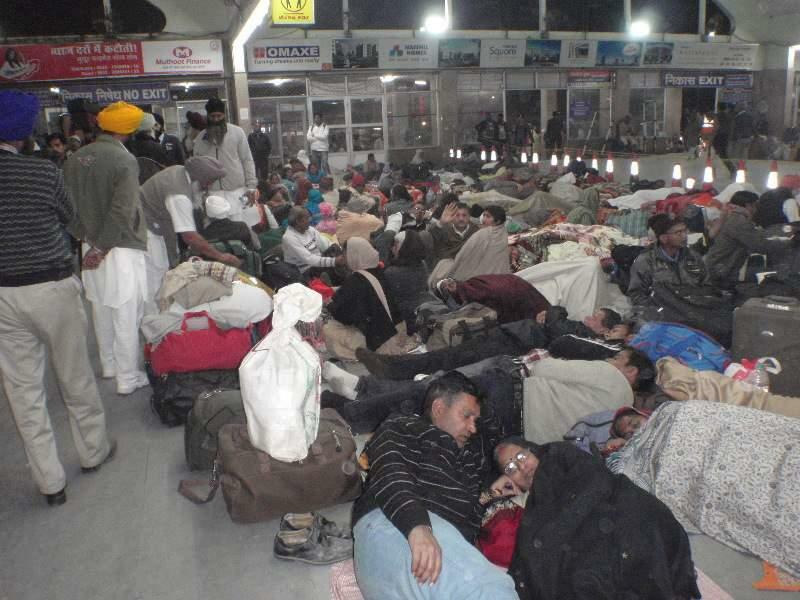 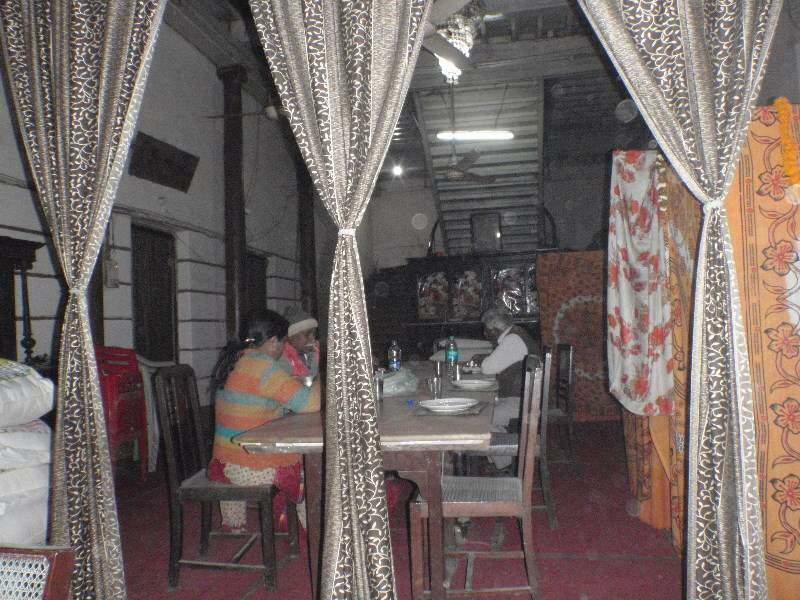 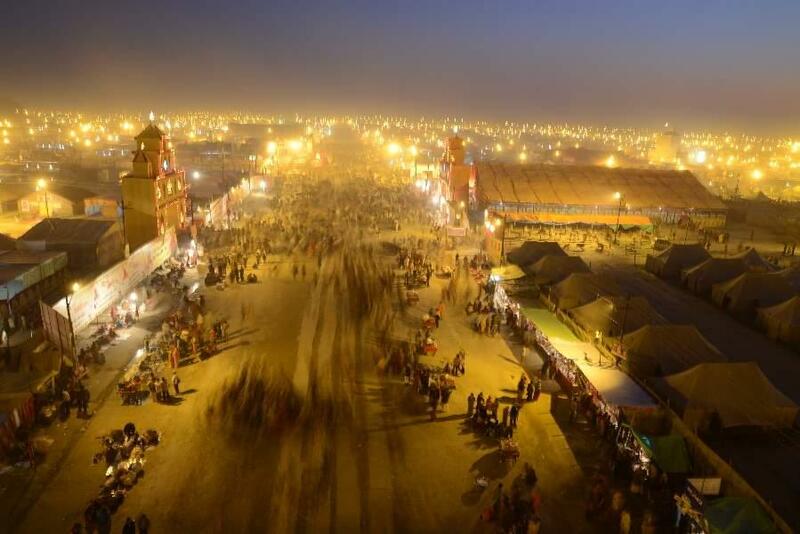 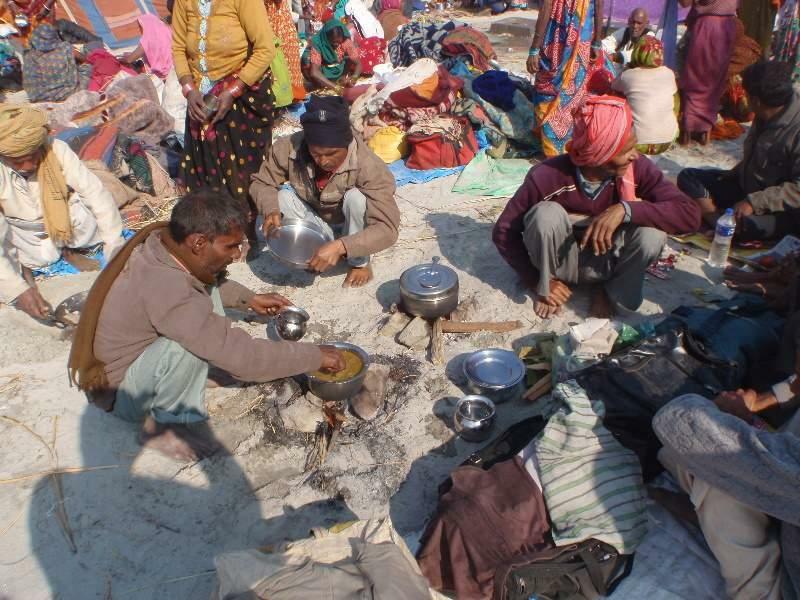 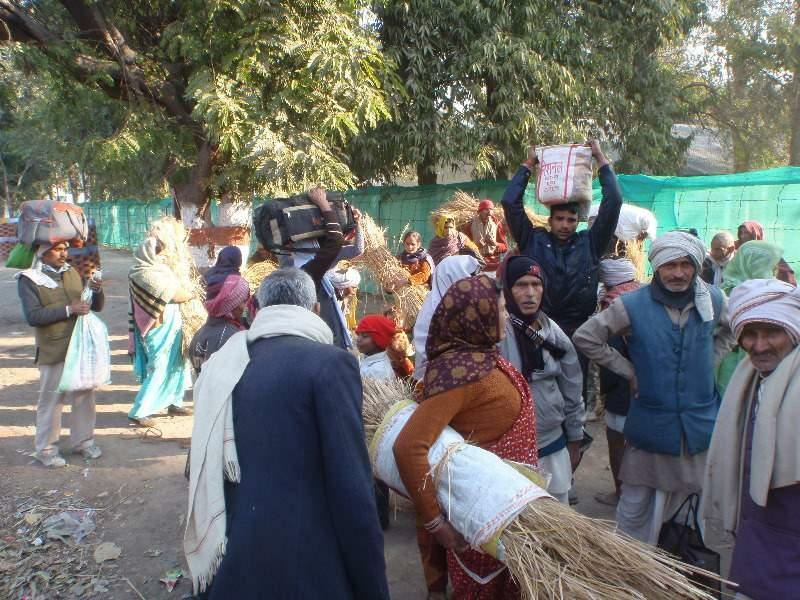 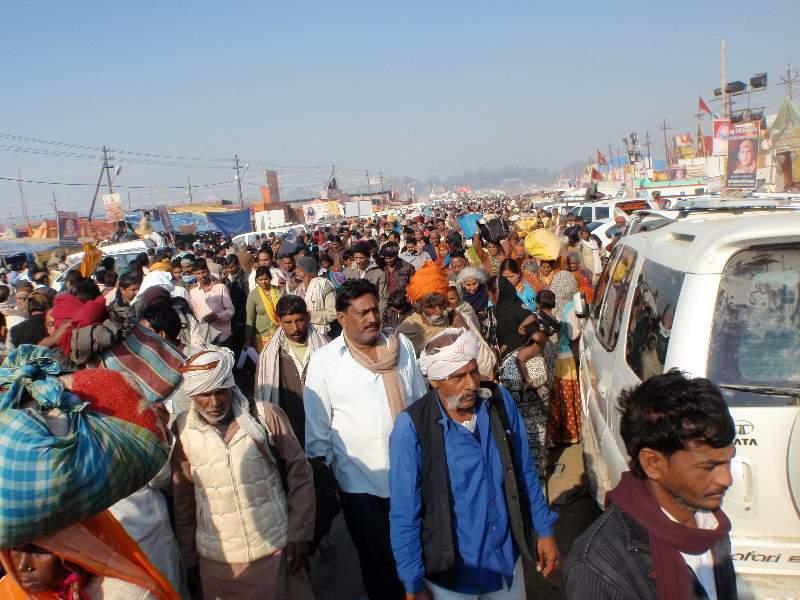 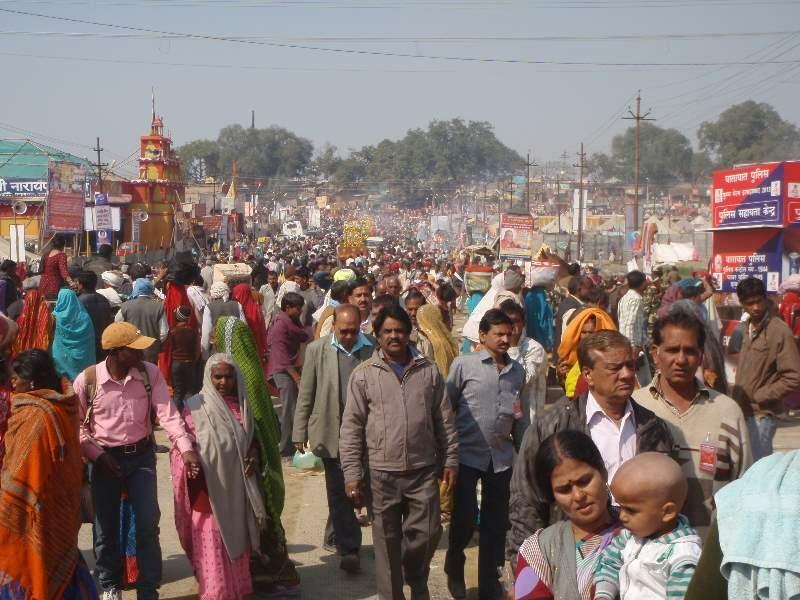 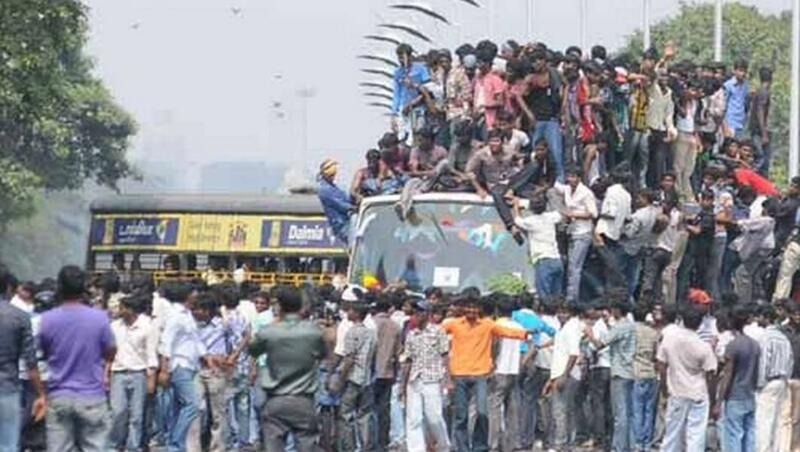 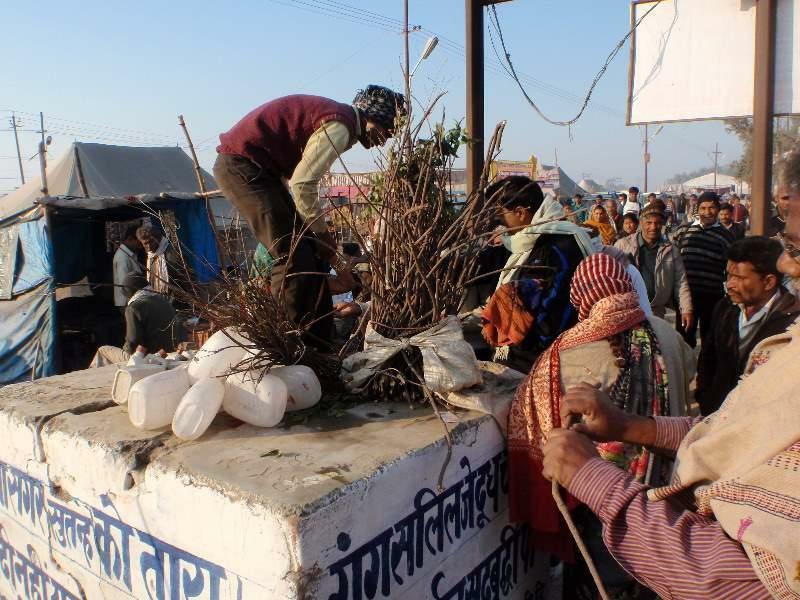 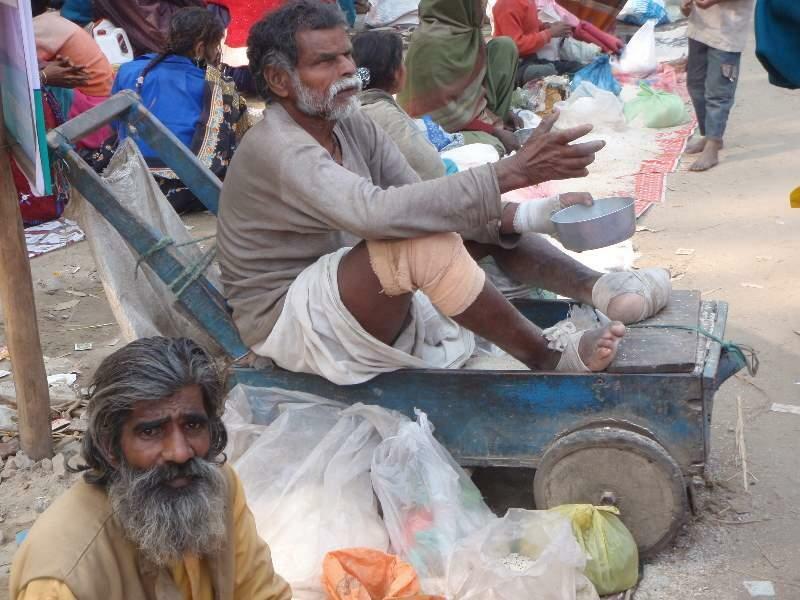 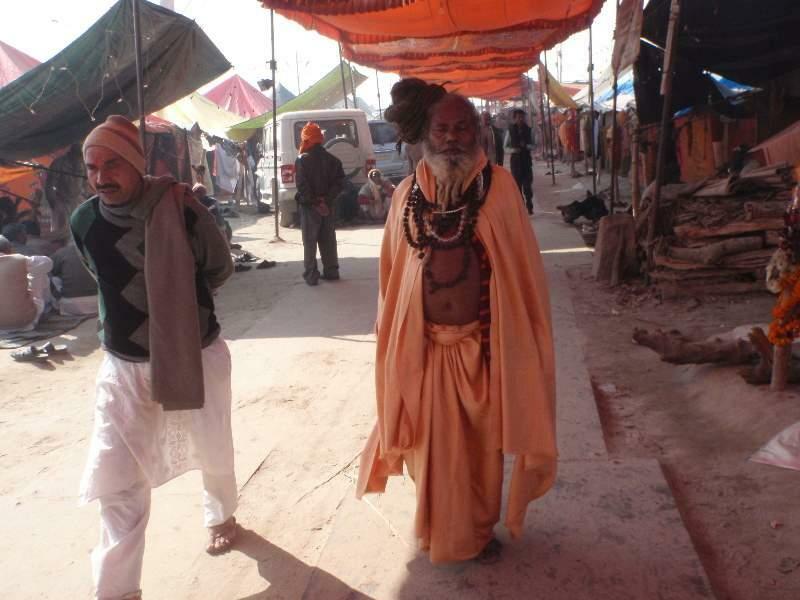 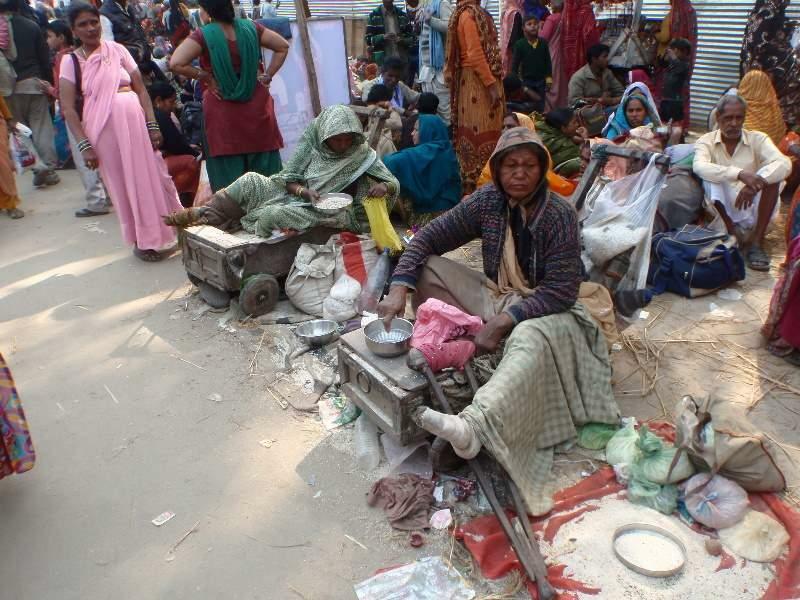 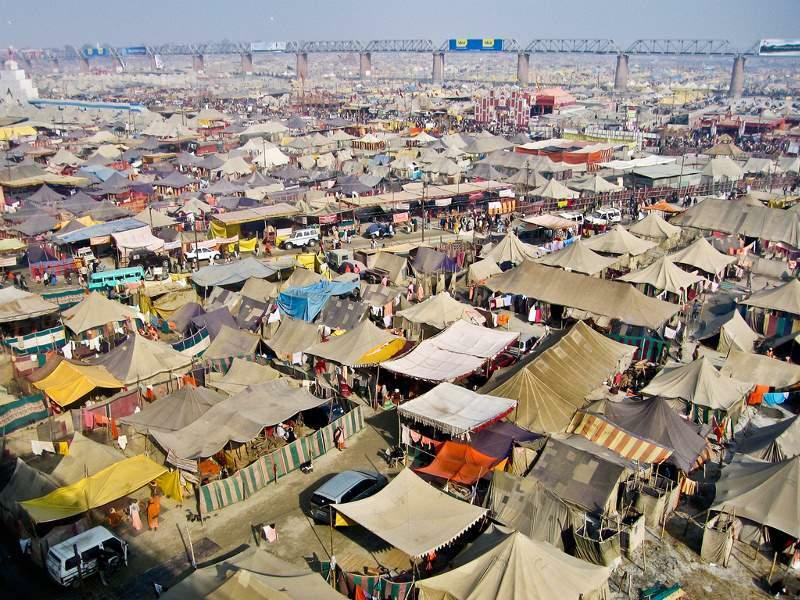 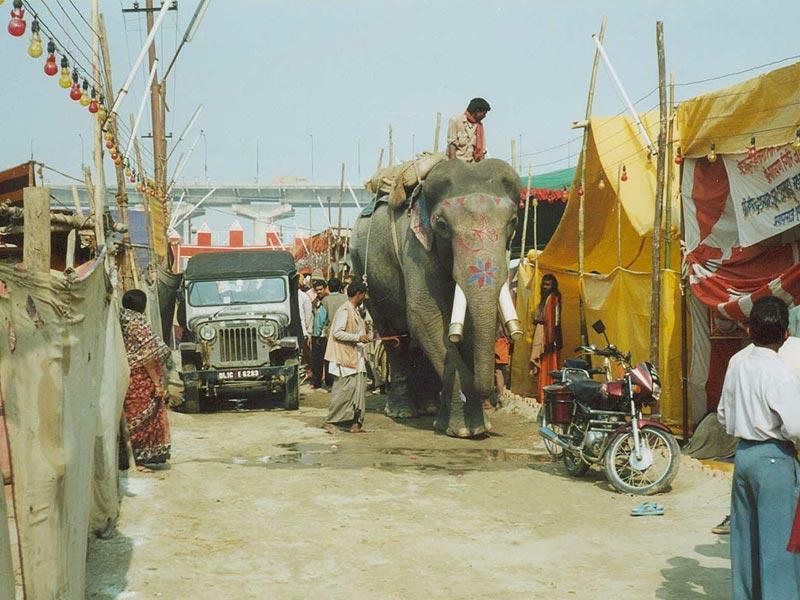 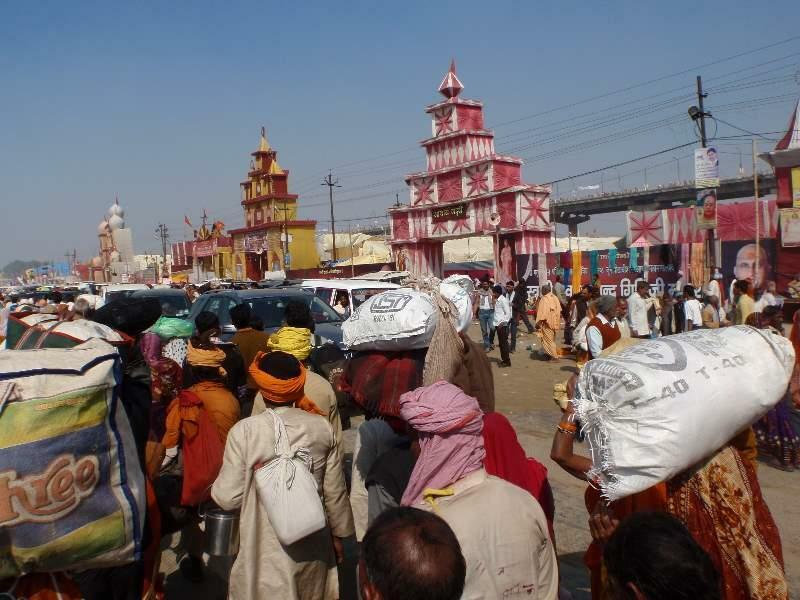 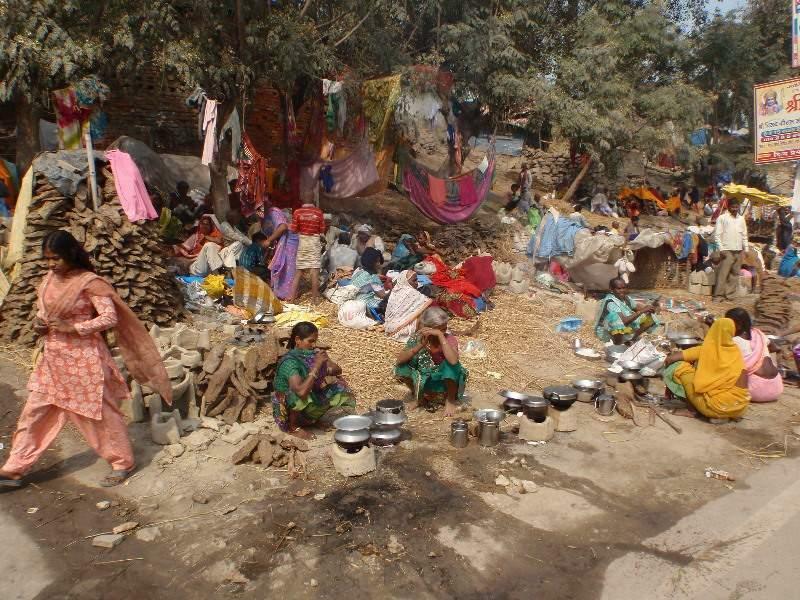 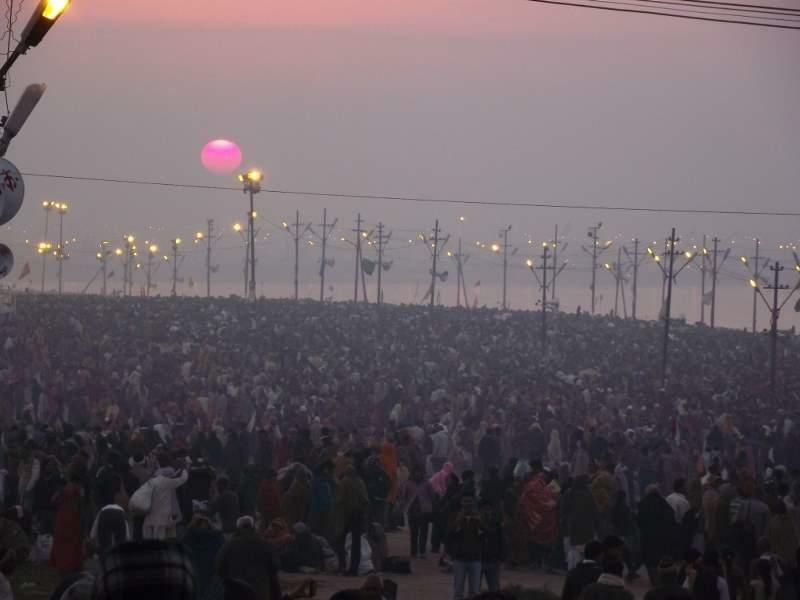 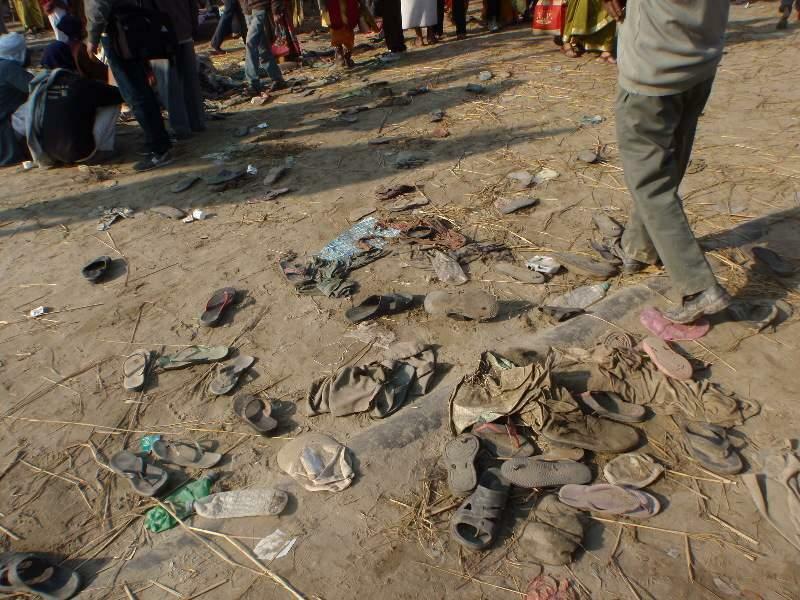 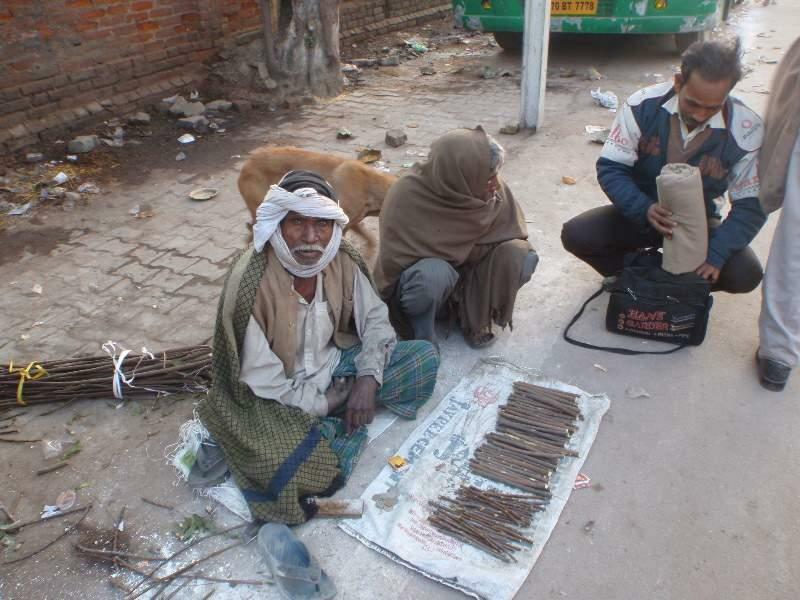 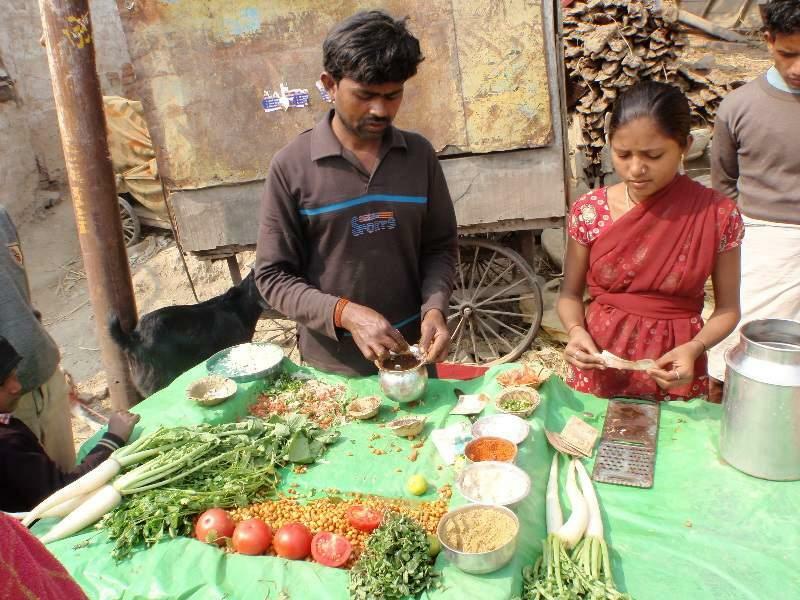 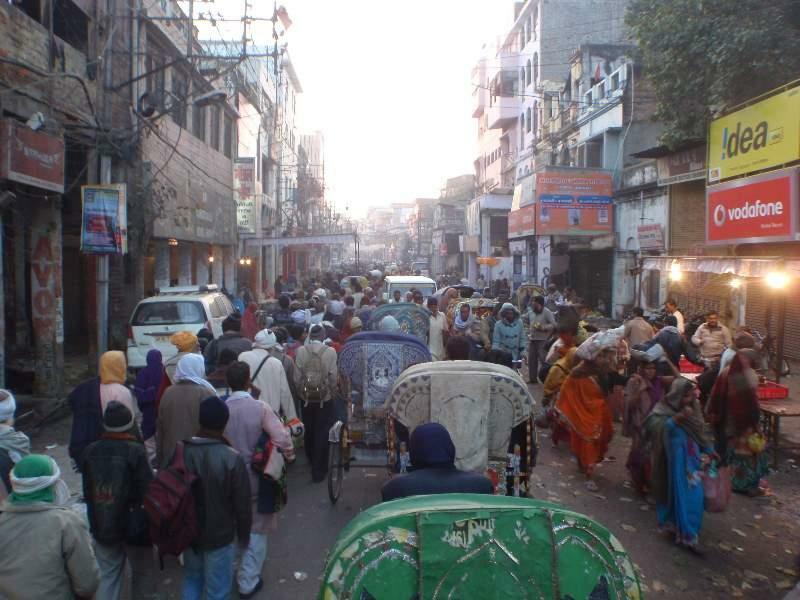 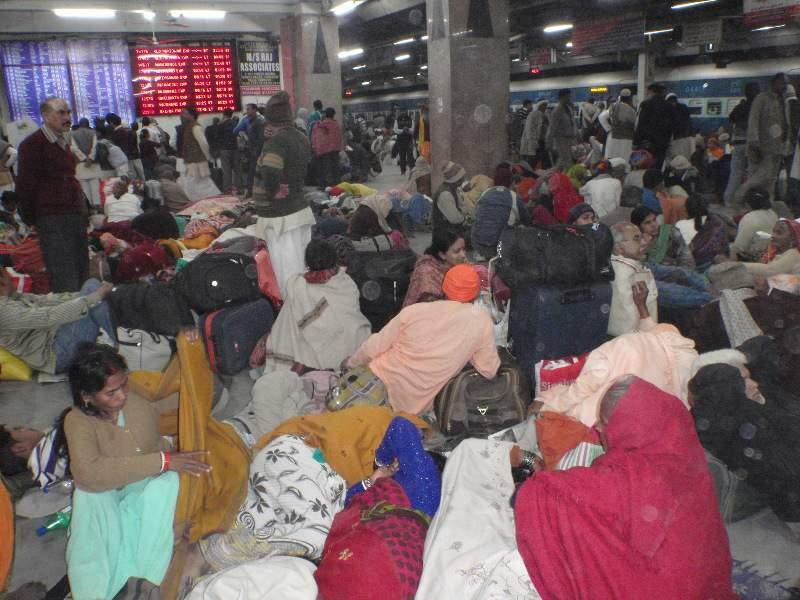 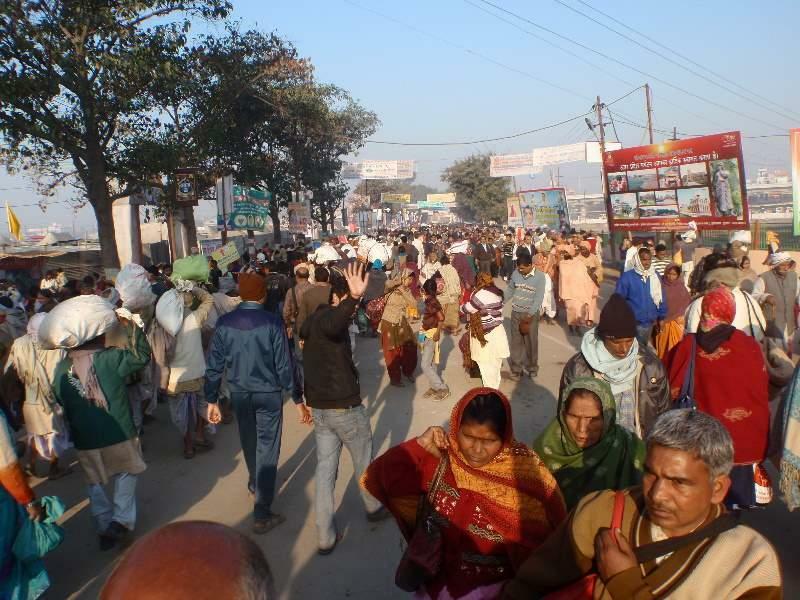 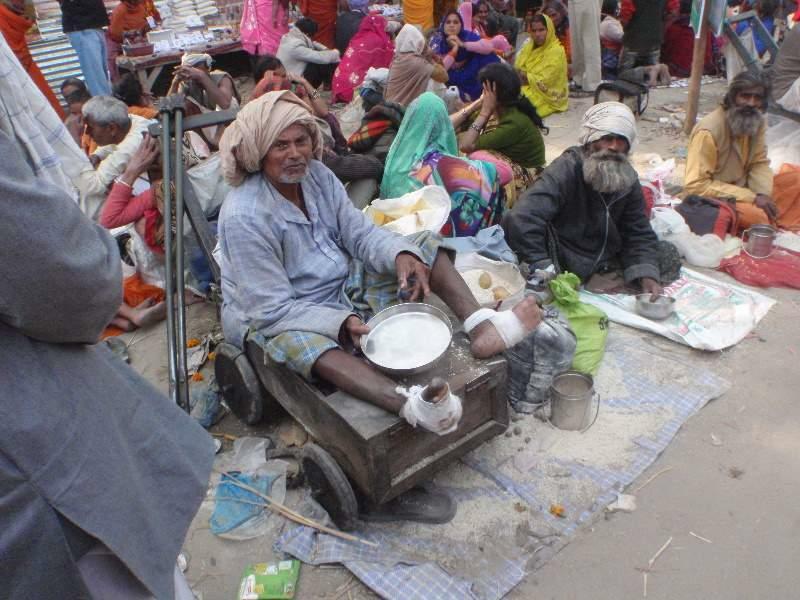 Each year there is a regular Mela during the month of Magh, January-February, which draws one or two million people. 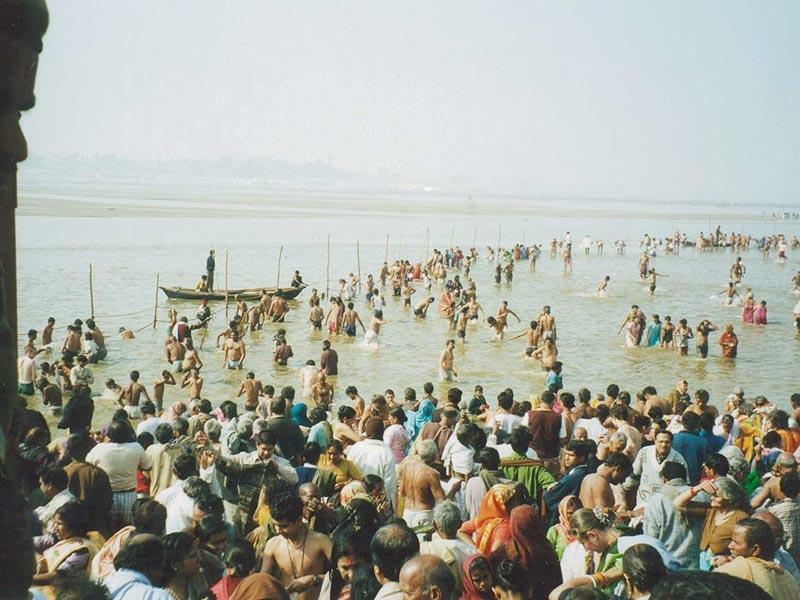 One of the most auspicious bathing days is Amavasya, the new moon day. 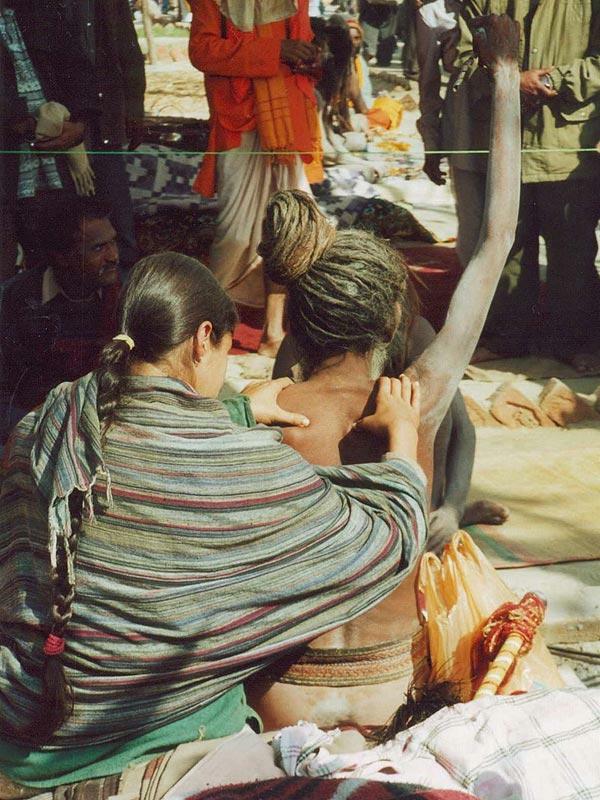 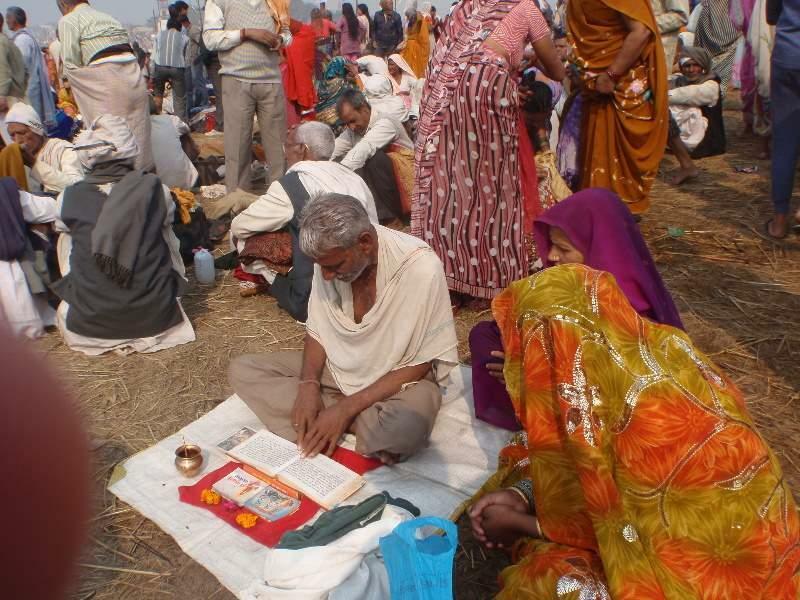 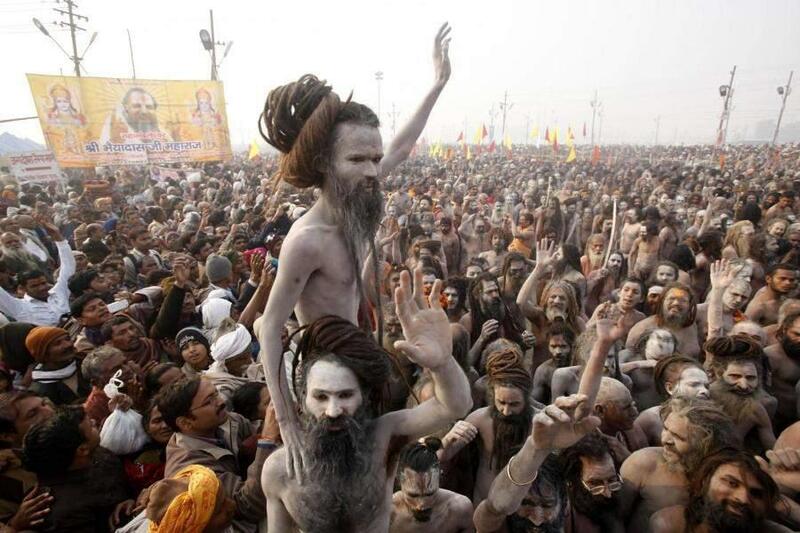 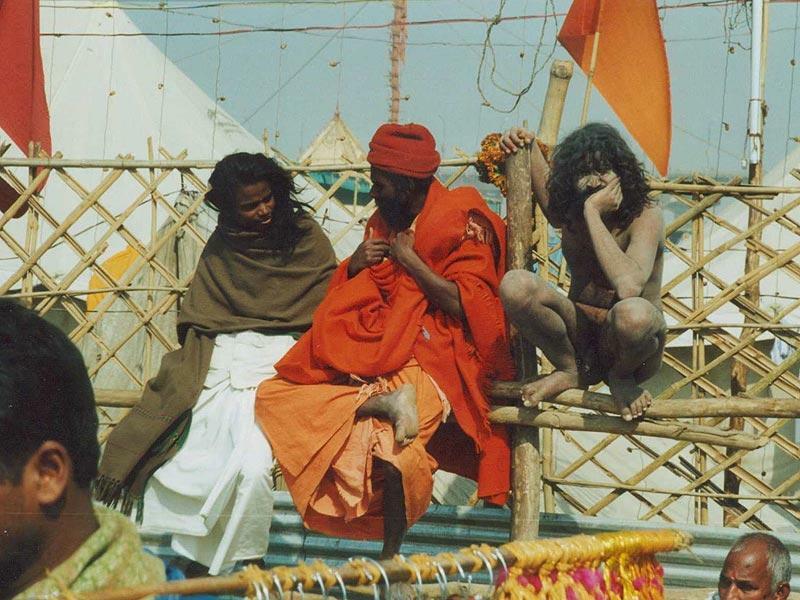 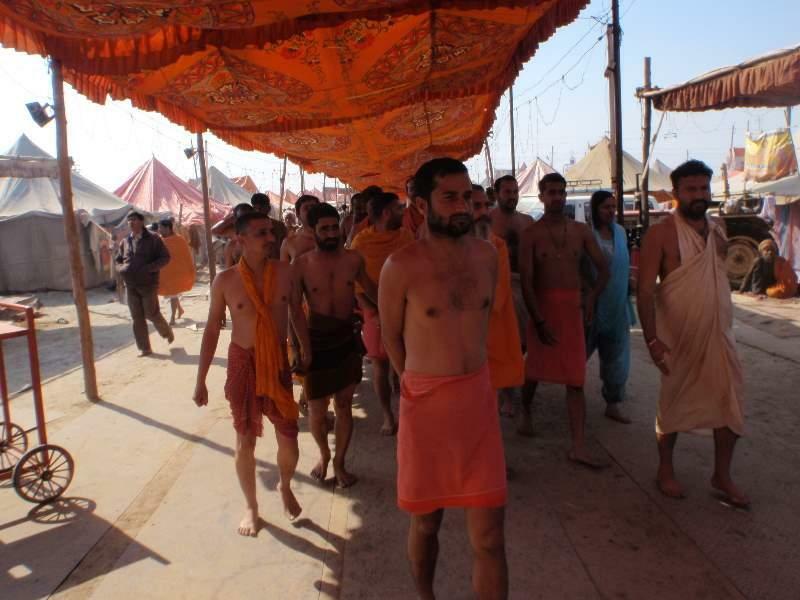 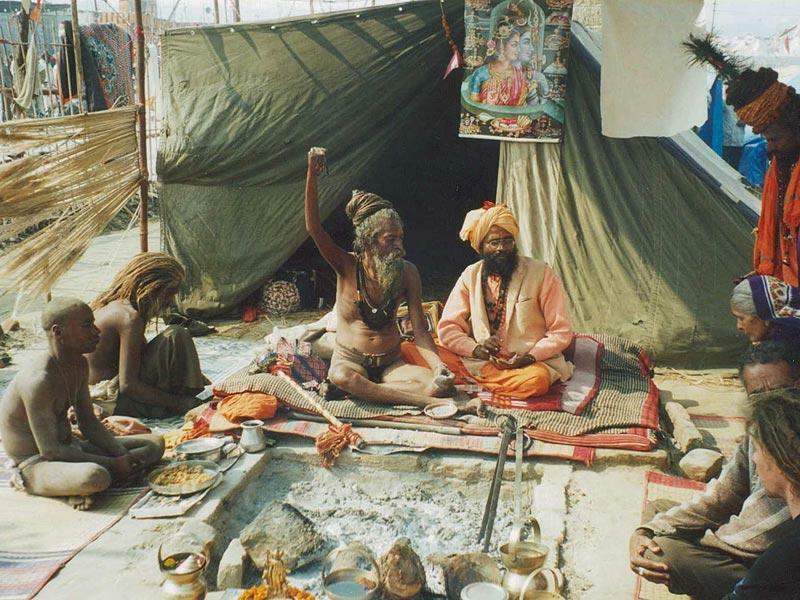 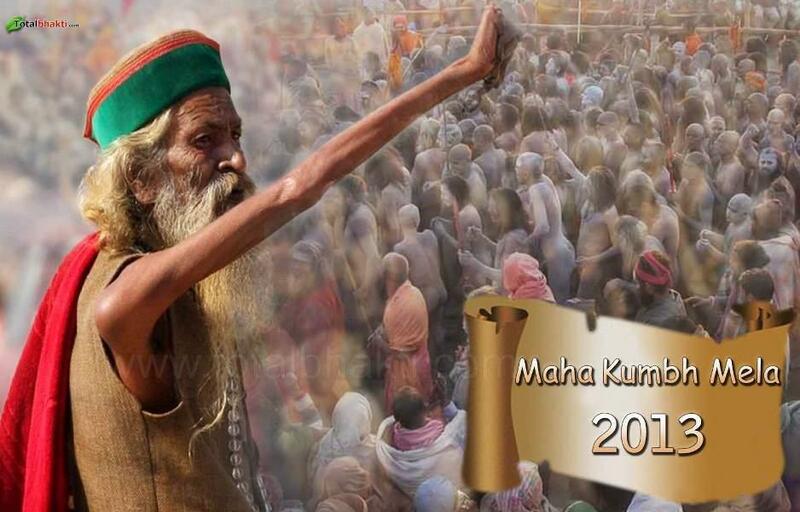 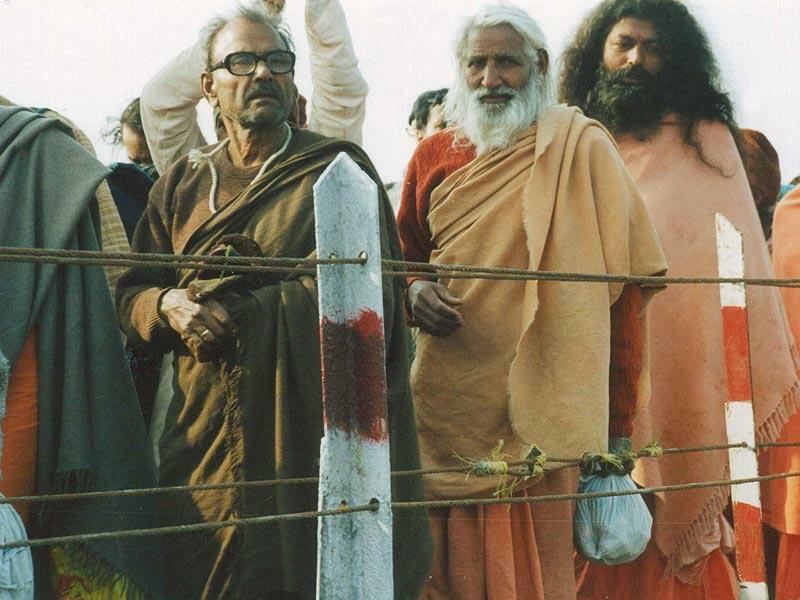 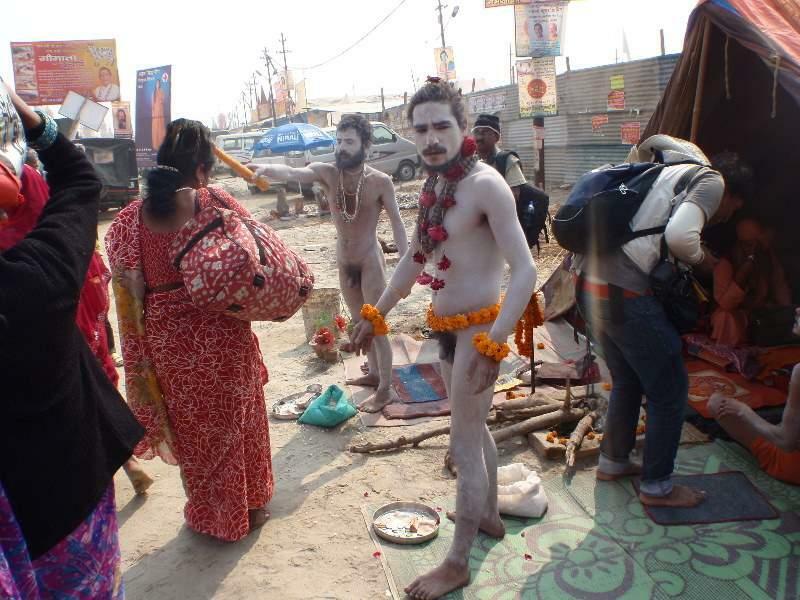 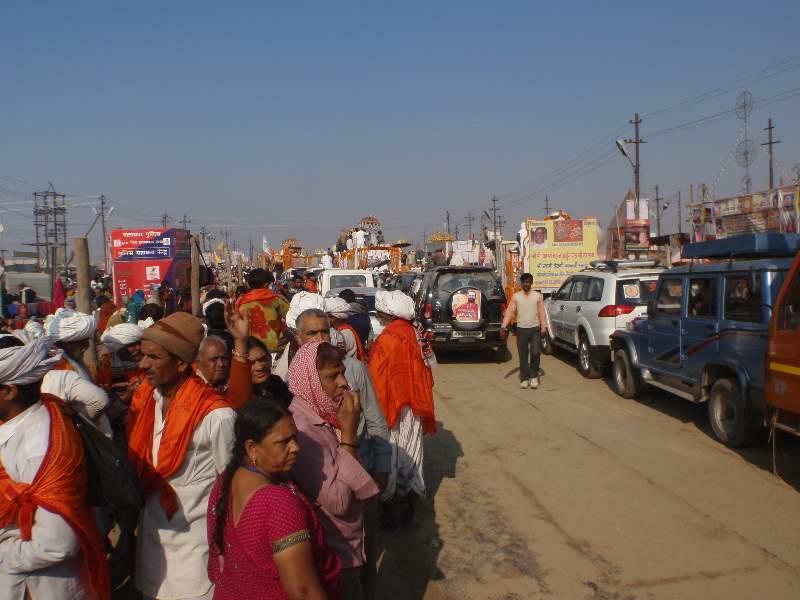 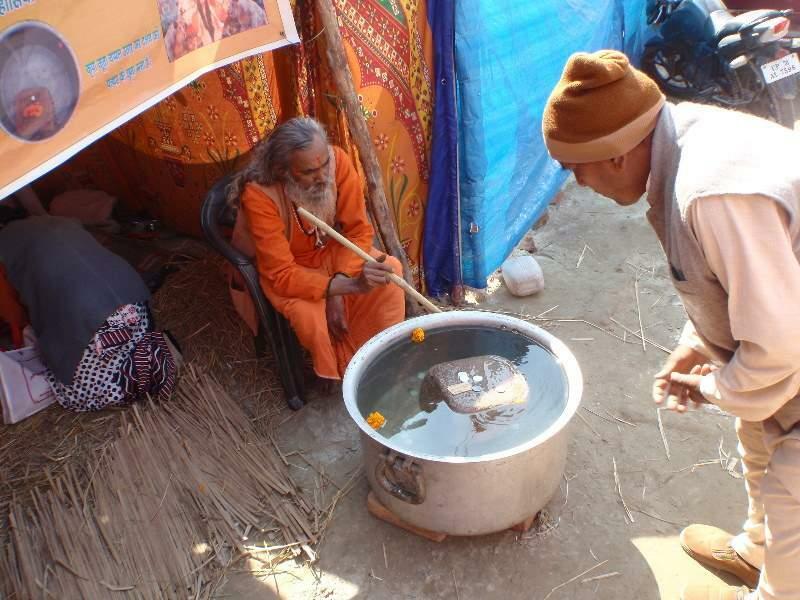 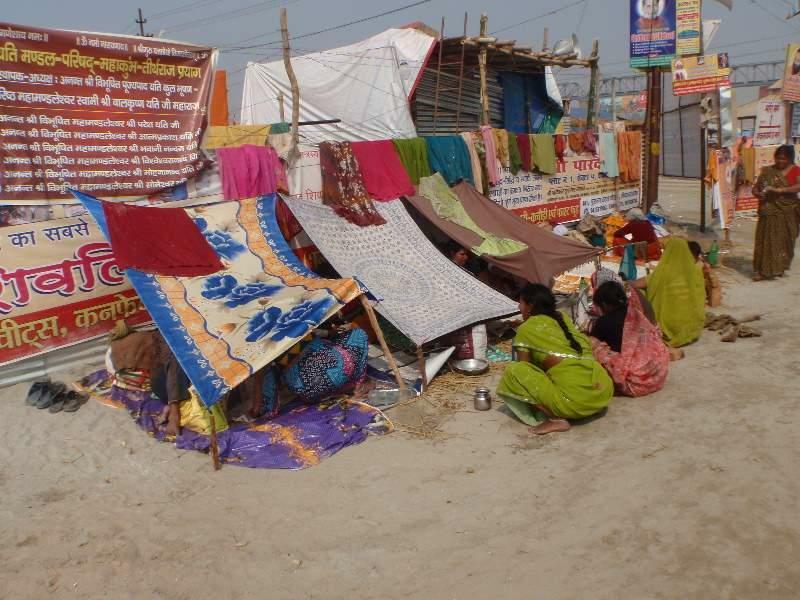 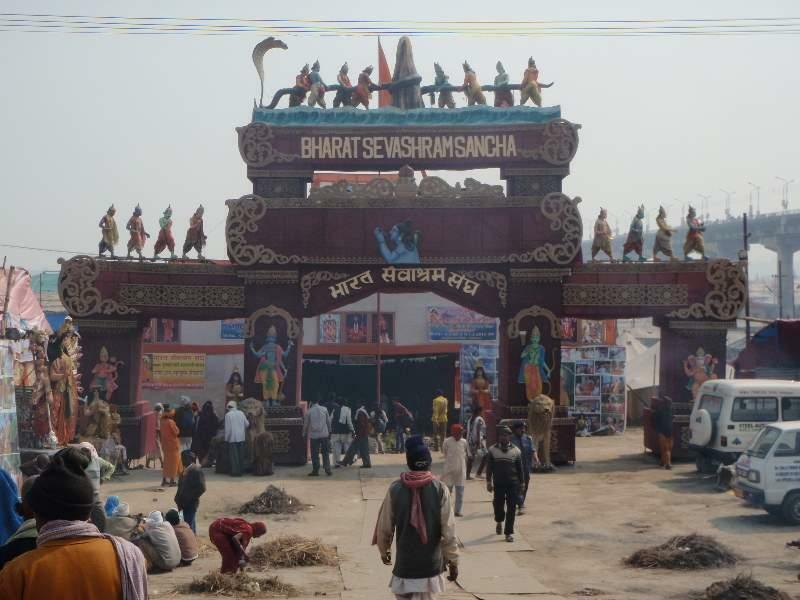 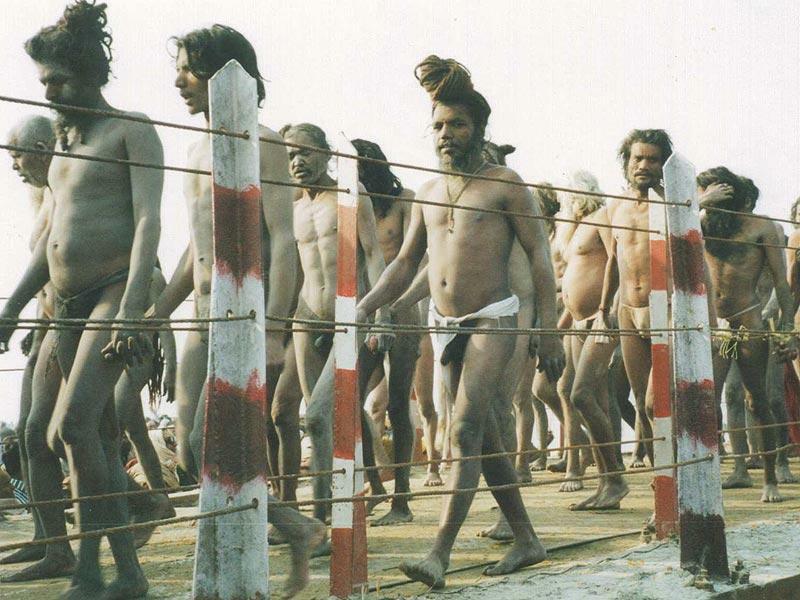 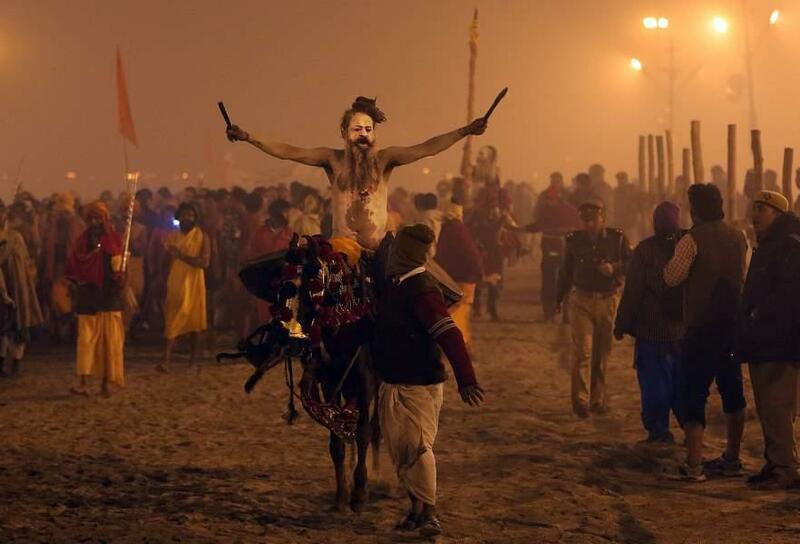 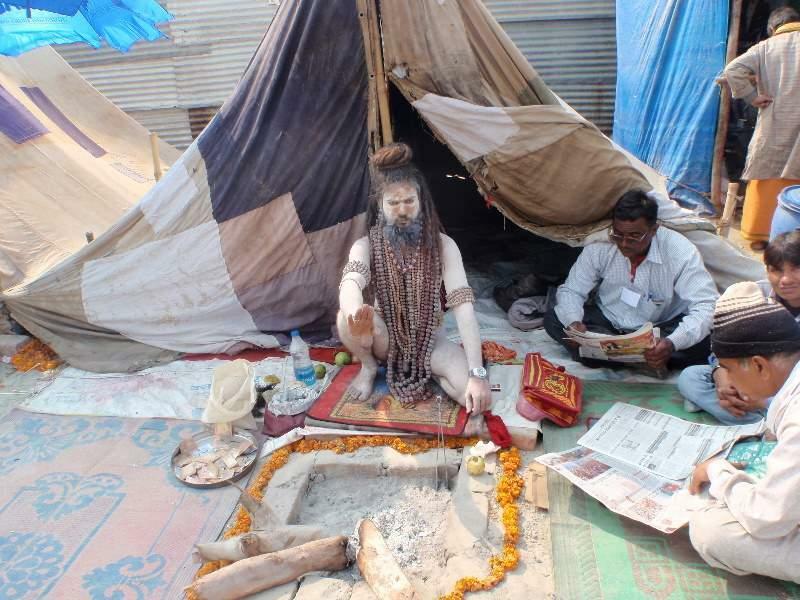 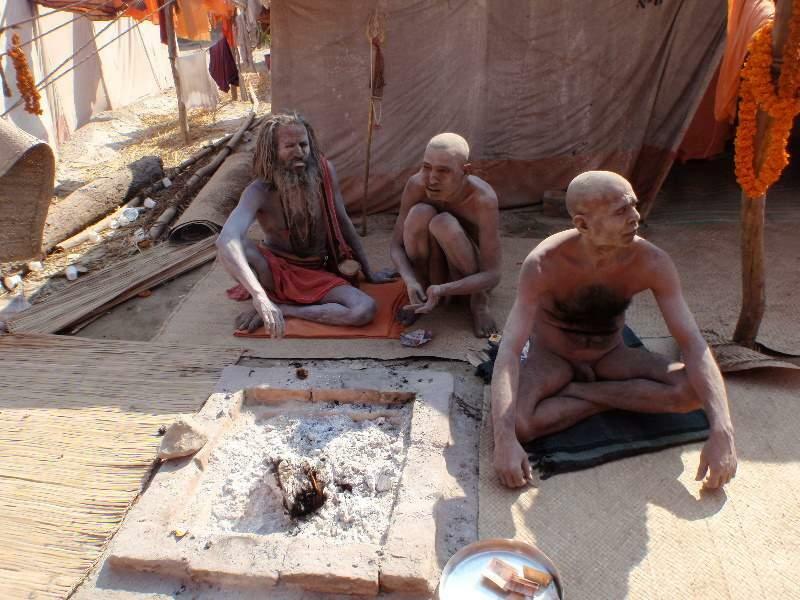 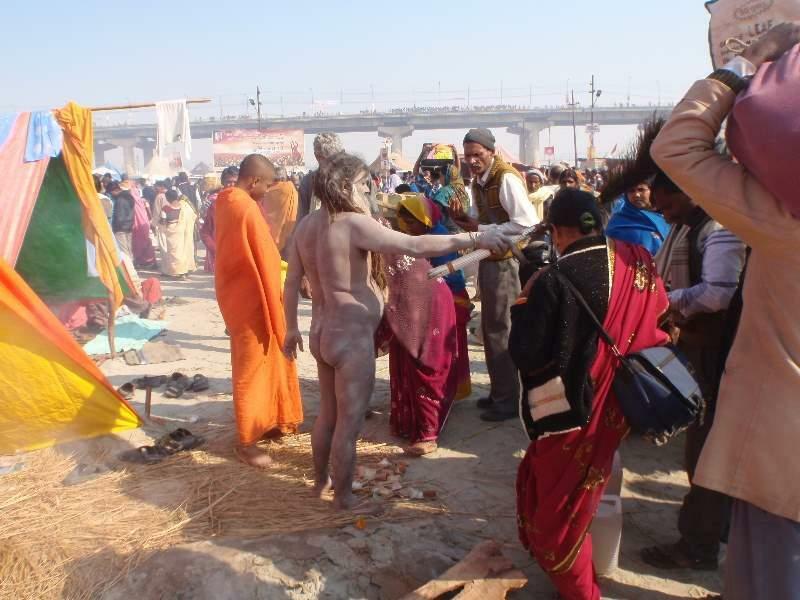 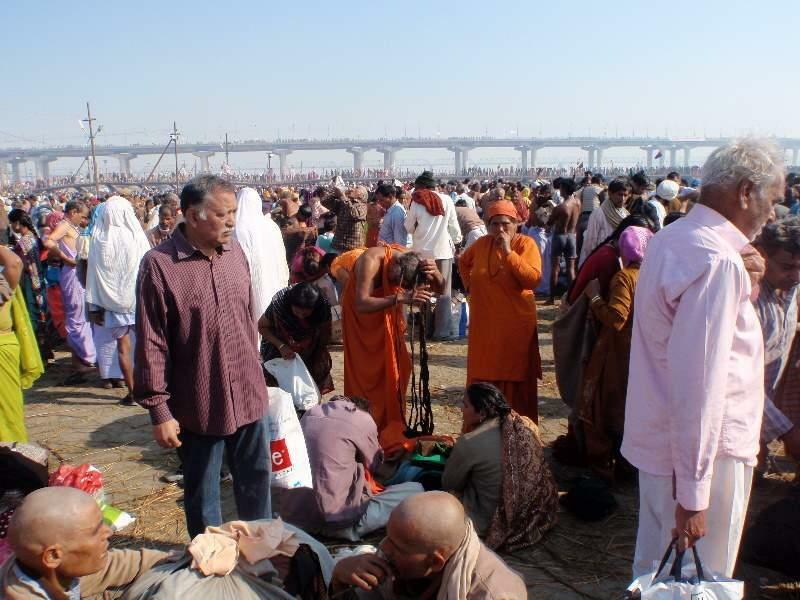 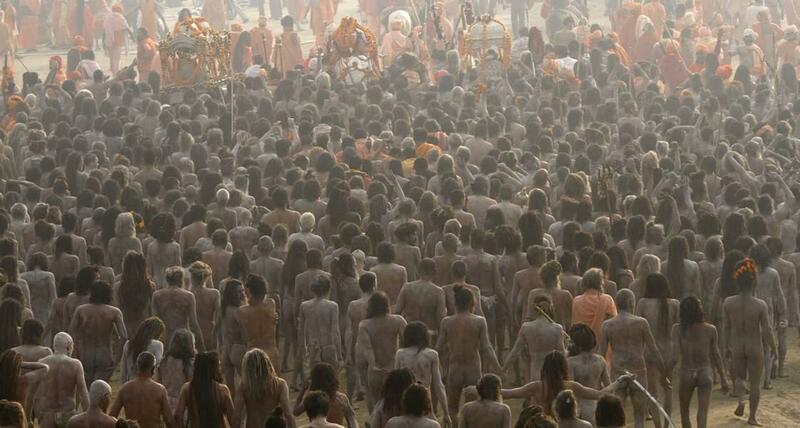 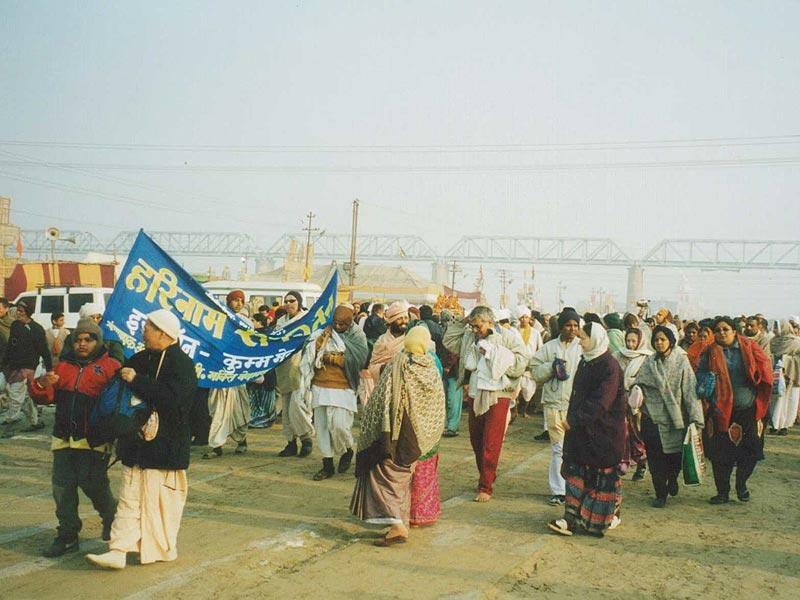 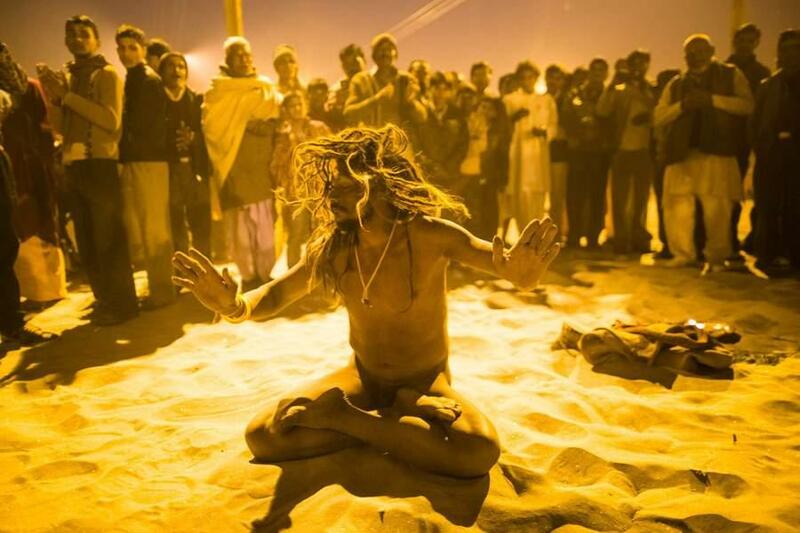 Kumbha Mela is like a “Yogi Convention,” where yogis, sadhus (saints), holy people, and pilgrims come from all over India. 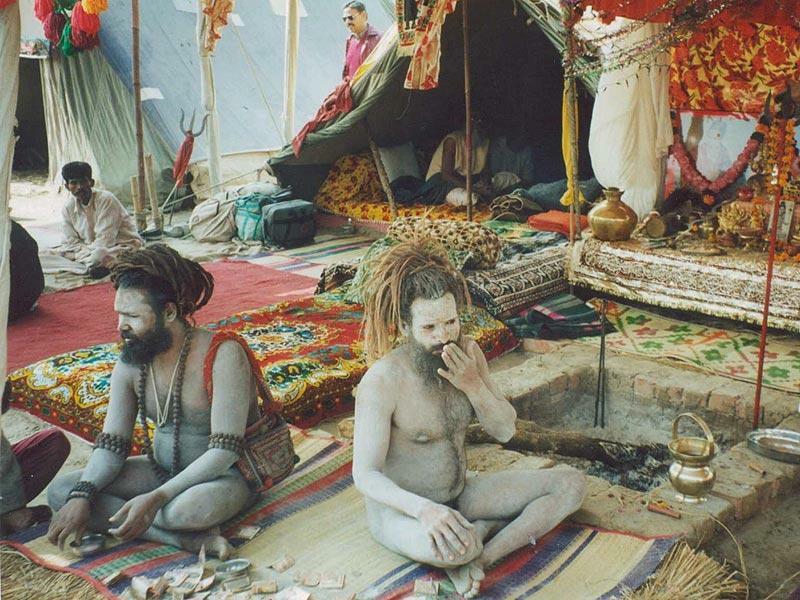 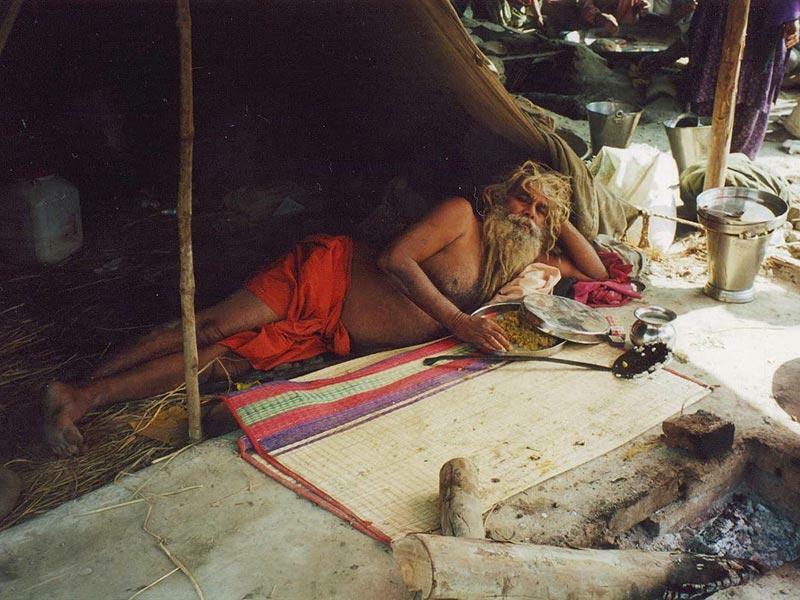 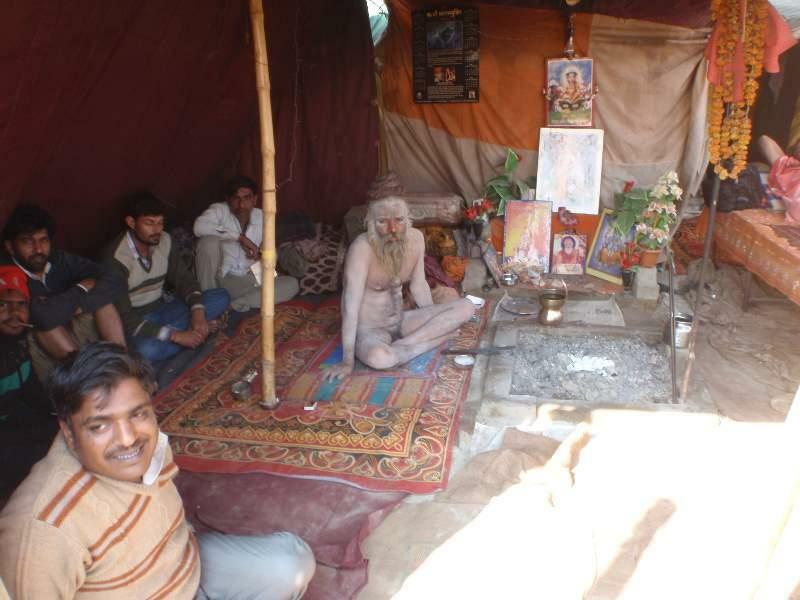 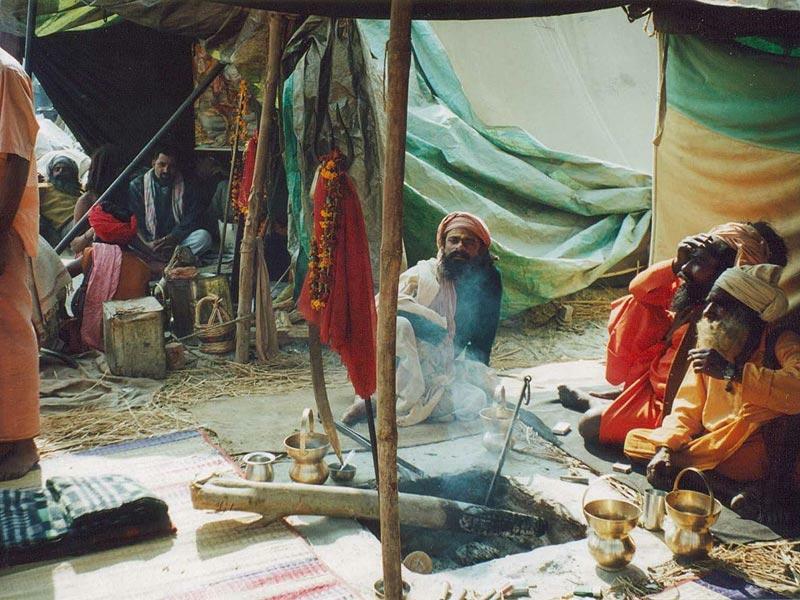 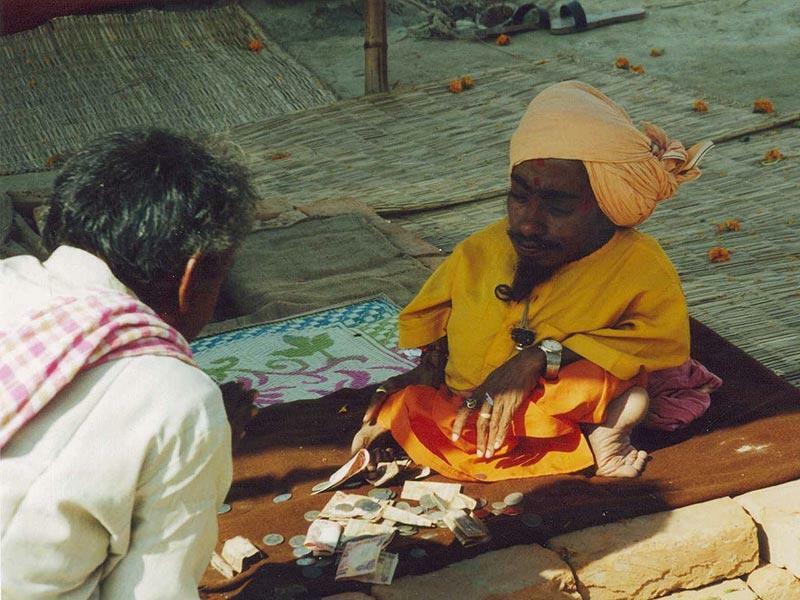 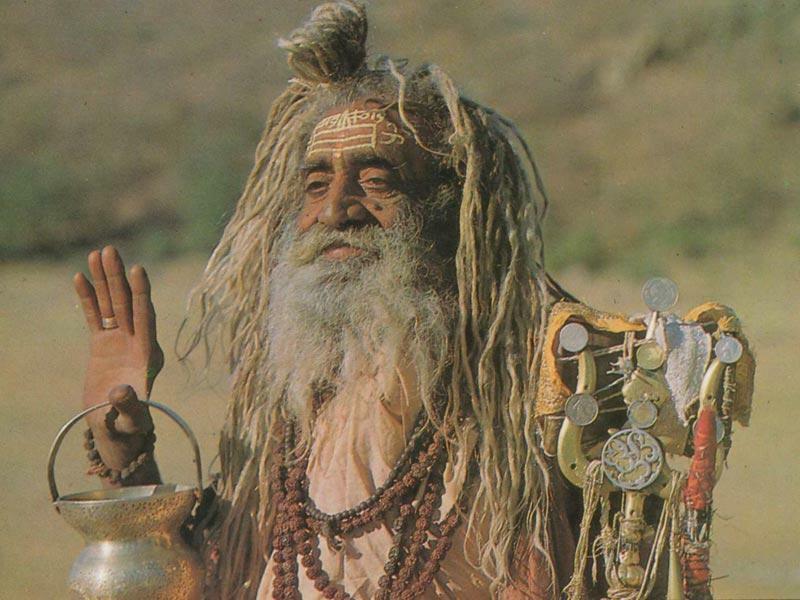 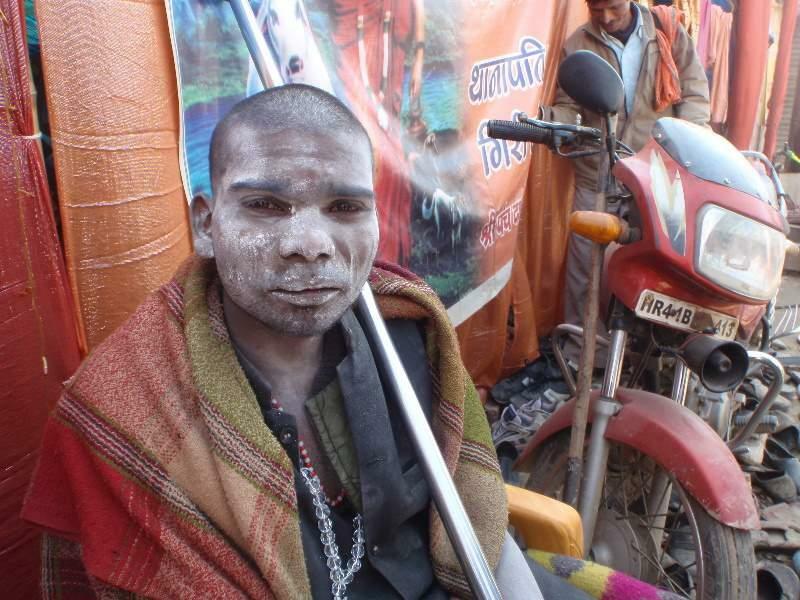 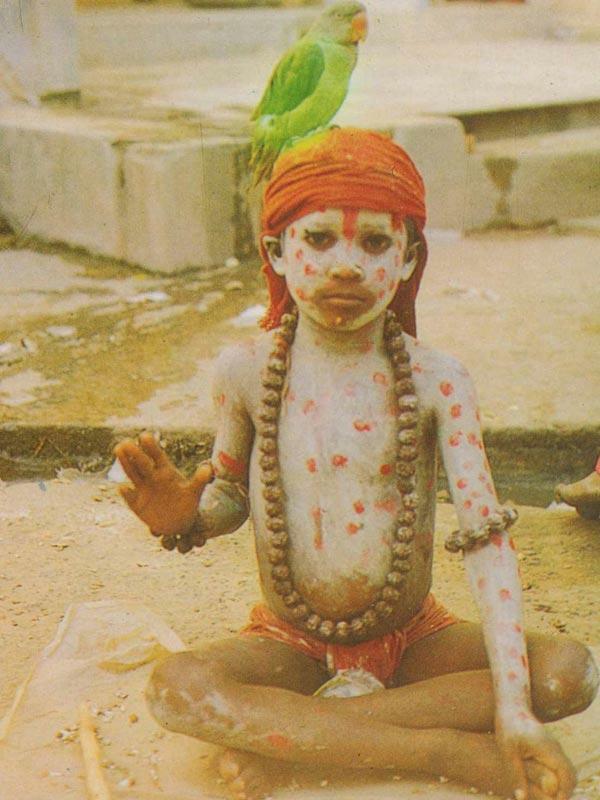 Many sadhus come from various holy places, the most remote forests, and mountain caves in the Himalayas. 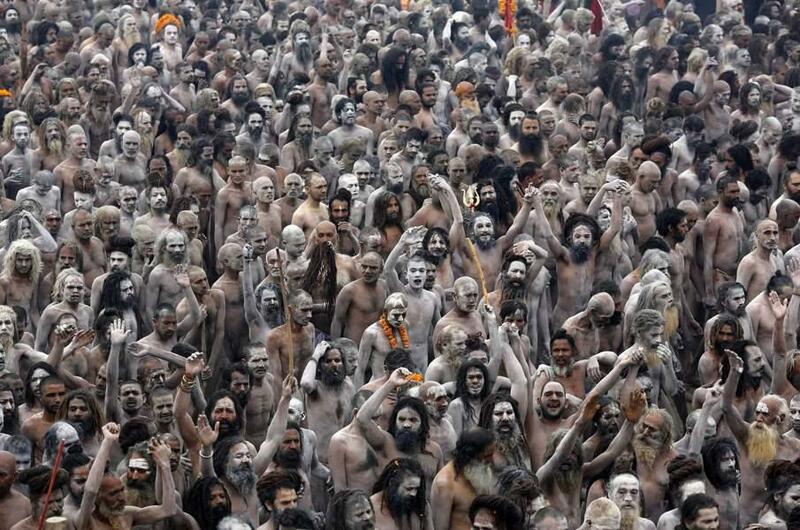 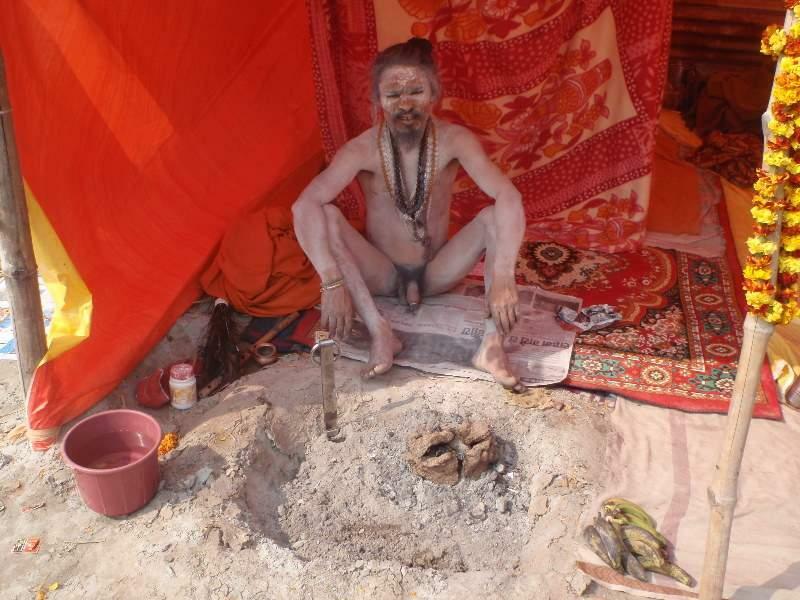 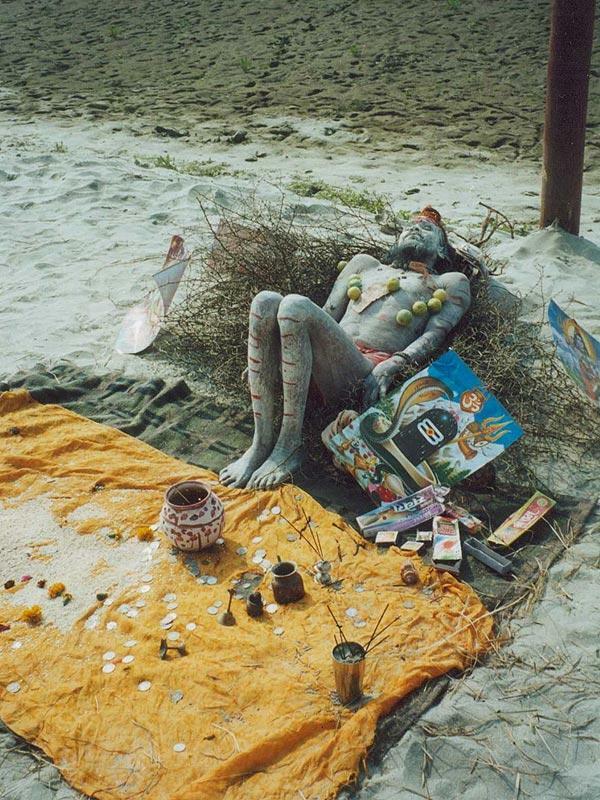 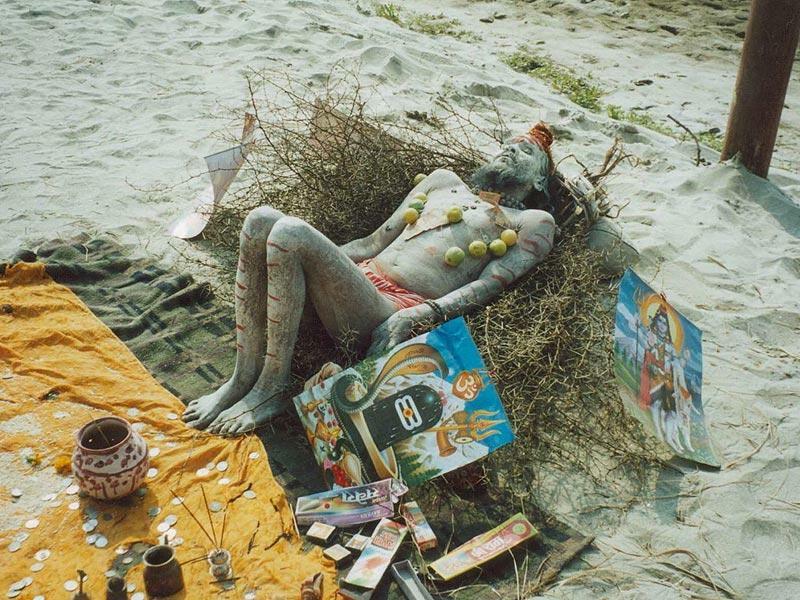 The most famous are the Naga Babas, Siva worshipers who are completely naked. 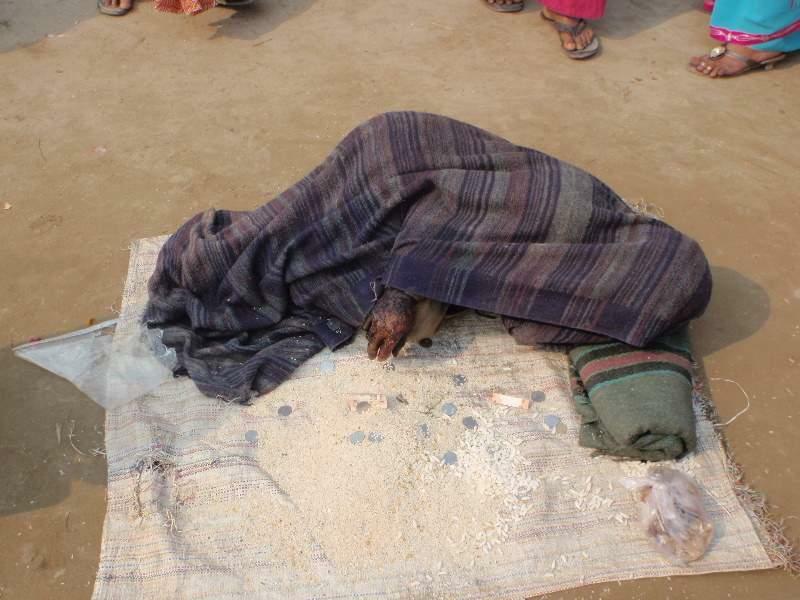 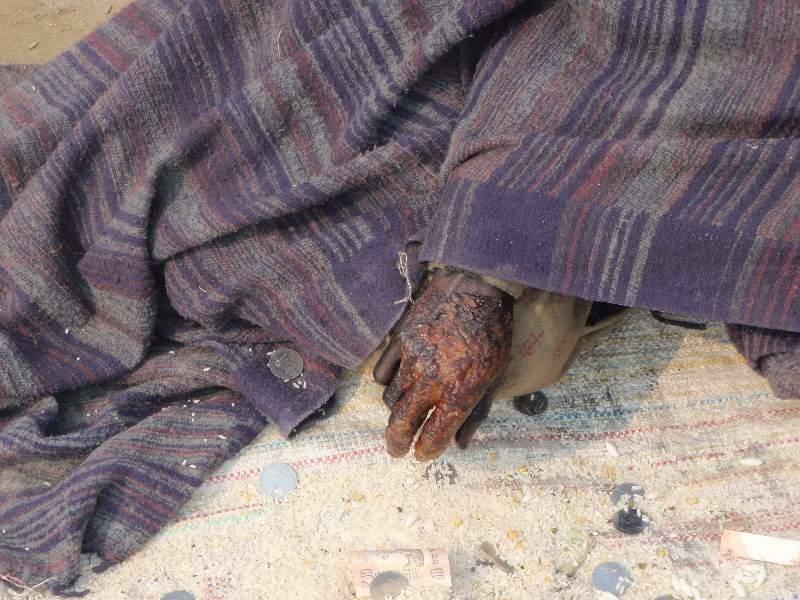 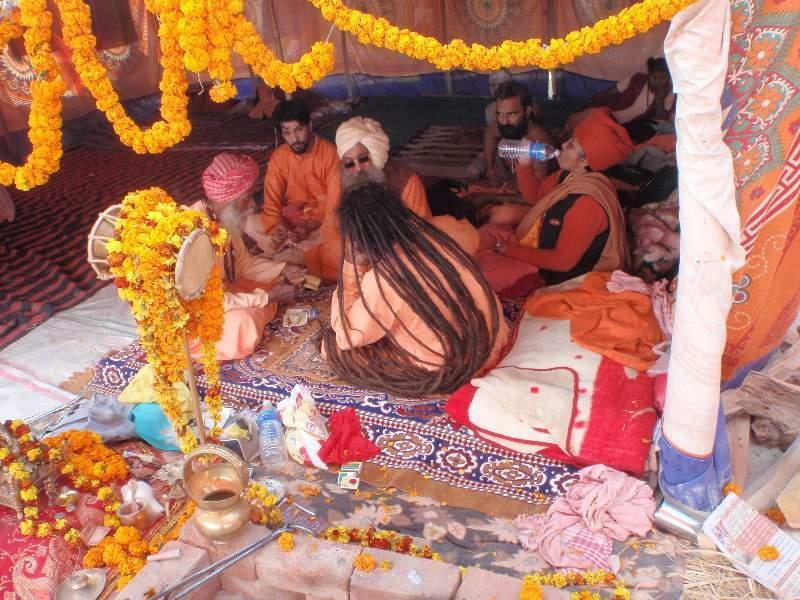 They cover their bodies only with ash and wear their hair in dreadlocks. 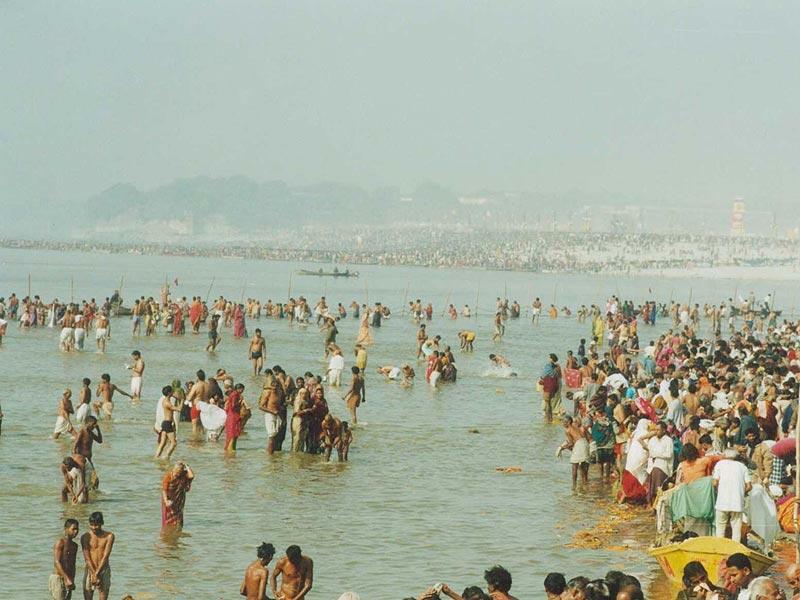 On the most auspicious bathing days there is a big parade, and the bathing order is very strictly observed. 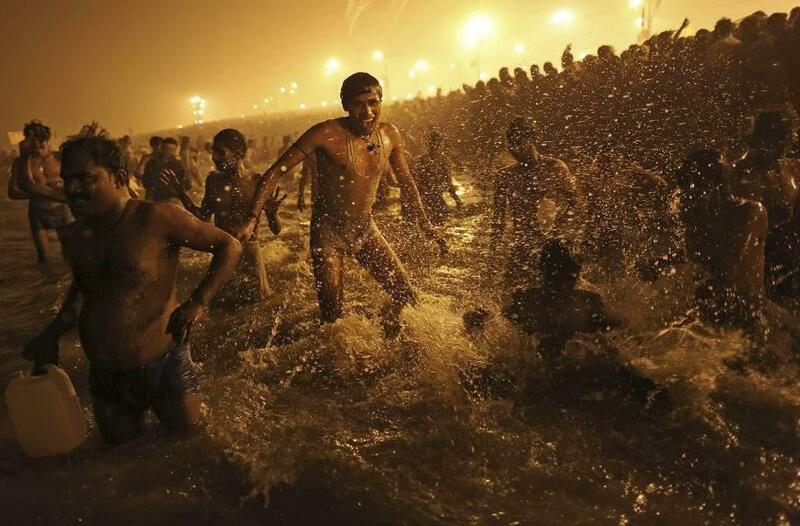 Not only are there especially auspicious days, but there are especially auspicious times of the day to bathe, and people are willing to die to bathe at the most auspicious time. 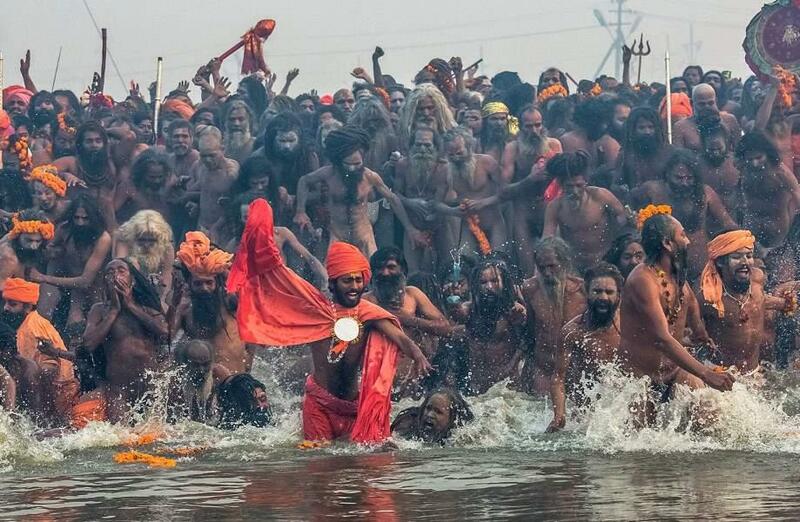 The first to enter the water are the Naga Babas, who arrive dancing with enthusiasm. 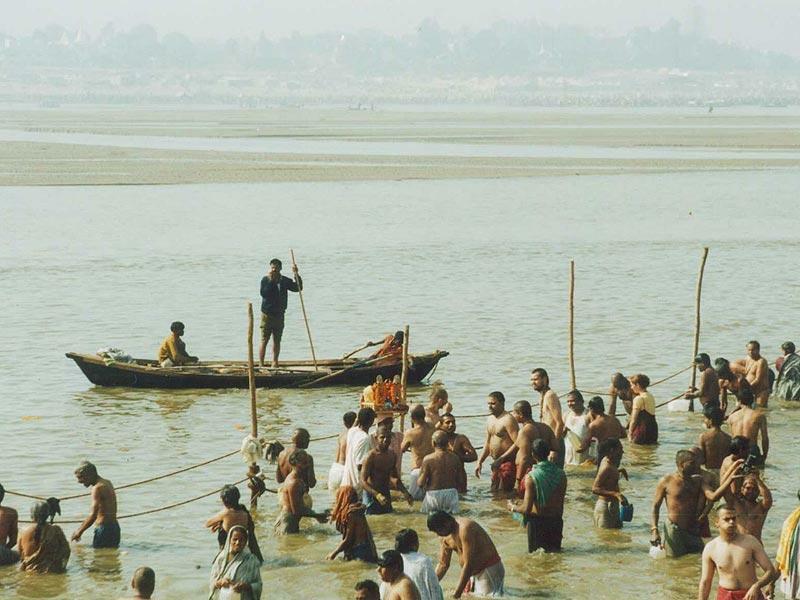 Then each different religious group enters the water in a prearranged order. 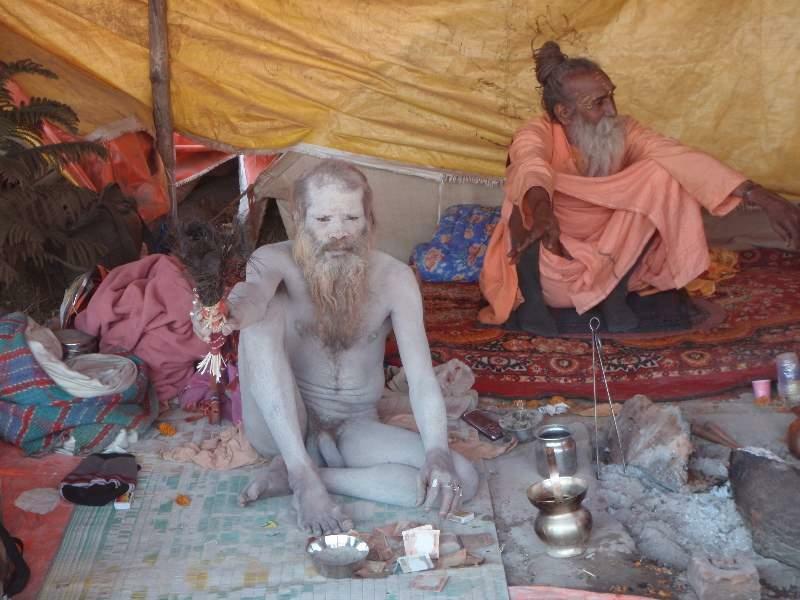 One large and prominent Shaiva sect consists of the 'warrior ascetics', or Nagas , who have existed since the prehistoric past. 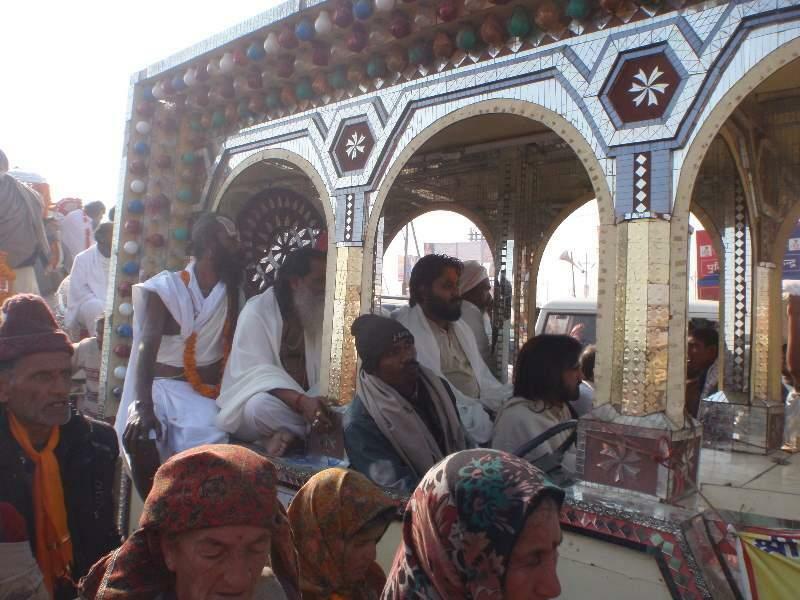 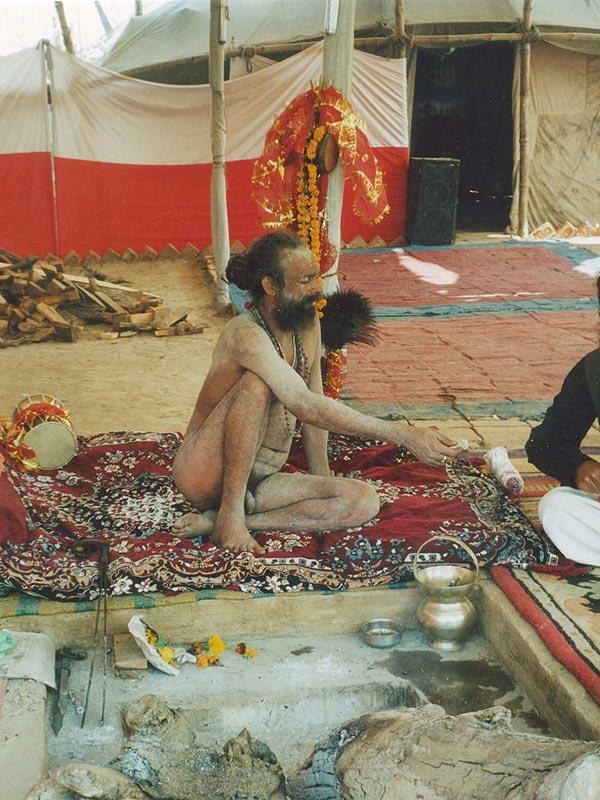 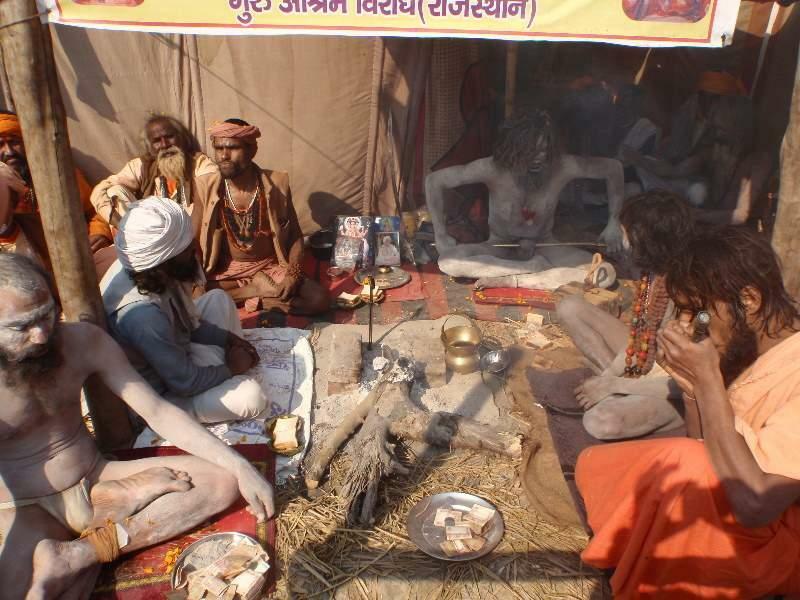 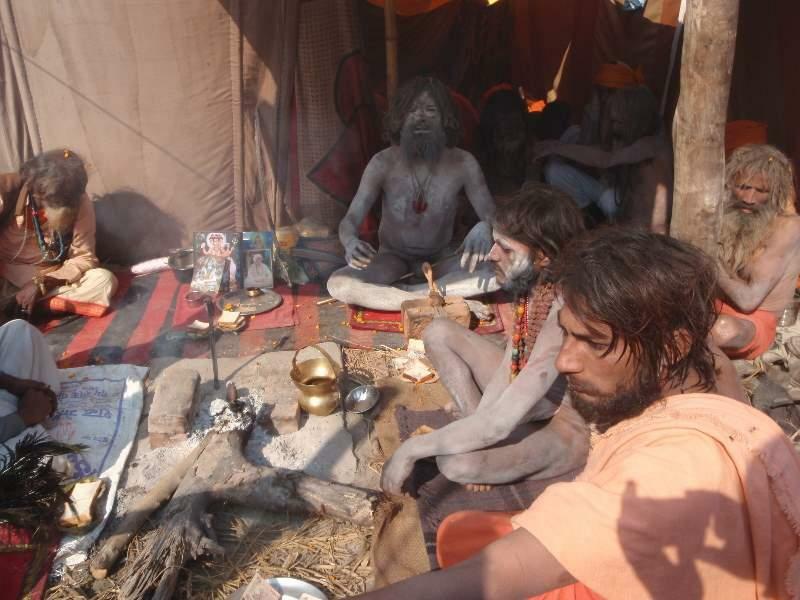 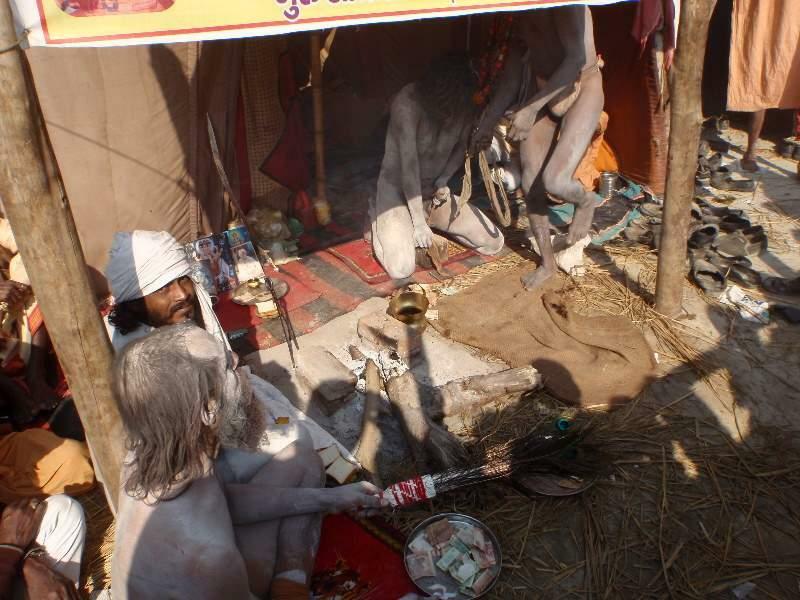 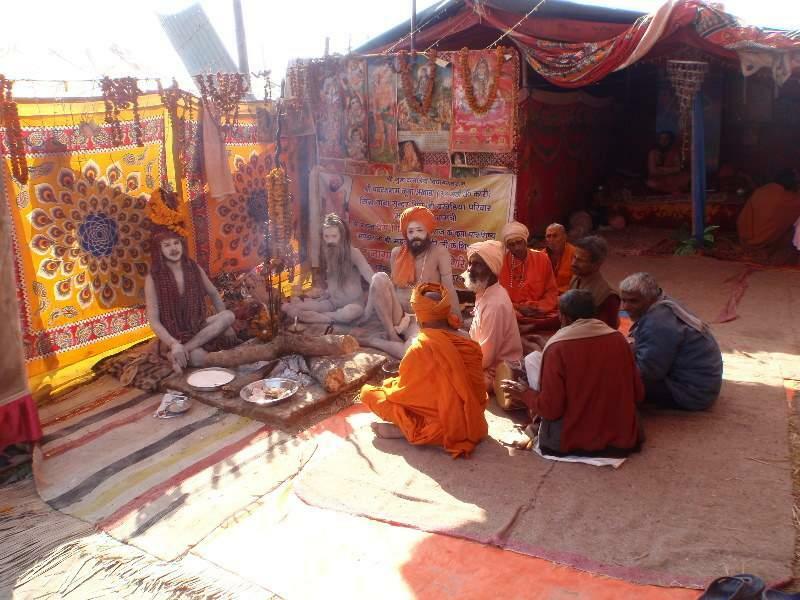 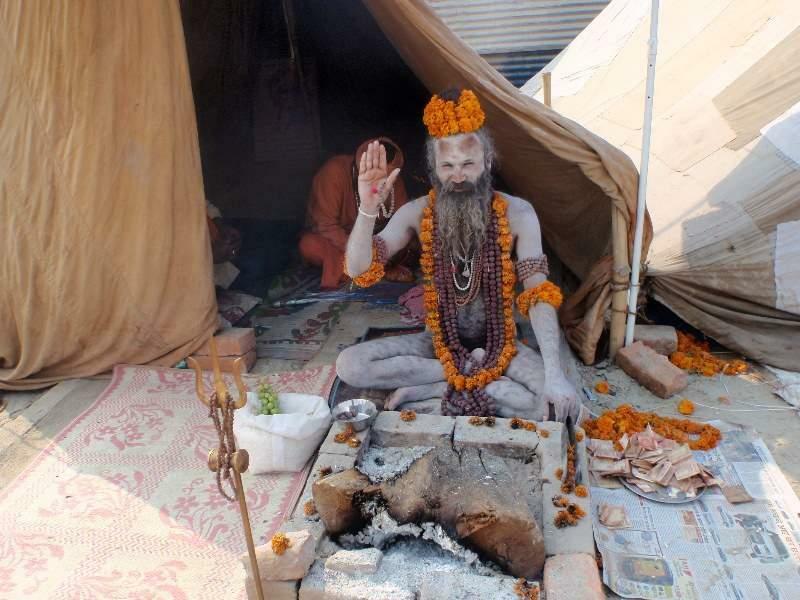 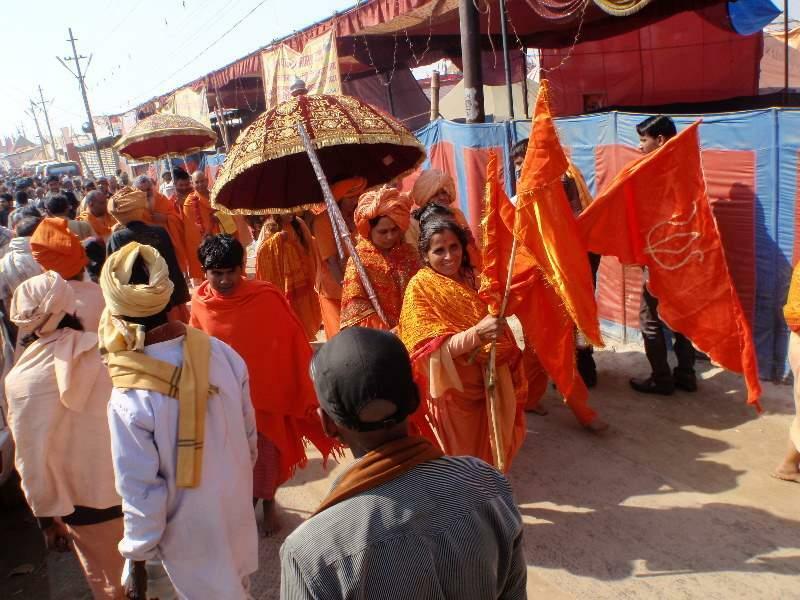 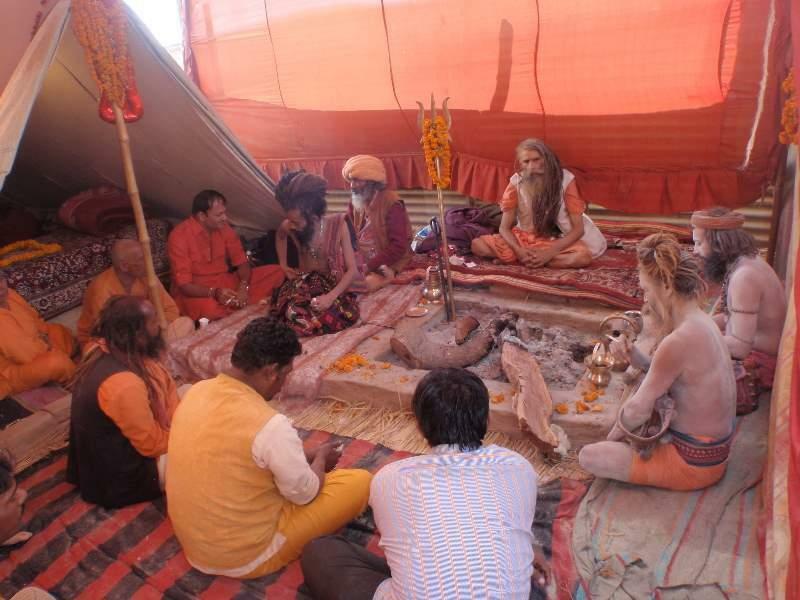 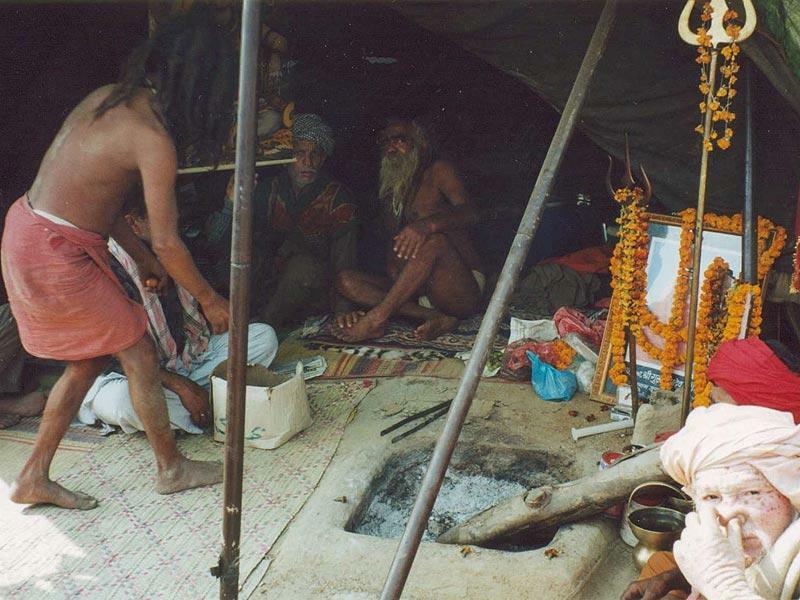 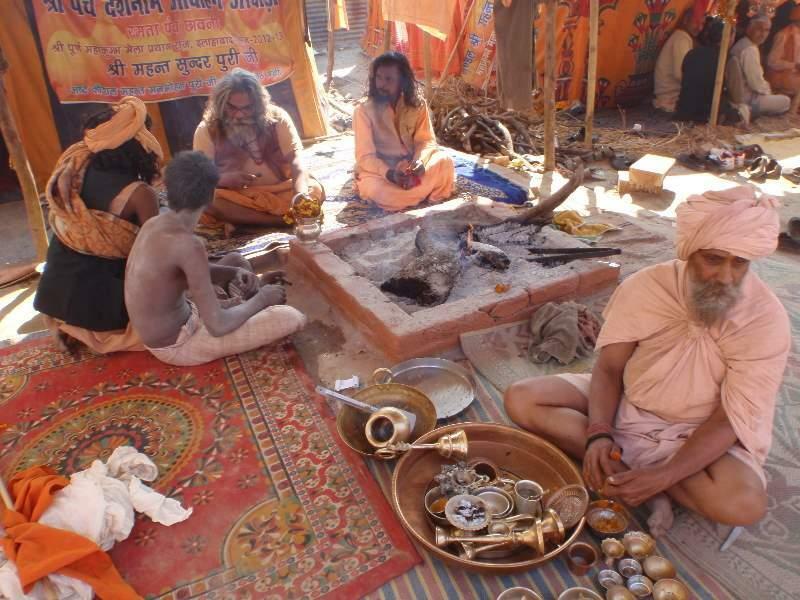 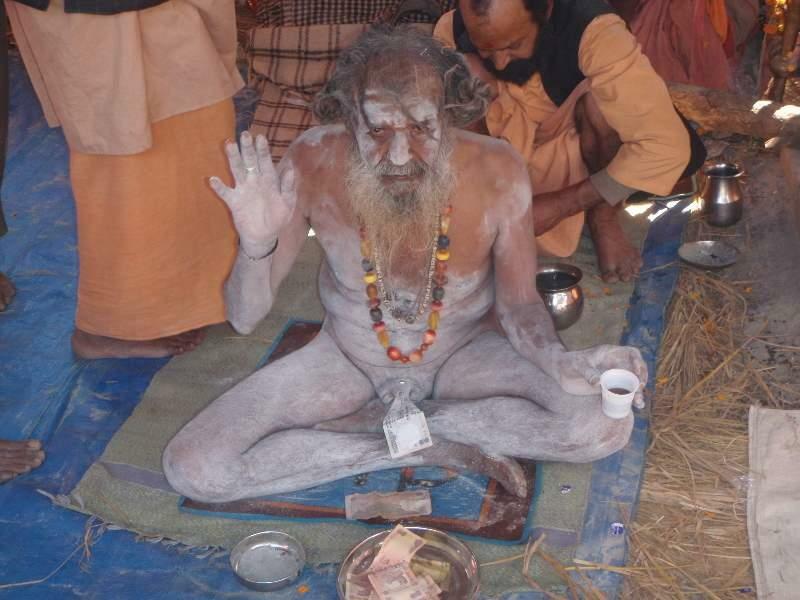 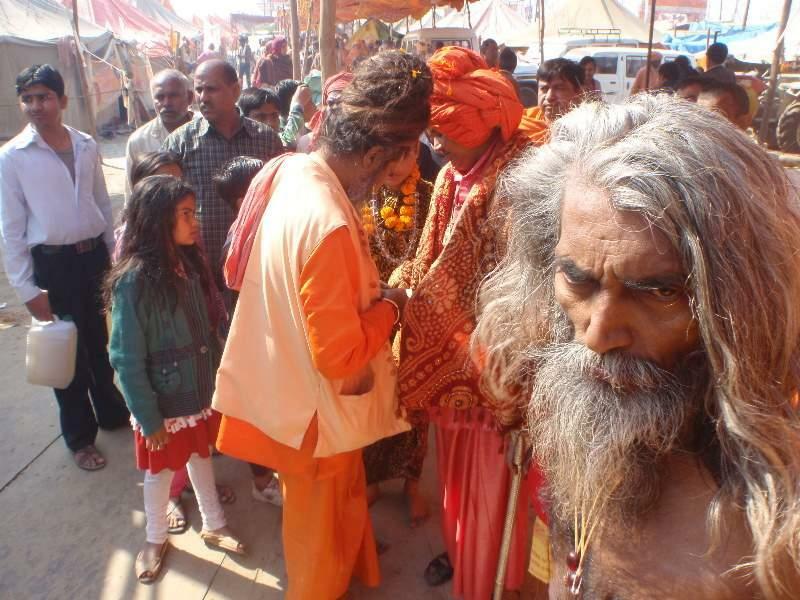 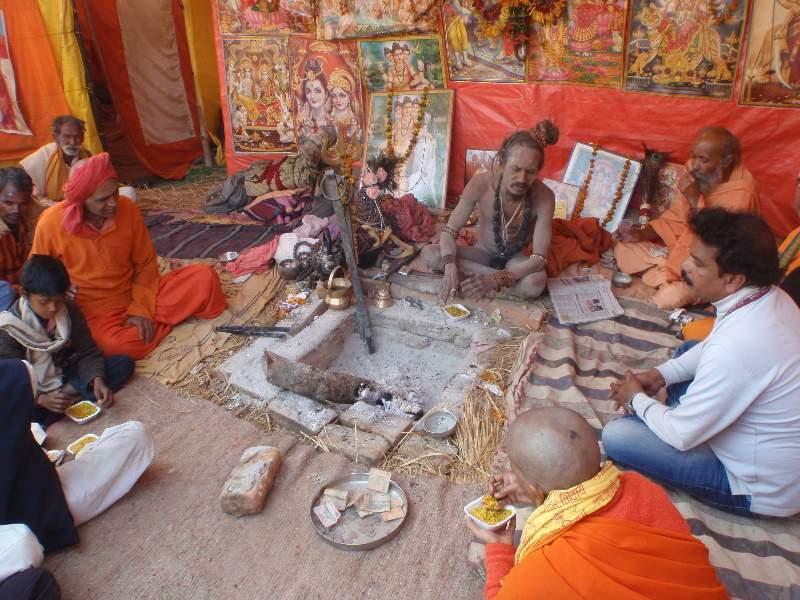 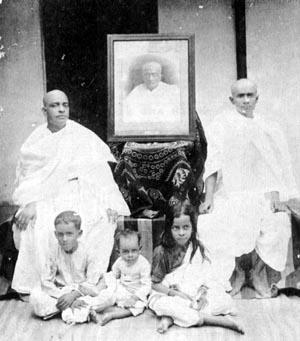 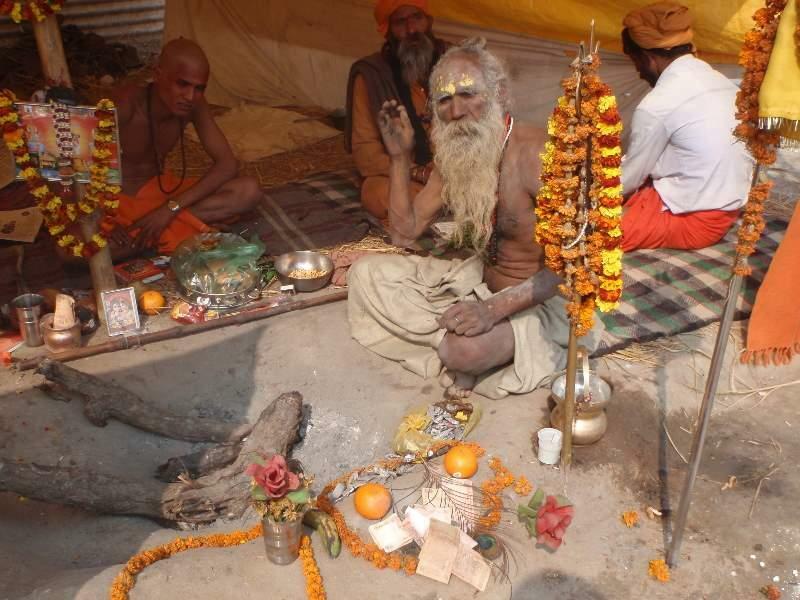 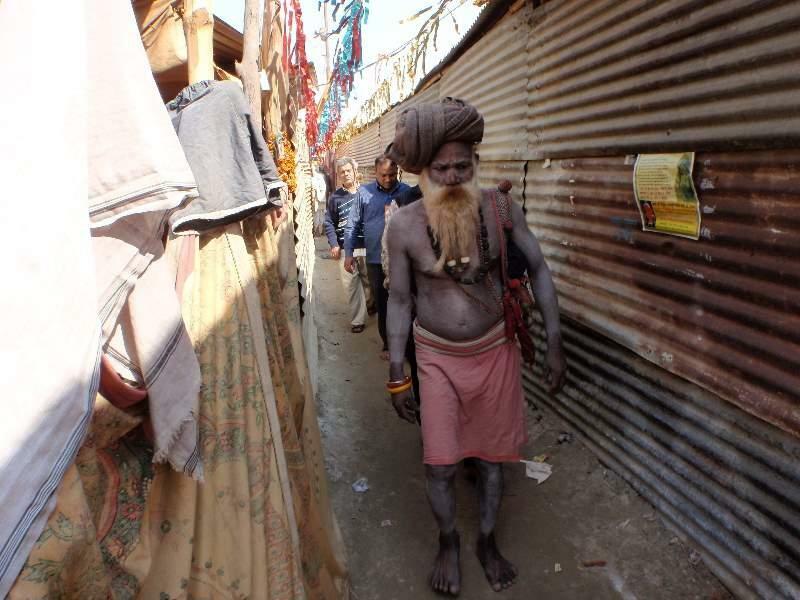 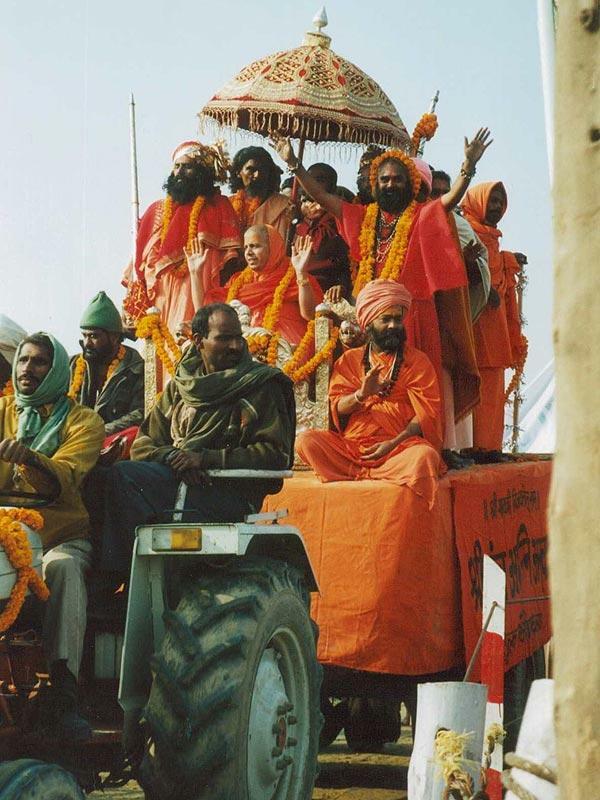 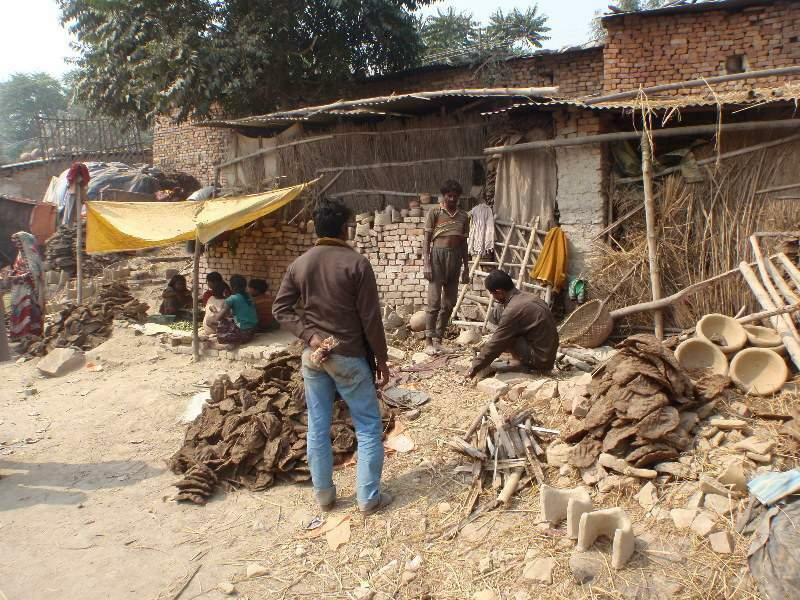 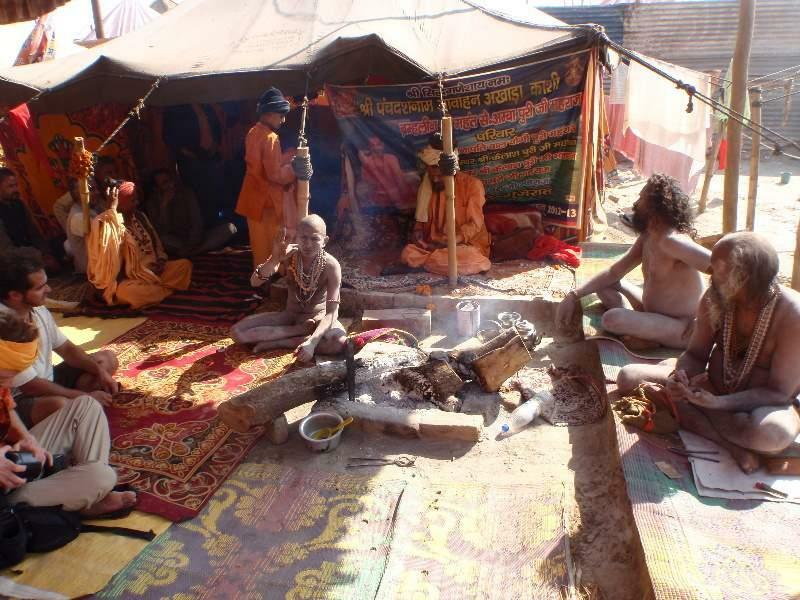 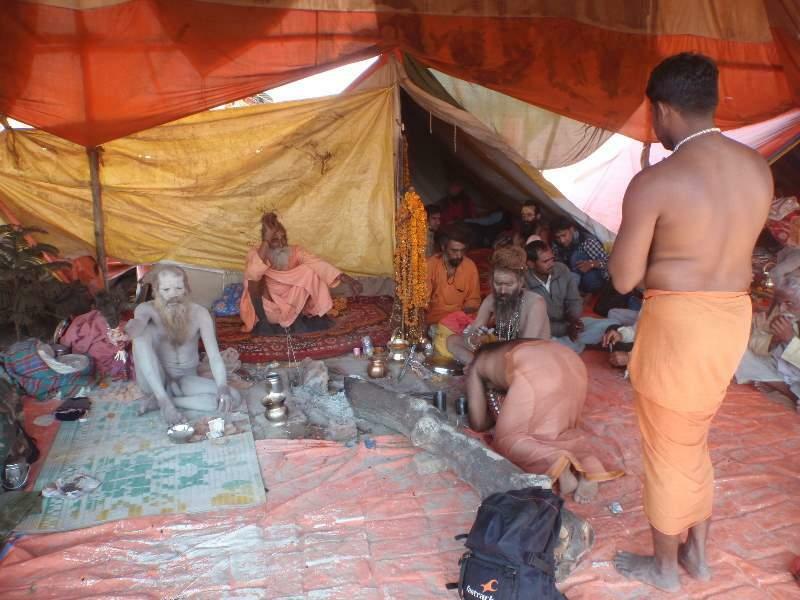 Though sadhus in general can de characterized as peace-loving, the Nagas used to be extremely militant, fighting with rivalling sects, the Muslims and later even the British. 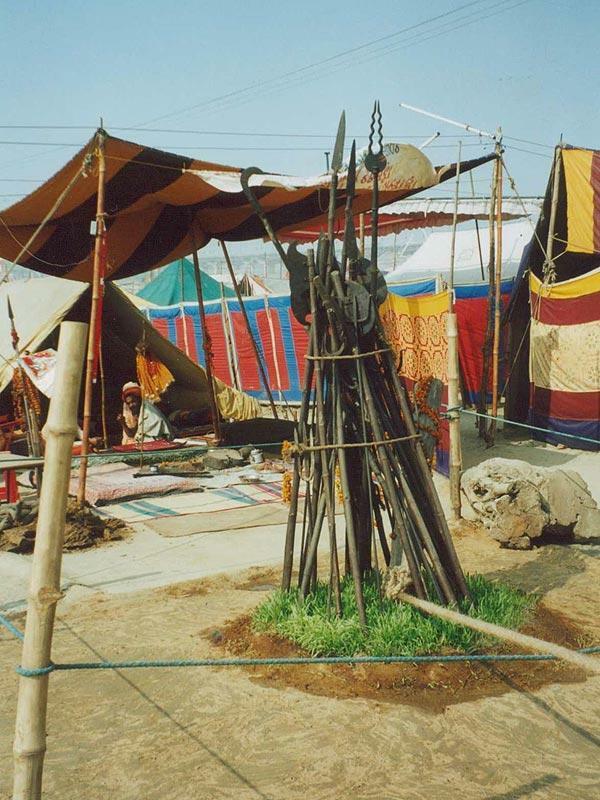 They were excellent fighters for they had no fear of death. 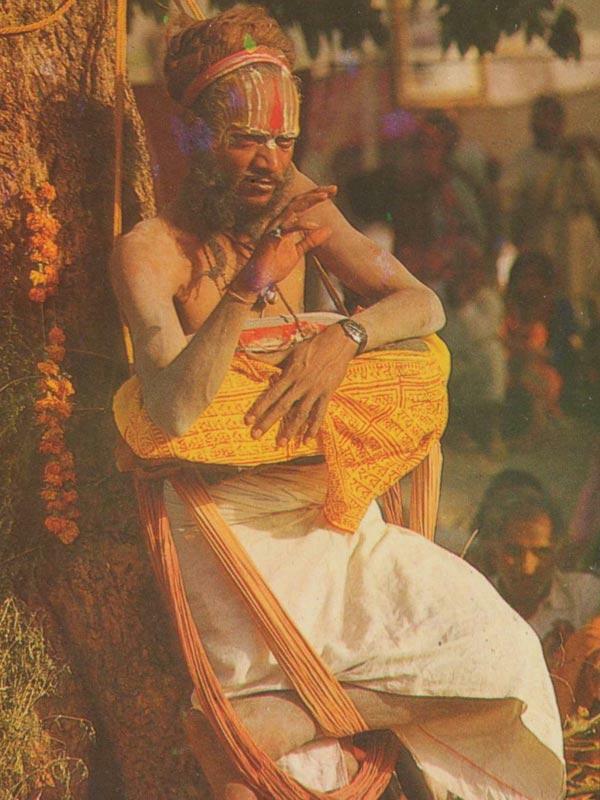 Traces of this 'macho' attitude are still discernible today. 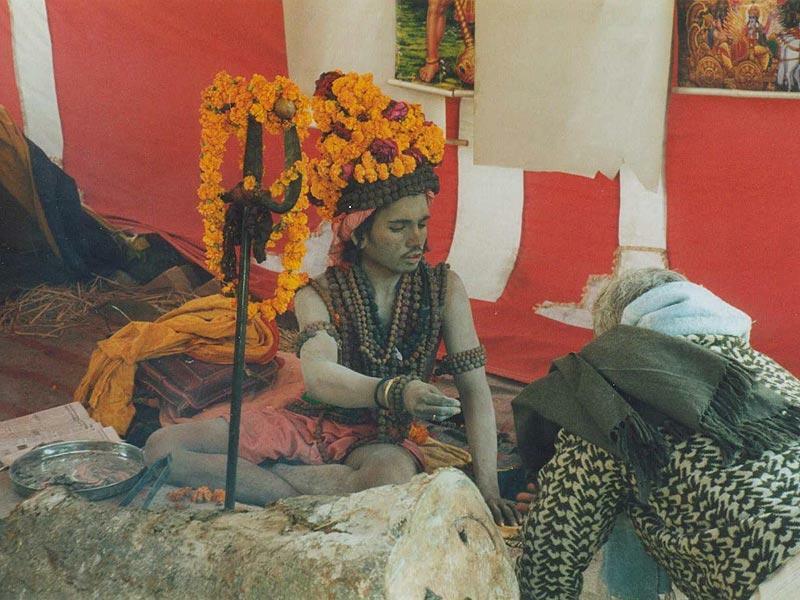 The Naga sect is subdivided into Akharas, i.e. 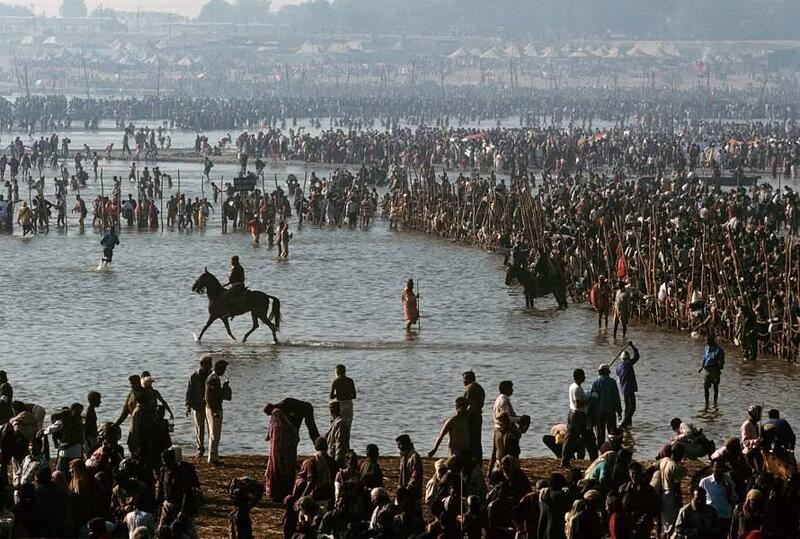 'regiments', like an army. 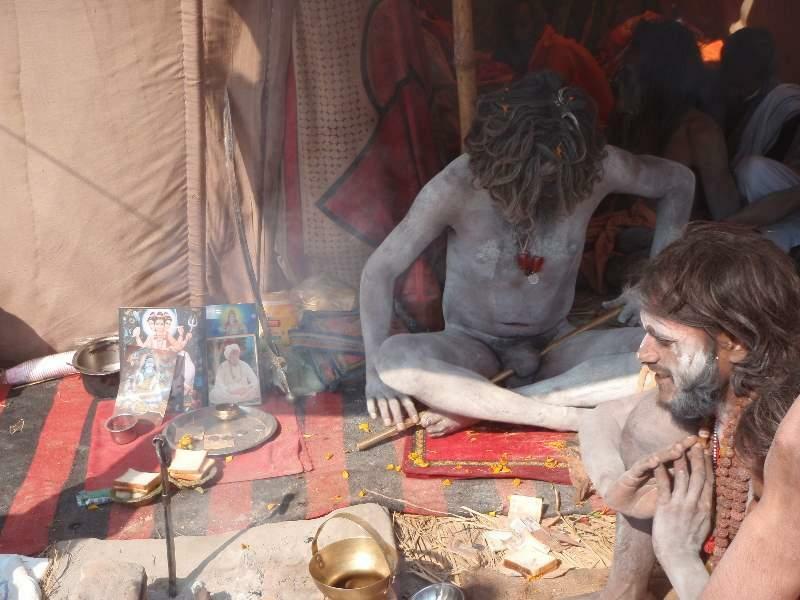 The identification feature of Naga Sadhus include being naked with long hairs knotted with different metals and body smeared with ashes. 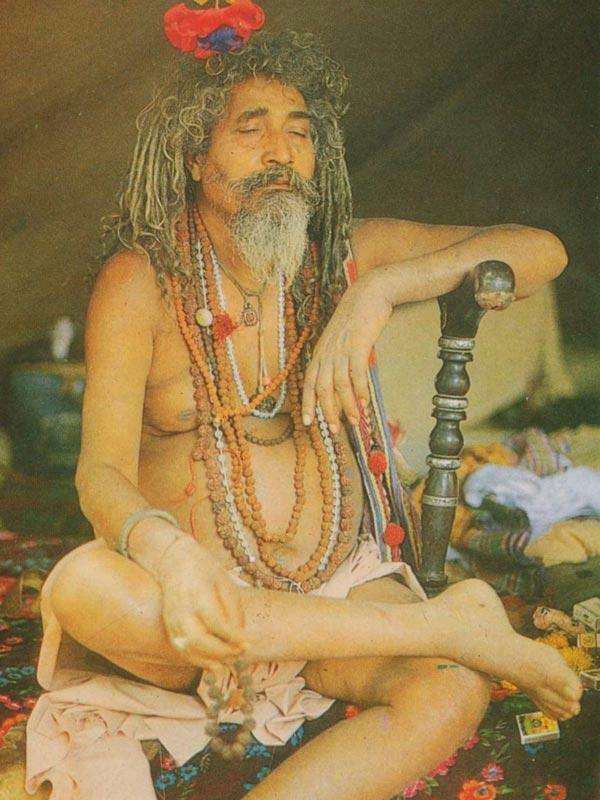 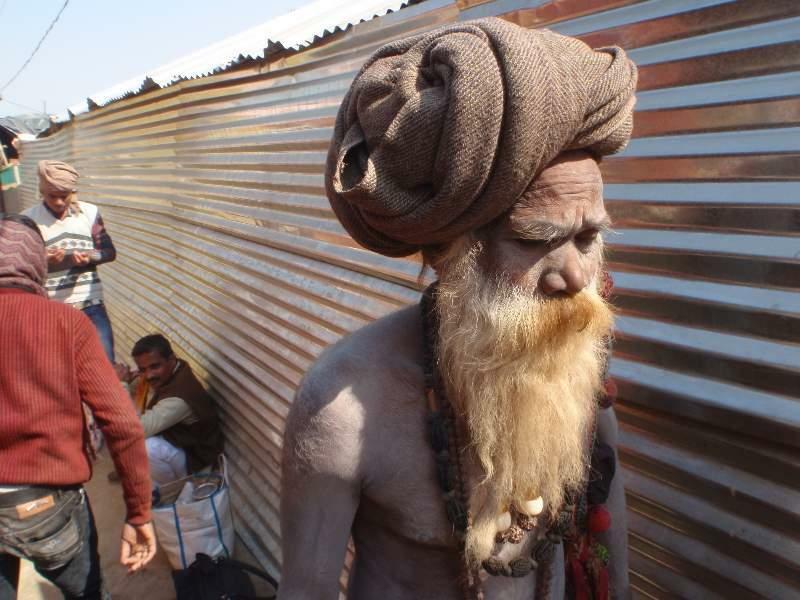 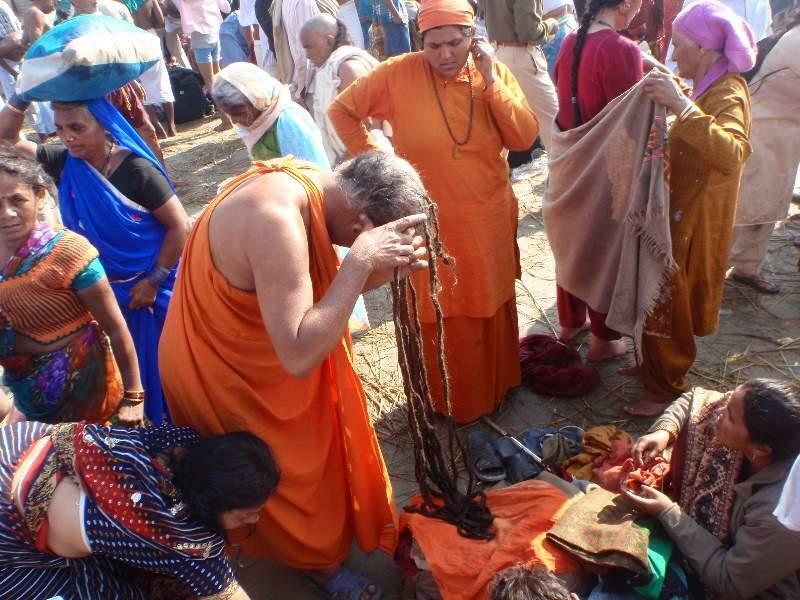 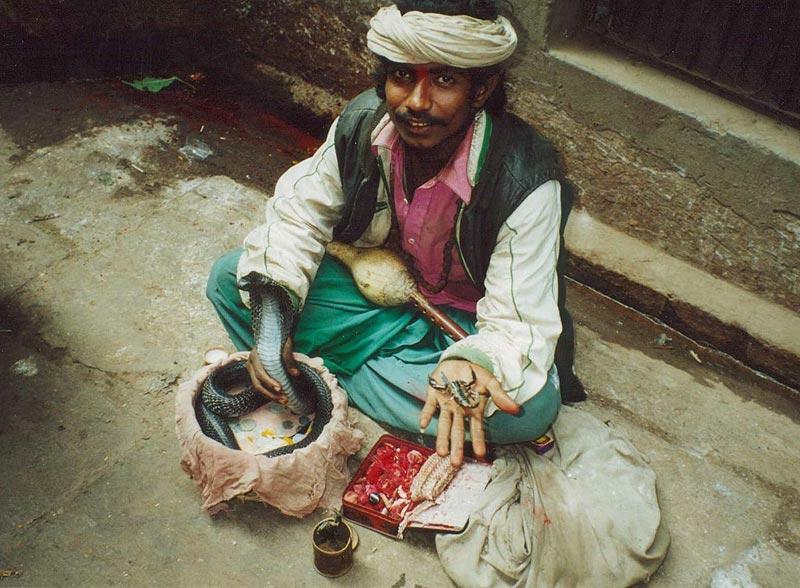 Not only this, one can see Naga Sadhus could be seen wearing beads of Rudraksha, believe to posses positive healing power according to Hindu mythology. 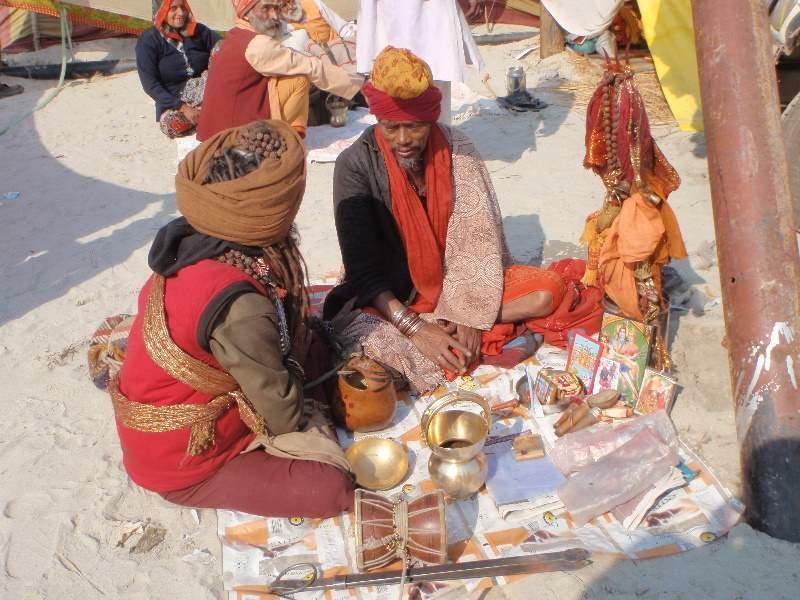 Not just a few but you can witness Naga sadhus wearing thousand of Rudraksha beads and is believed that wearing Eleven thousand Rudrakhsa beads will help them attain the form of Lord Shankara or Lord Shiva.